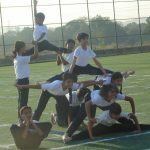 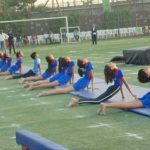 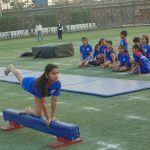 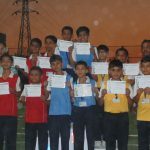 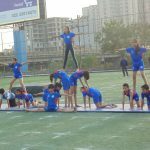 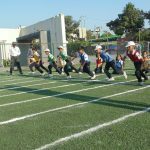 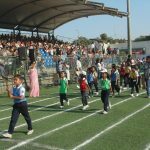 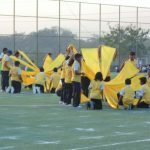 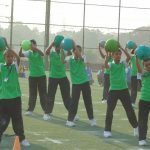 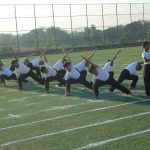 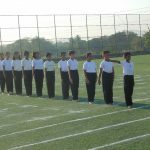 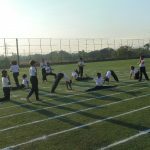 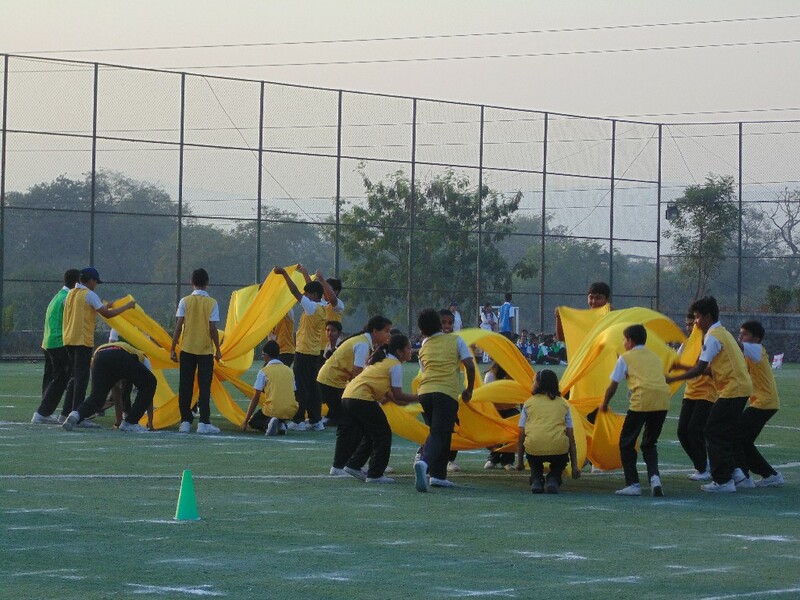 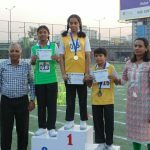 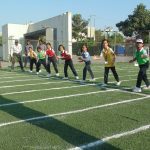 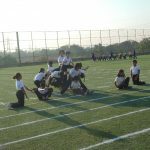 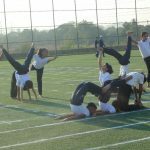 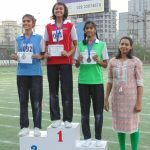 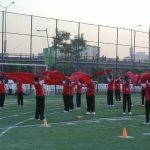 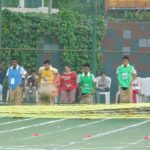 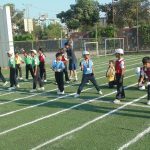 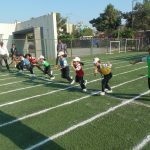 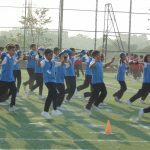 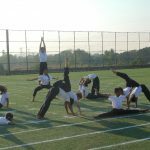 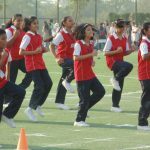 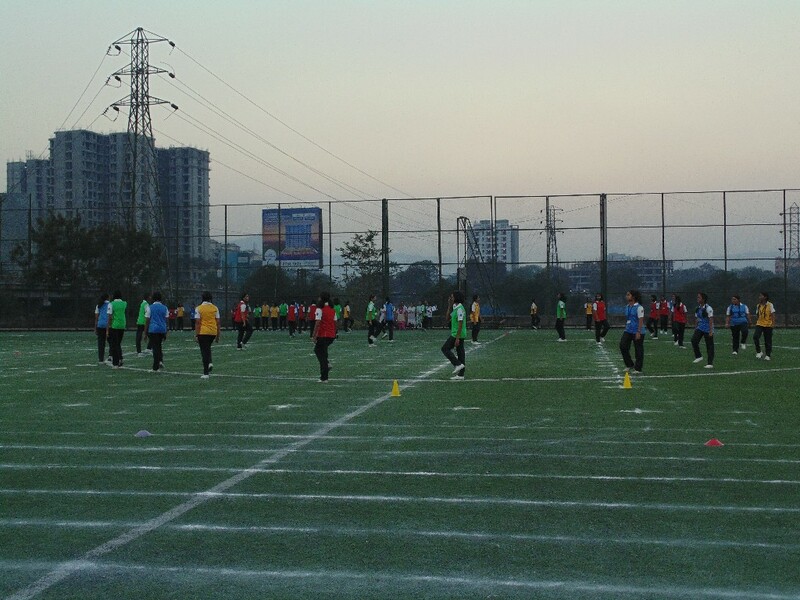 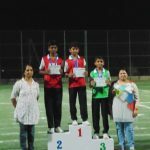 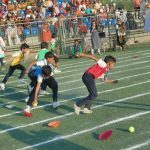 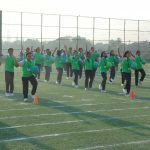 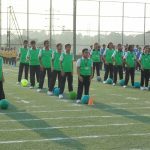 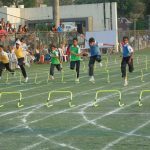 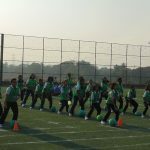 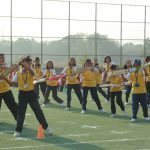 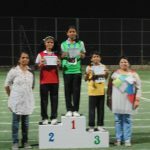 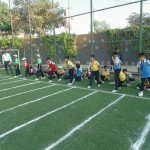 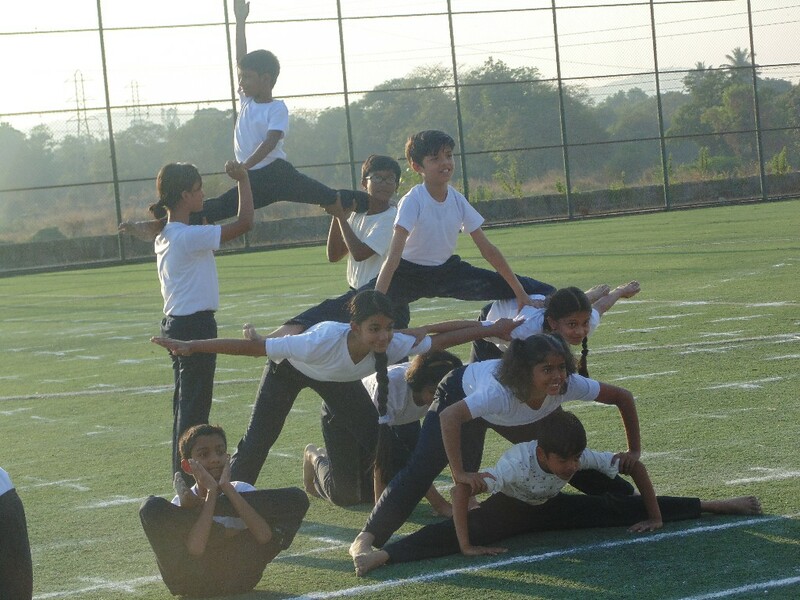 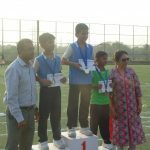 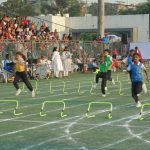 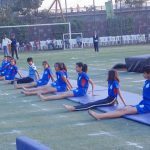 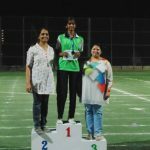 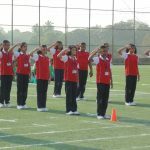 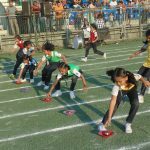 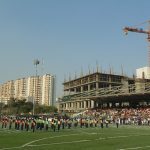 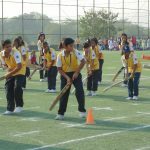 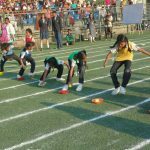 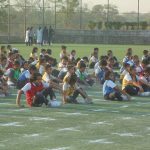 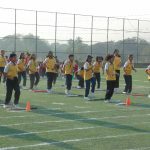 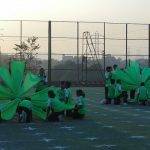 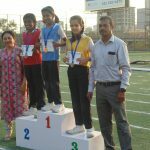 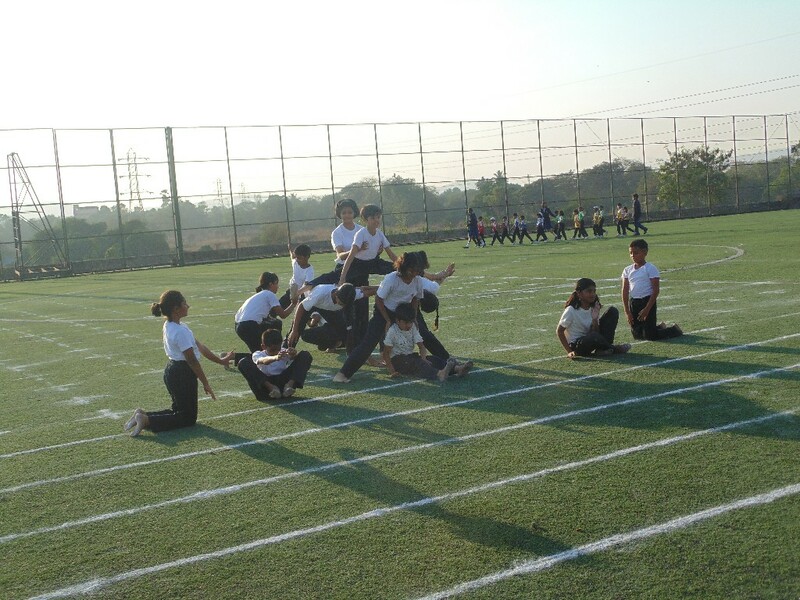 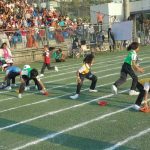 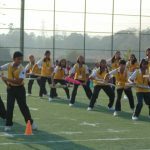 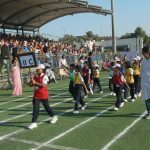 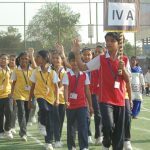 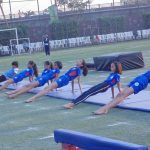 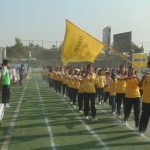 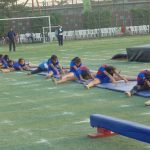 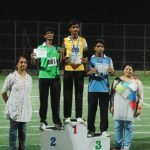 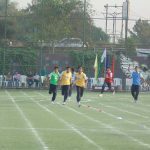 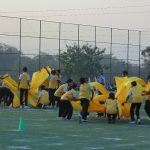 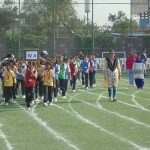 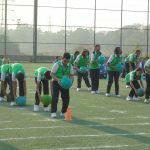 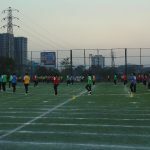 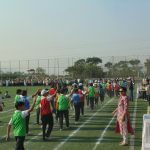 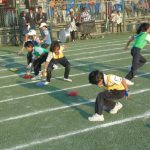 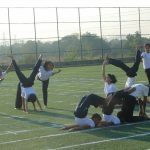 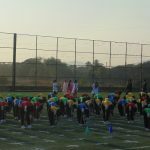 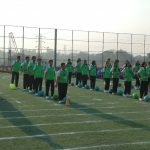 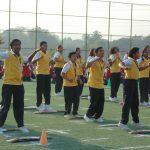 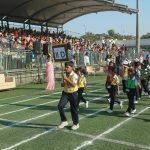 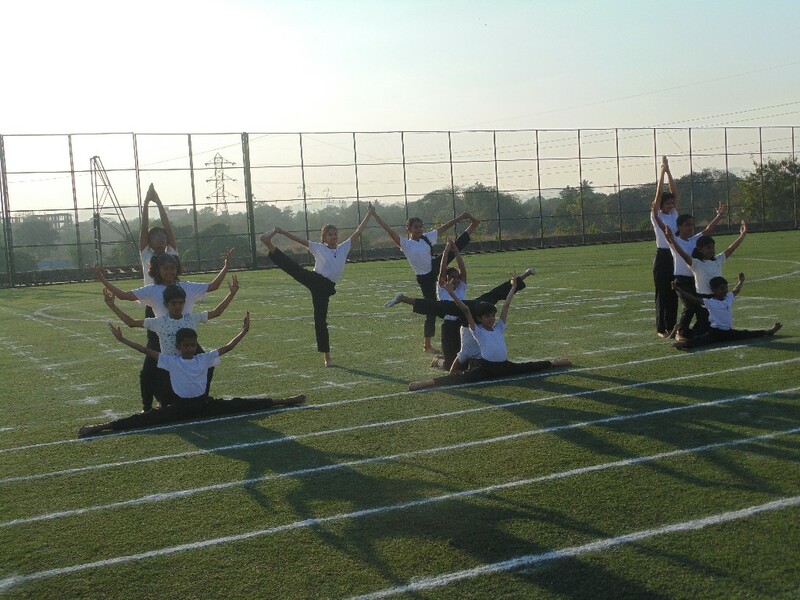 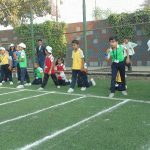 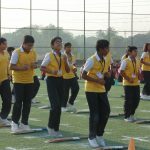 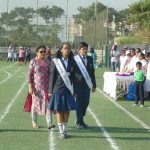 The Annual Sports Meet of Lodha World School, Palava was celebrated on 22nd of December, 2018 on Titan’s Turf in Palava. 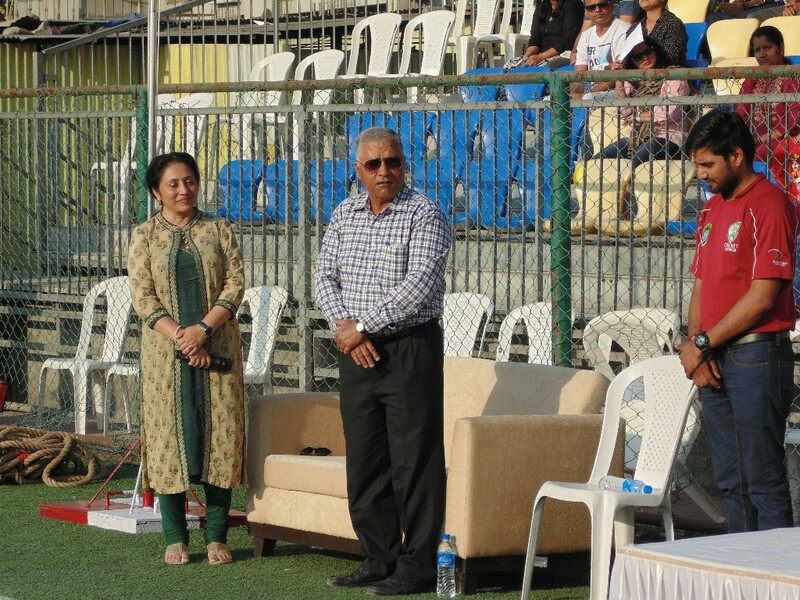 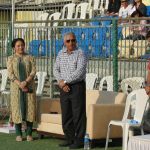 Mr. Suresh Shastri, former cricketer and presently an umpire was invited to be the Honourable Chief Guest for the day. 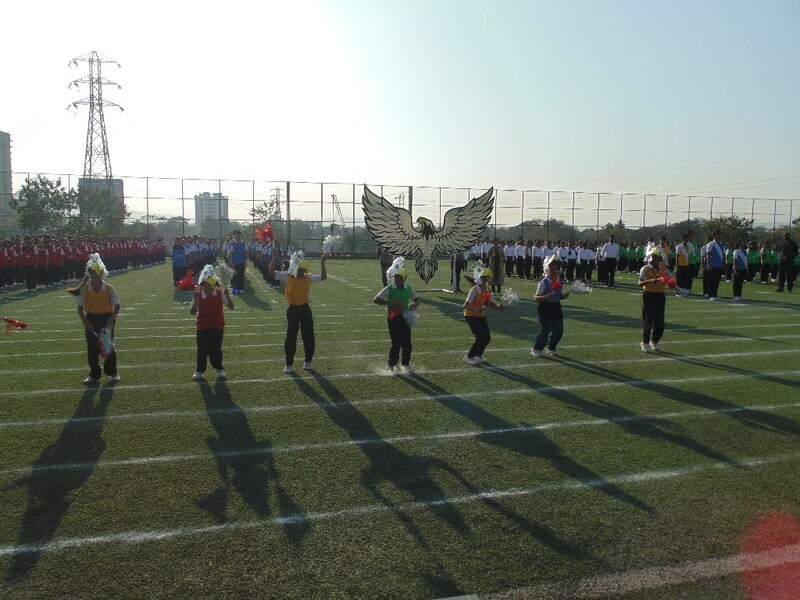 The evening began with the march of the four houses, namely Apollo, Zeus, Poseidon and Aeolus, facing off to lift the House Trophy at the end of the day. 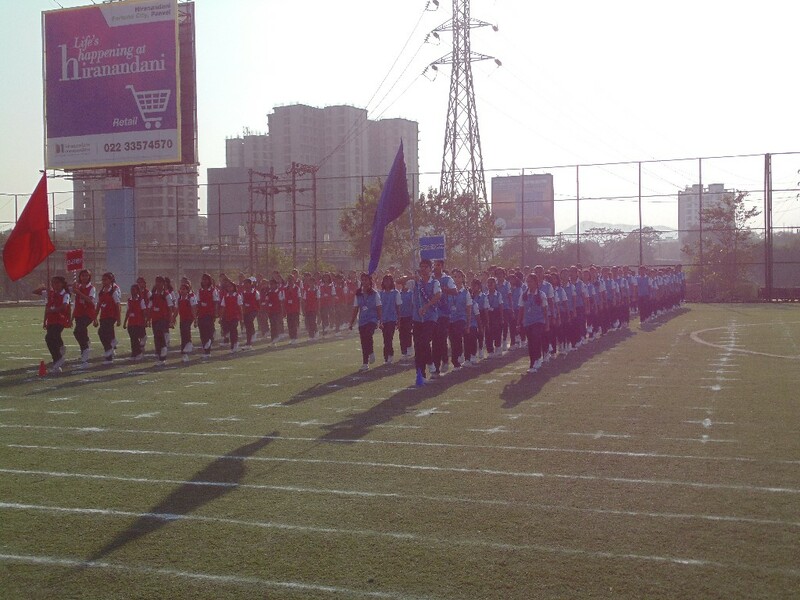 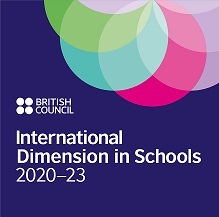 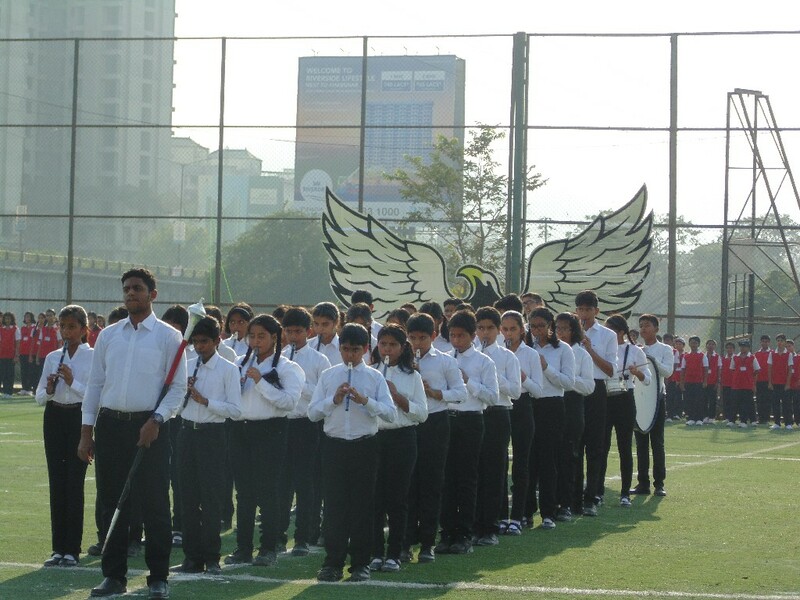 The discipline and the synchronization of the students performing the march past was commendable. 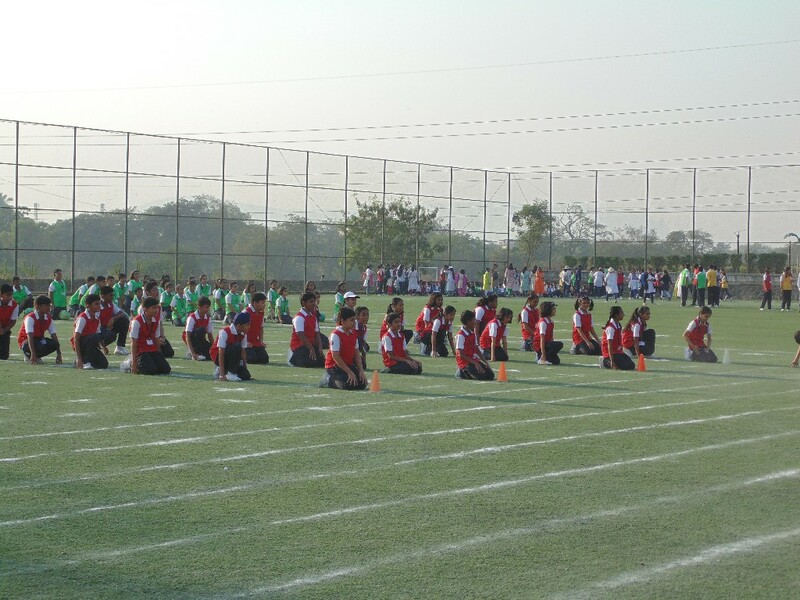 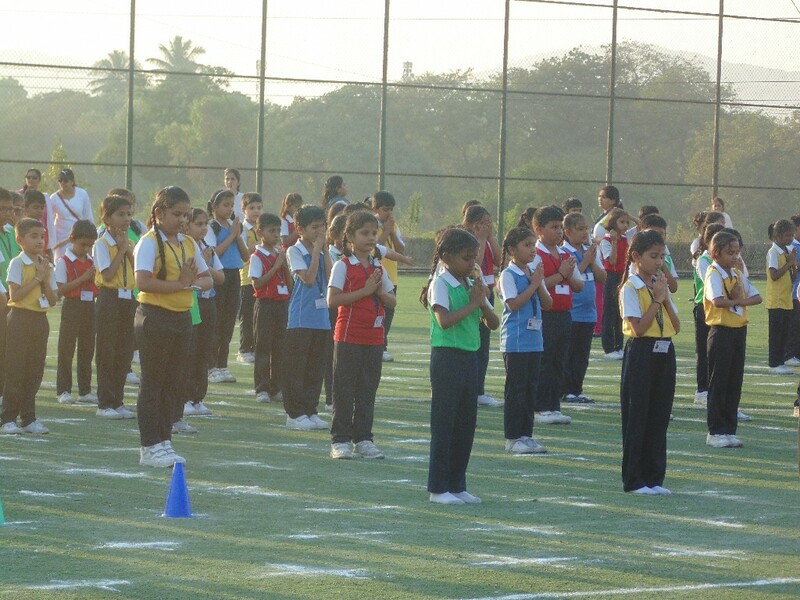 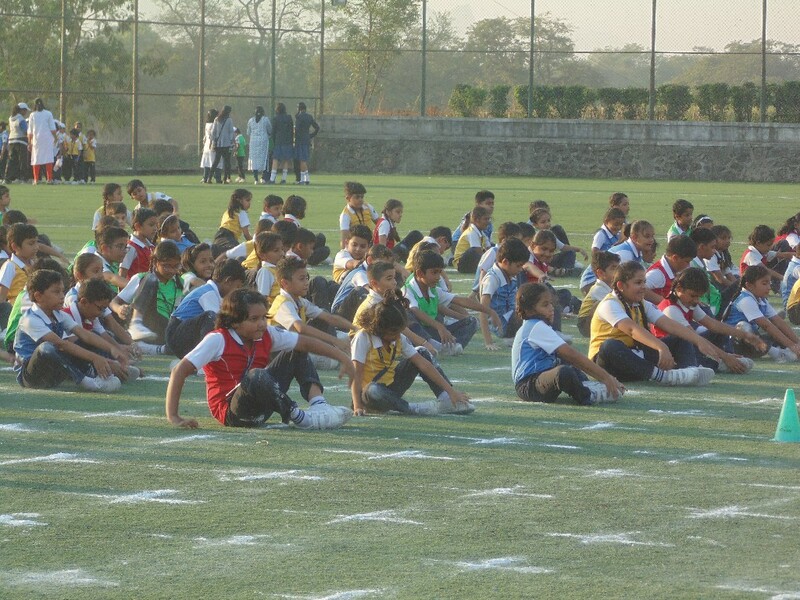 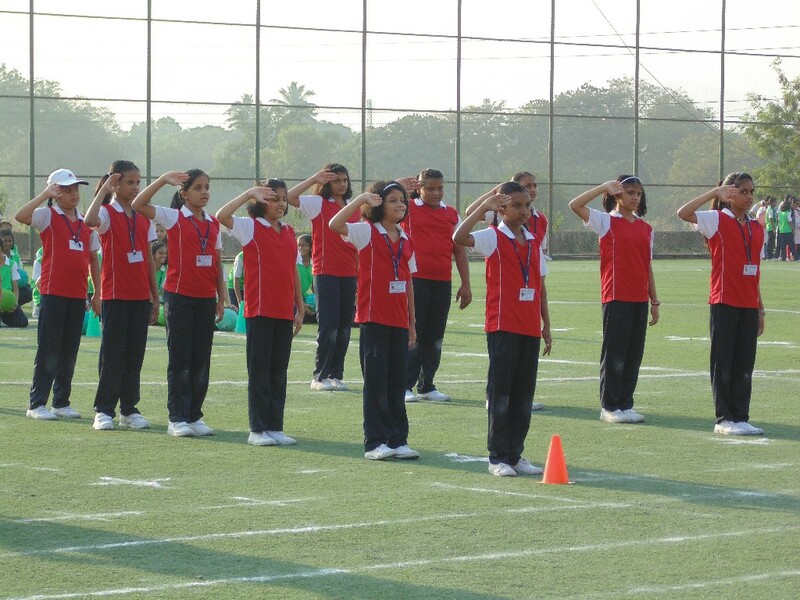 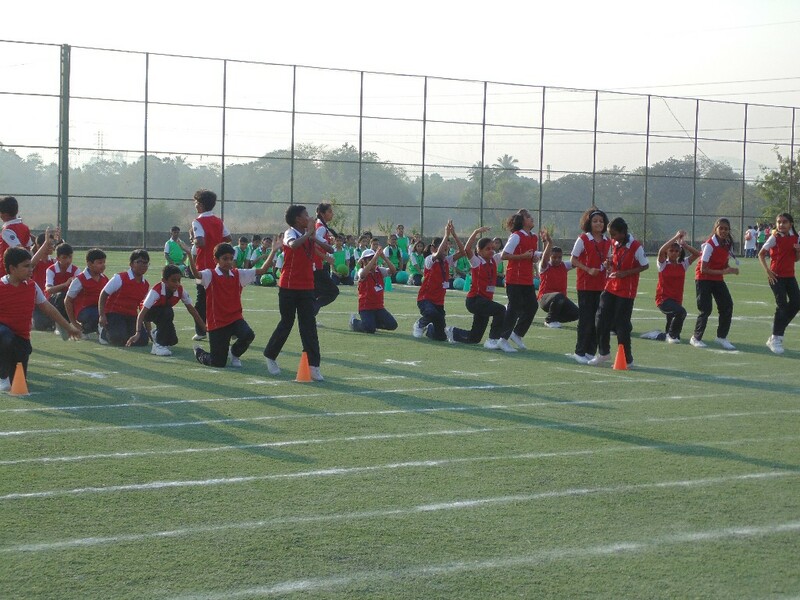 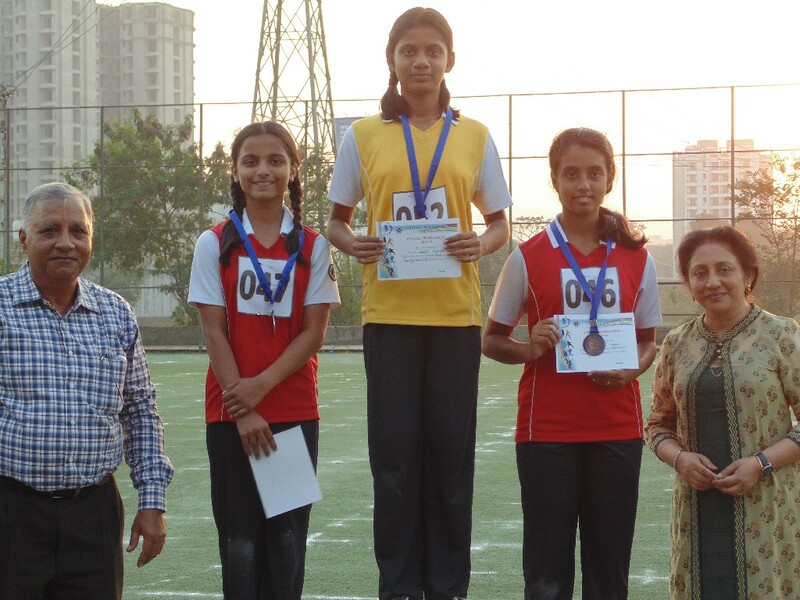 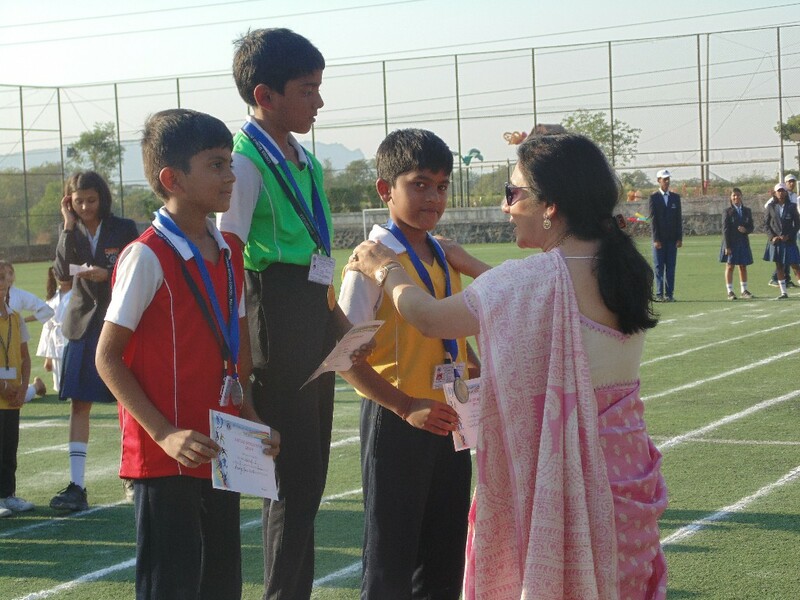 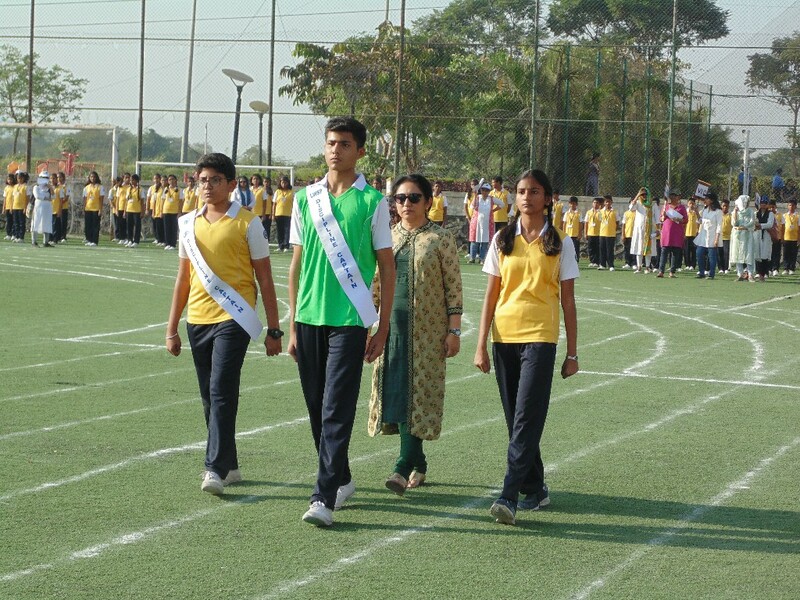 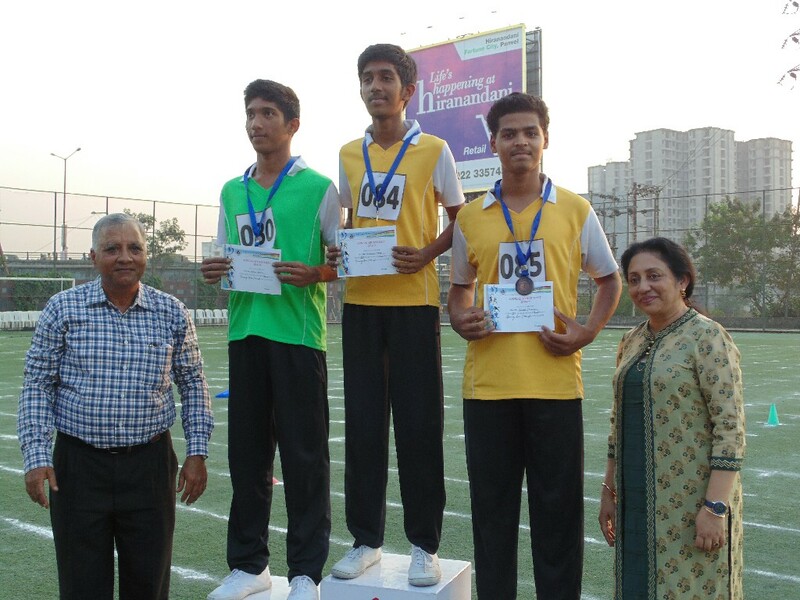 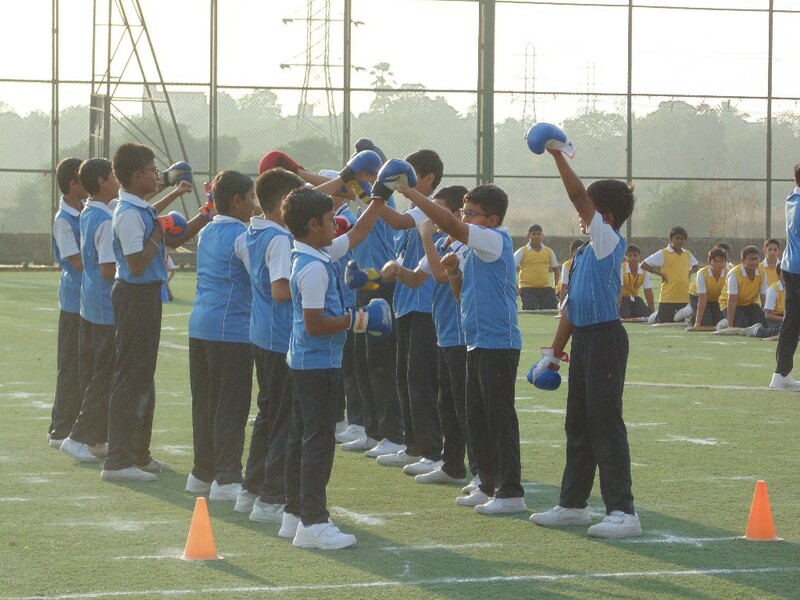 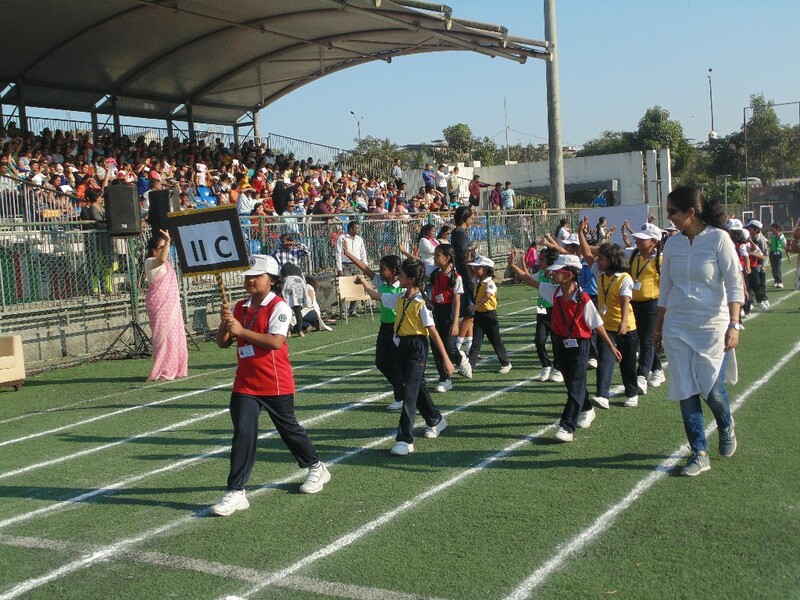 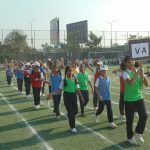 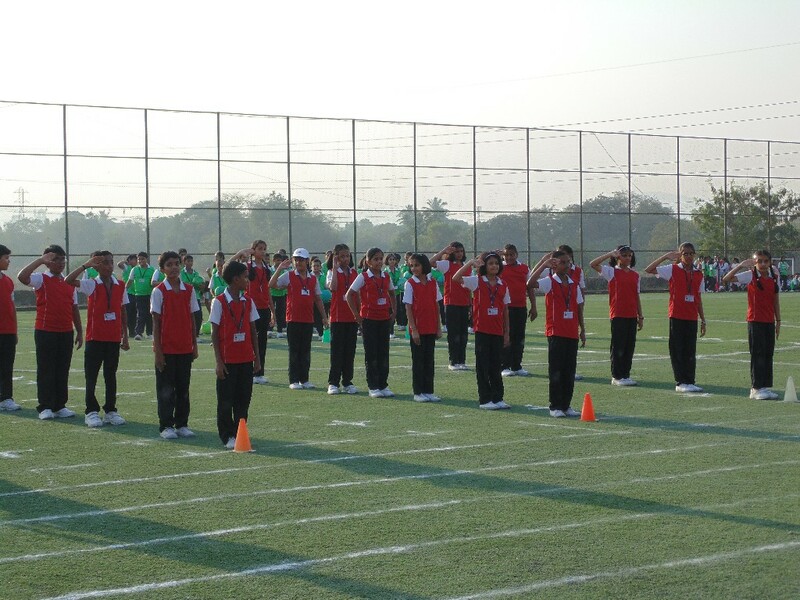 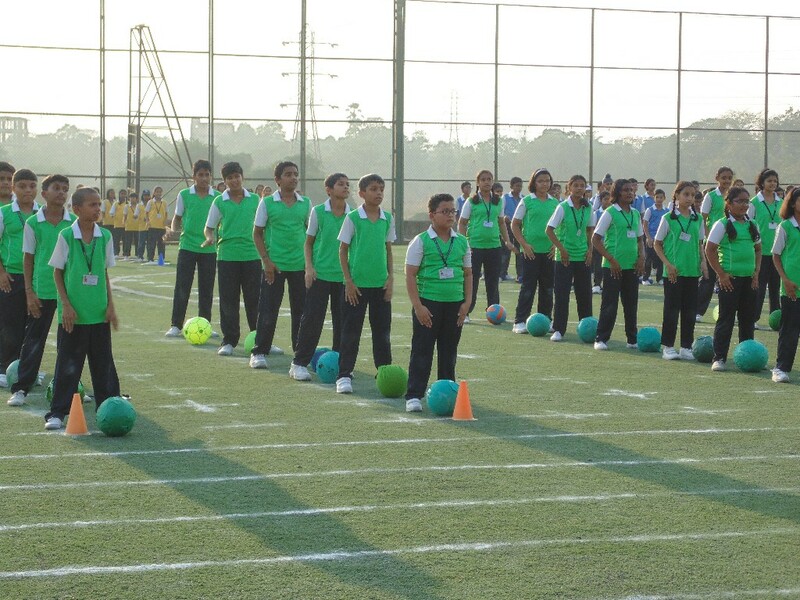 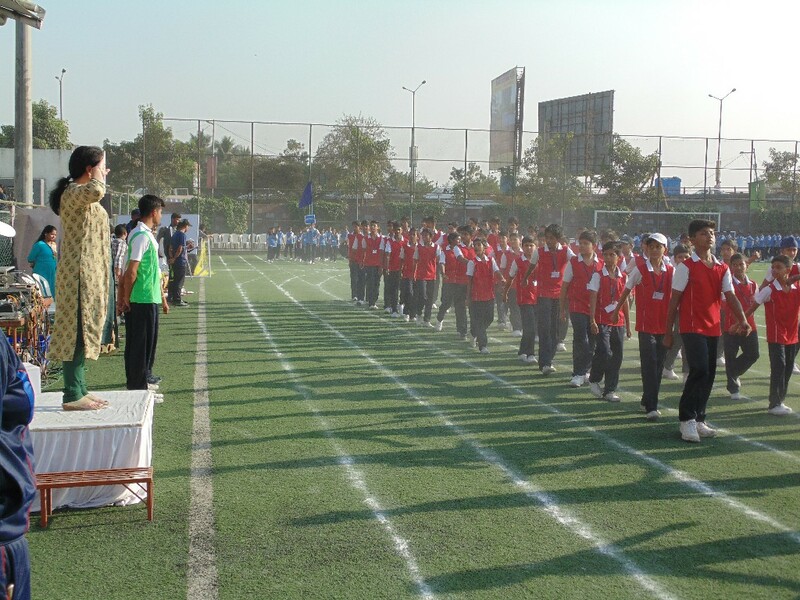 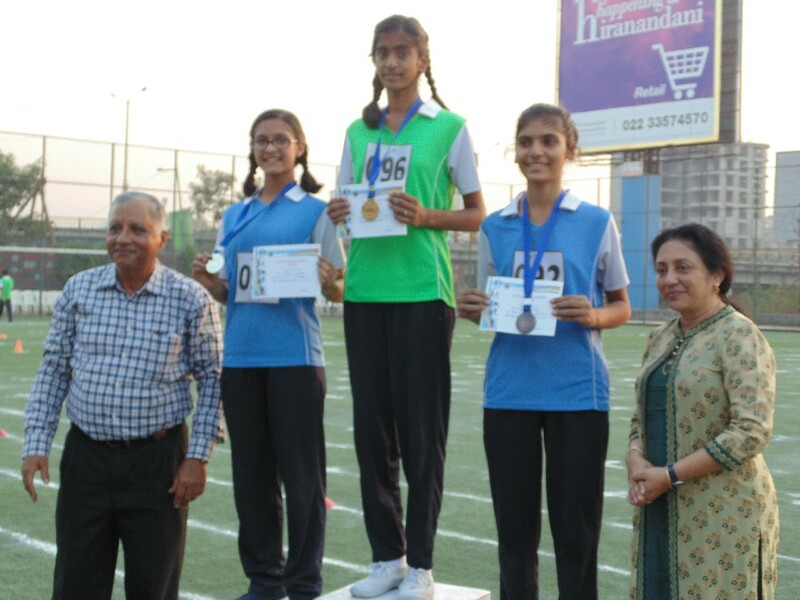 The students then took an oath of upholding the honour of their school and sportsmanship throughout the meet. 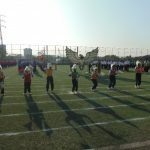 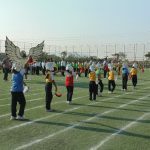 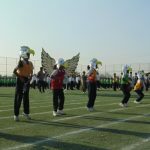 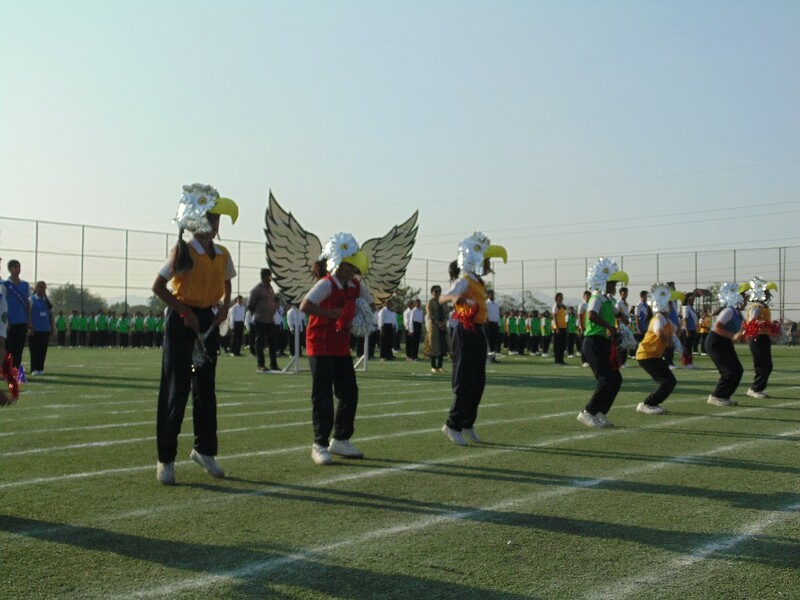 Then, the mascot of the sports meet, ‘Sparky’ the eagle, was introduced to the audience by a dance performed by the younger grades. 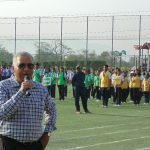 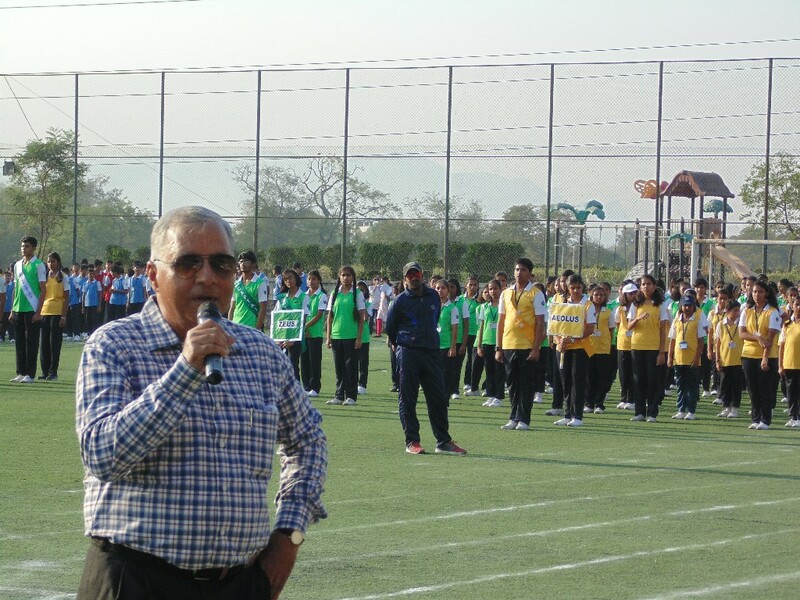 Mr. Suresh Shastri in his message to students, emphasized upon the importance of sports. 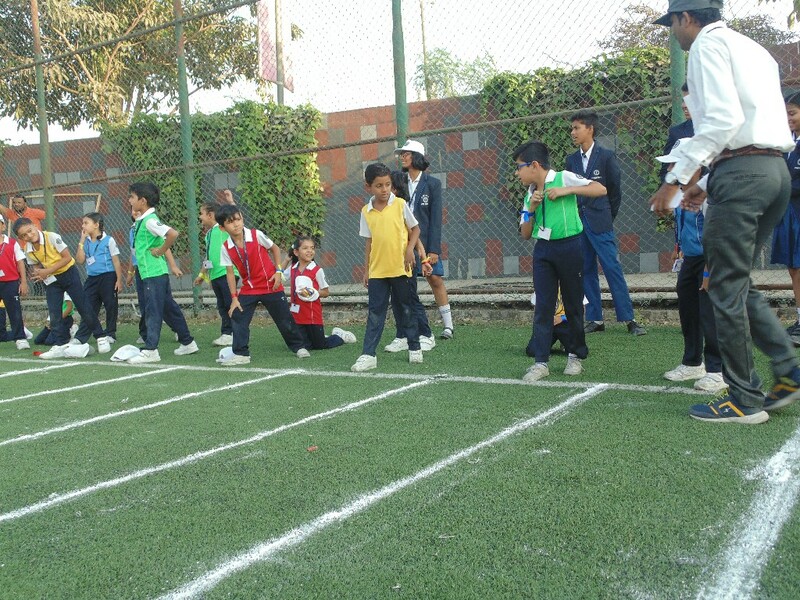 “Playing sports will always keep you active. 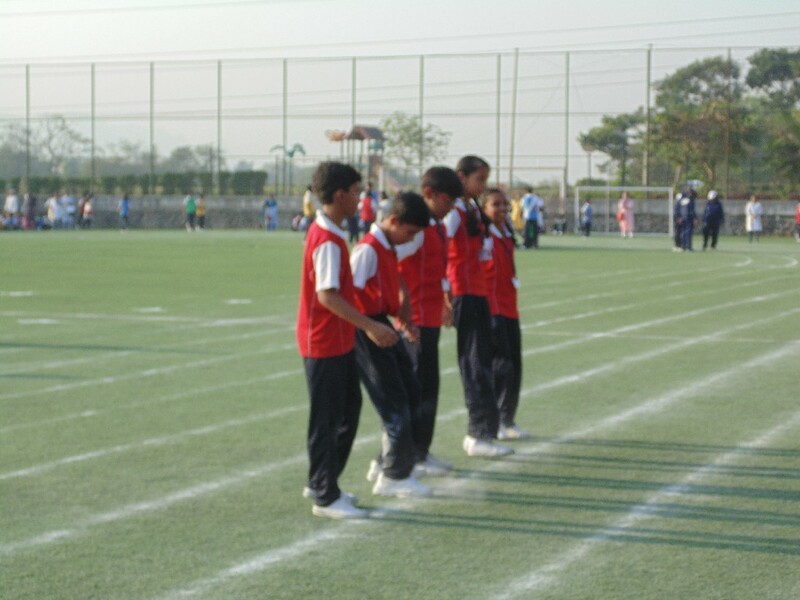 Never stop, keep on playing”. 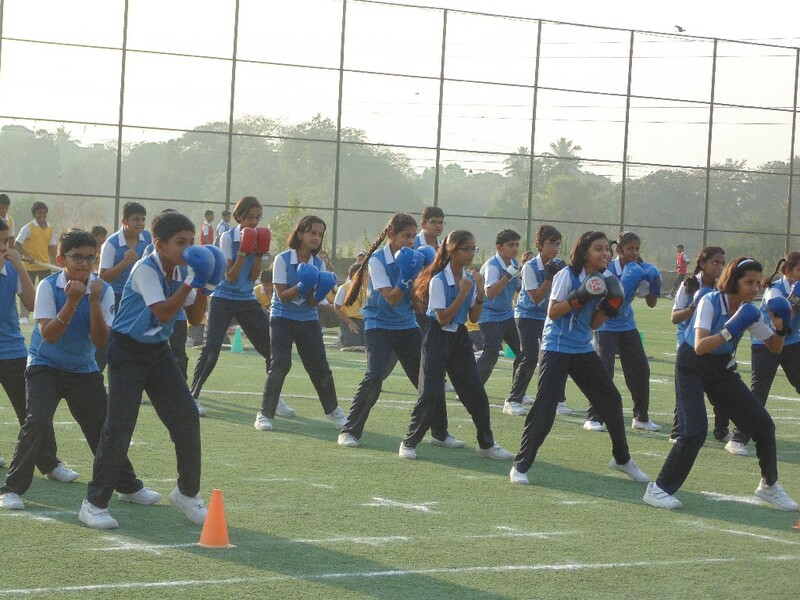 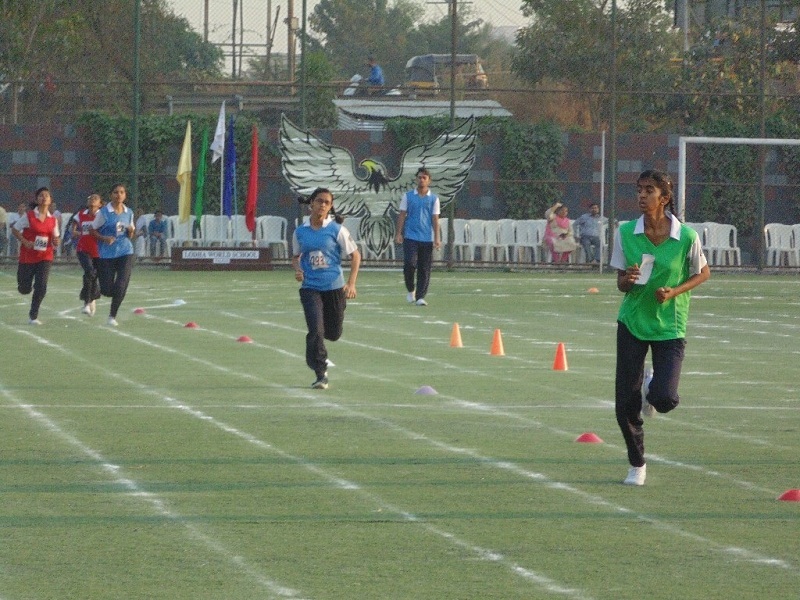 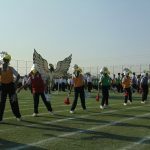 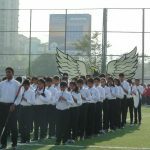 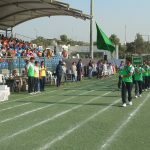 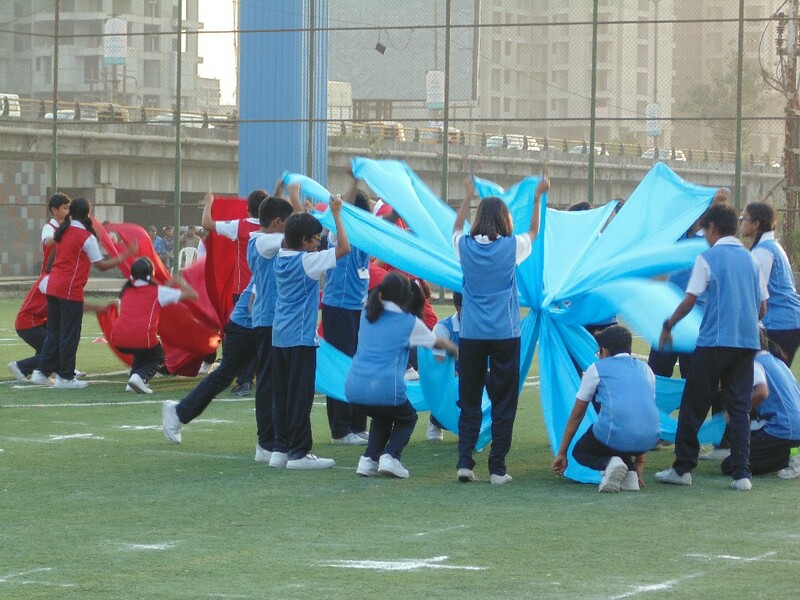 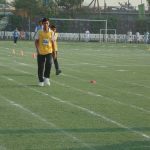 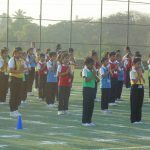 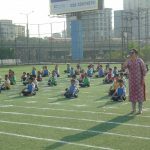 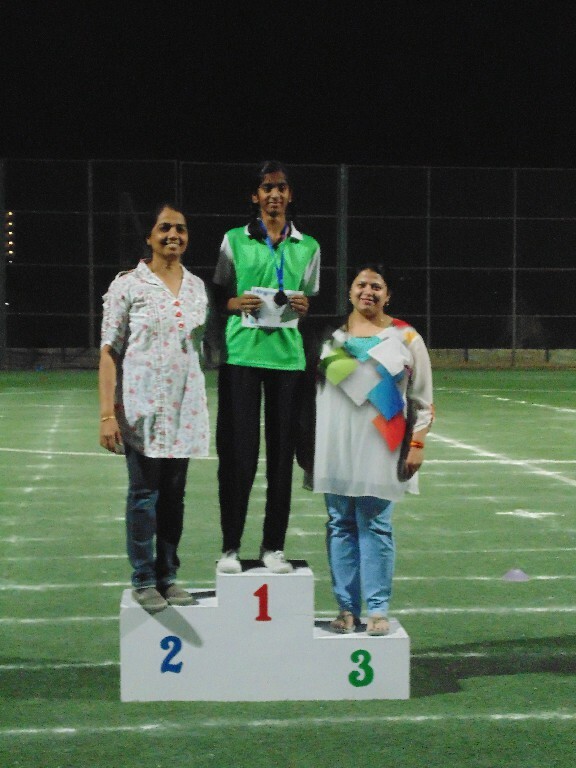 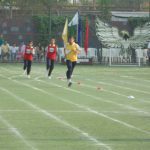 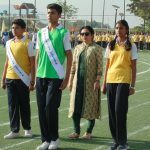 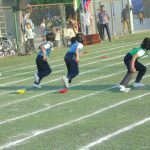 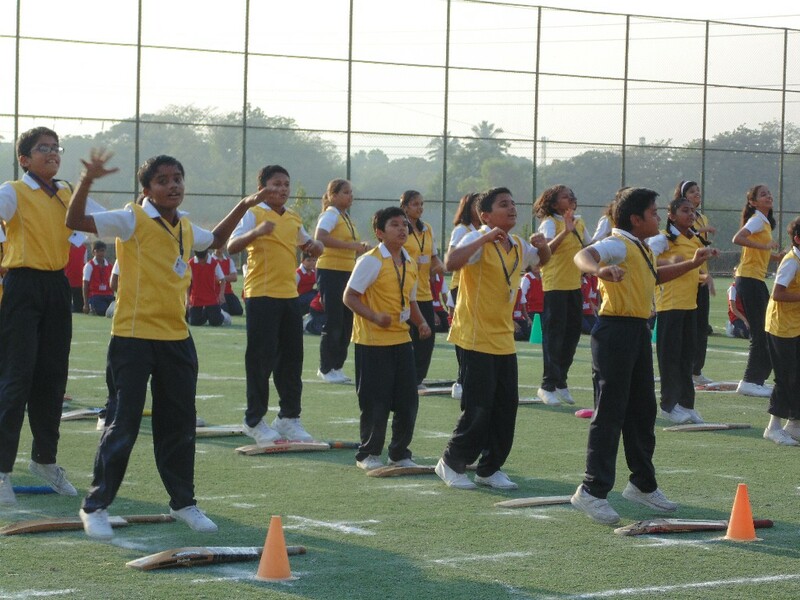 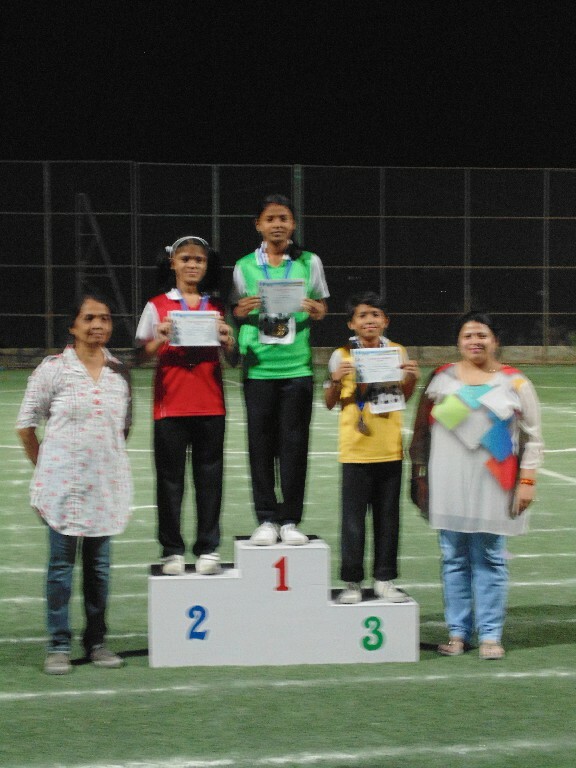 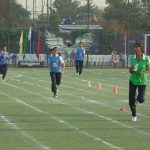 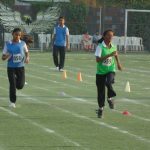 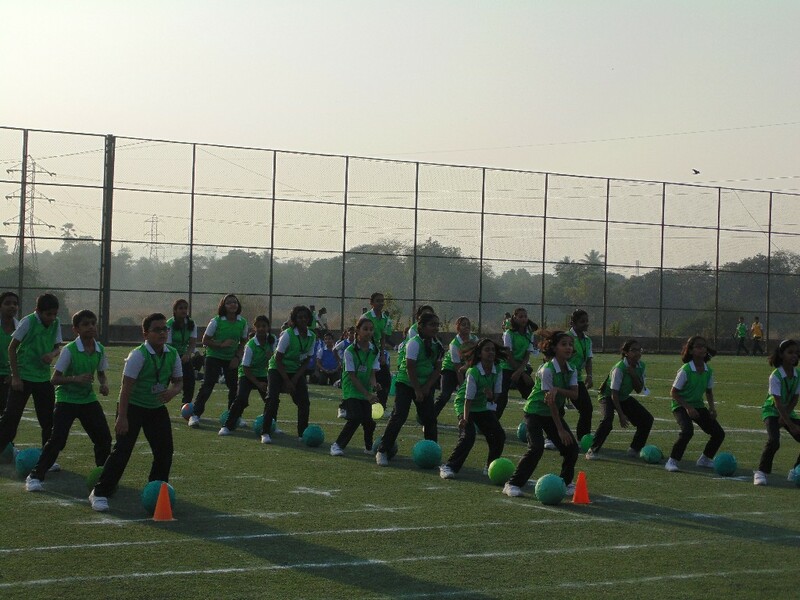 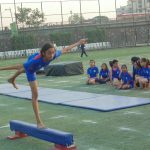 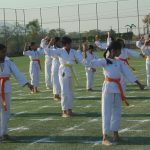 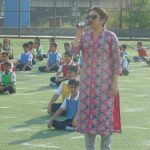 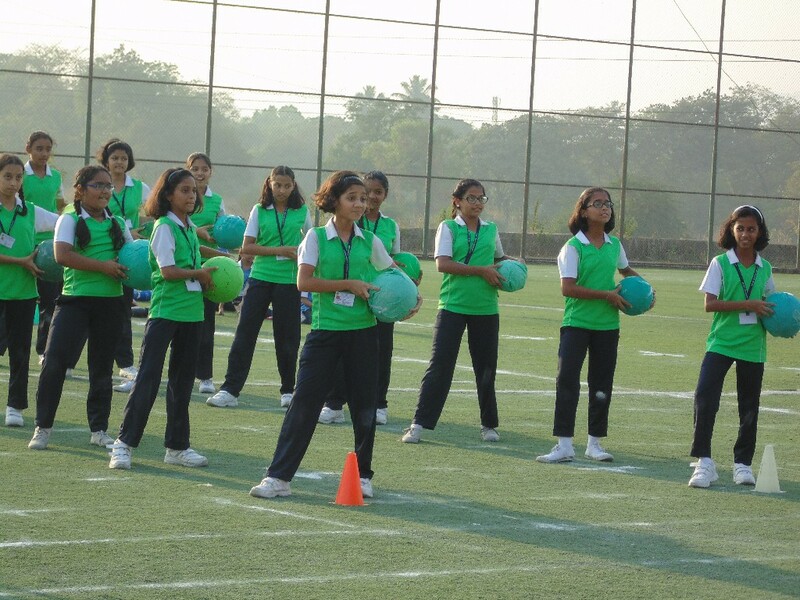 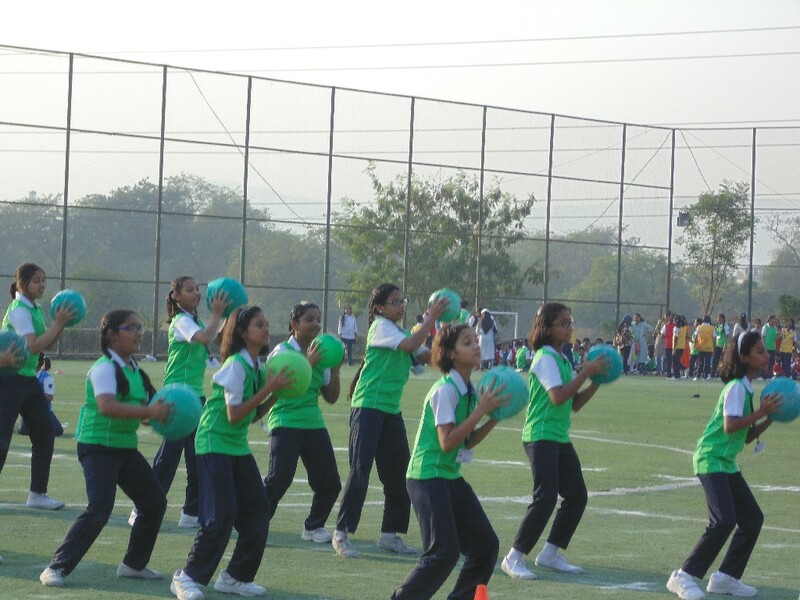 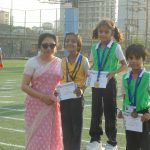 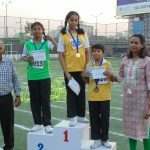 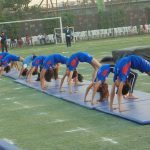 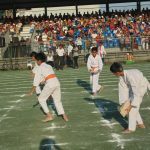 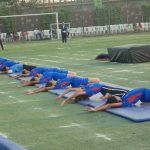 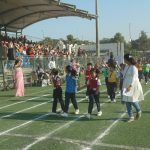 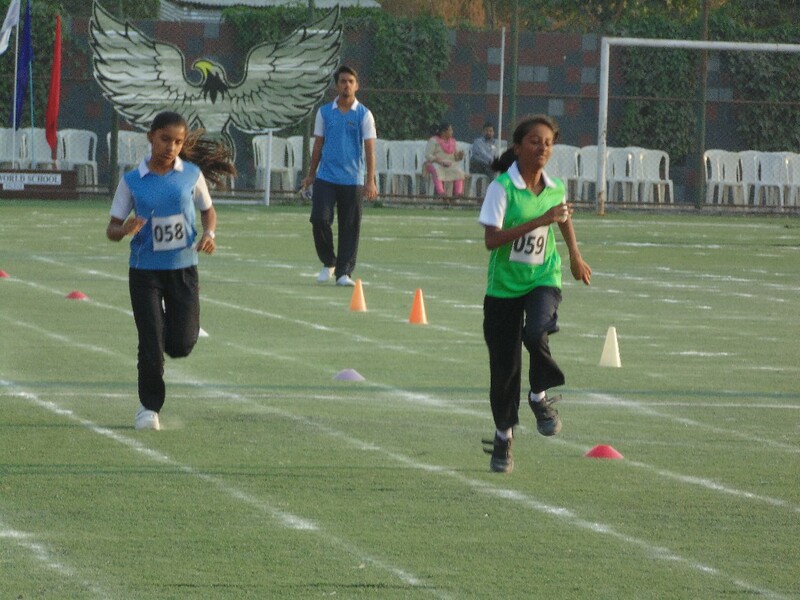 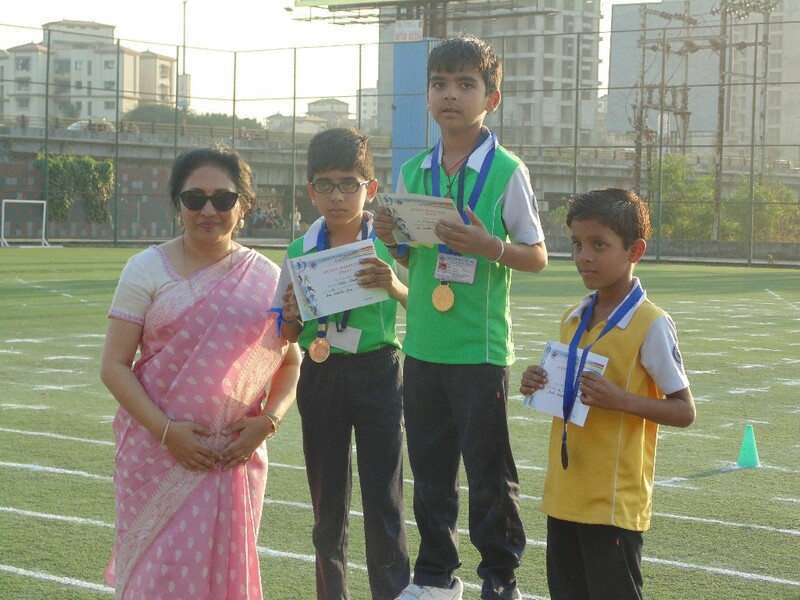 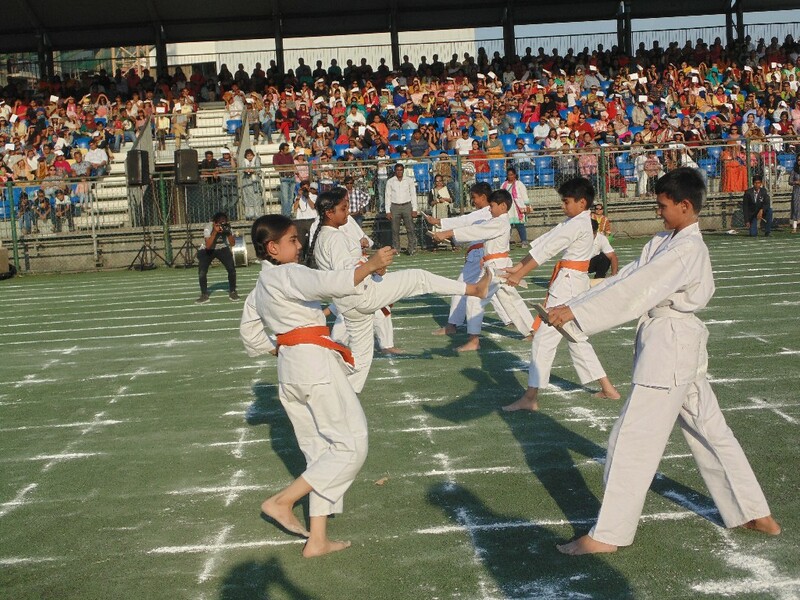 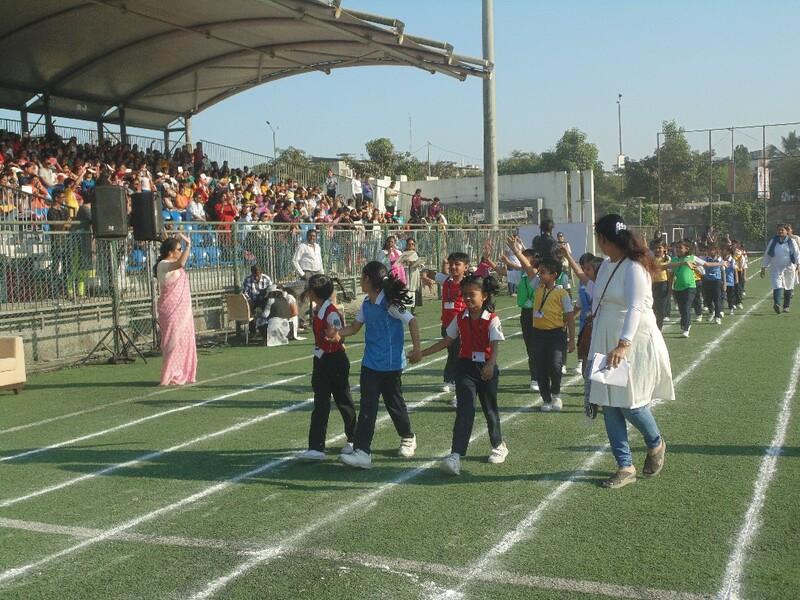 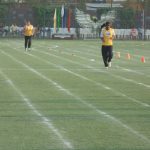 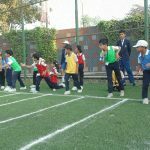 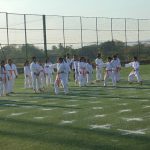 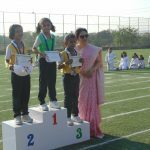 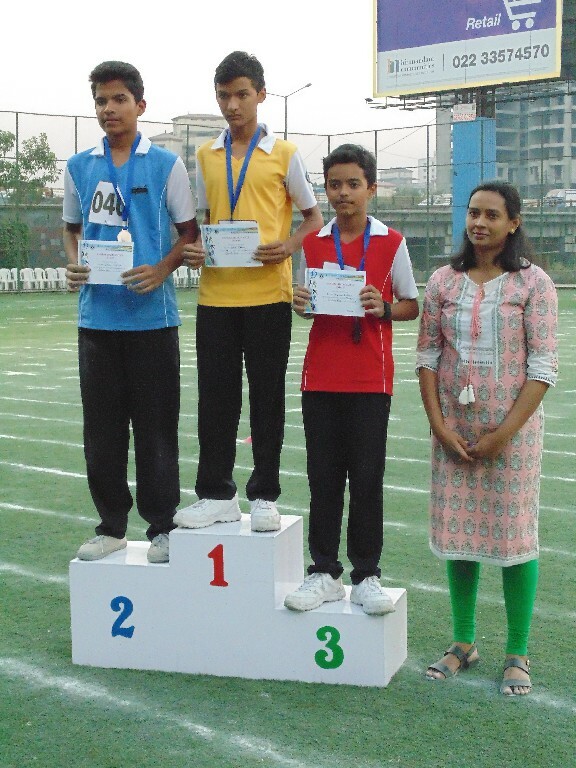 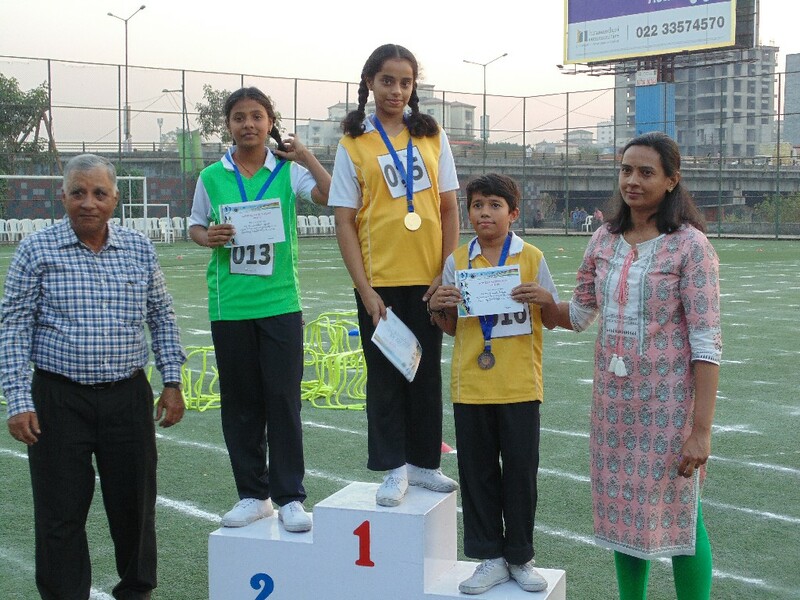 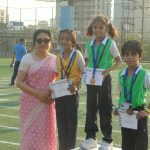 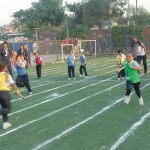 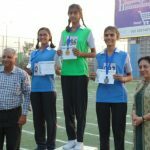 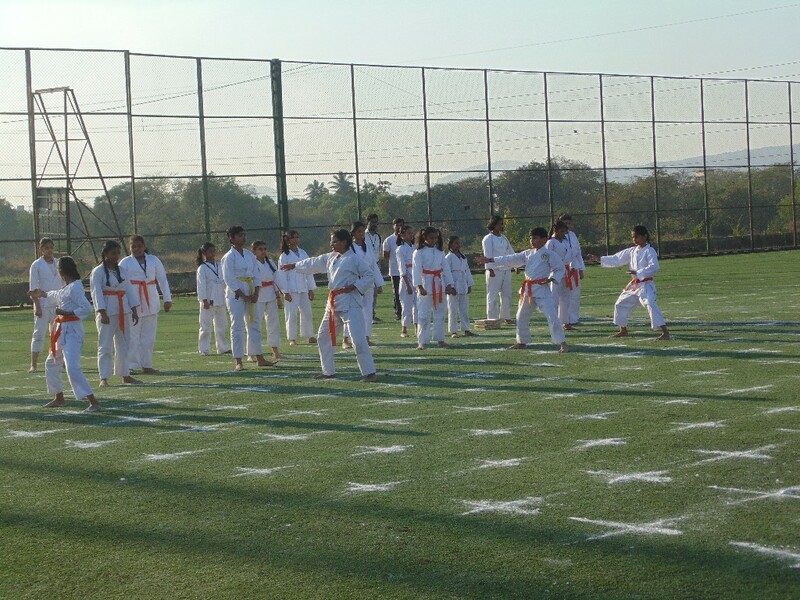 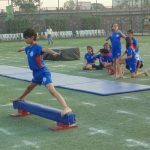 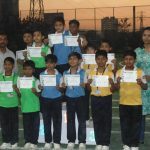 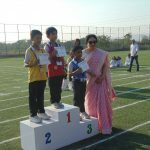 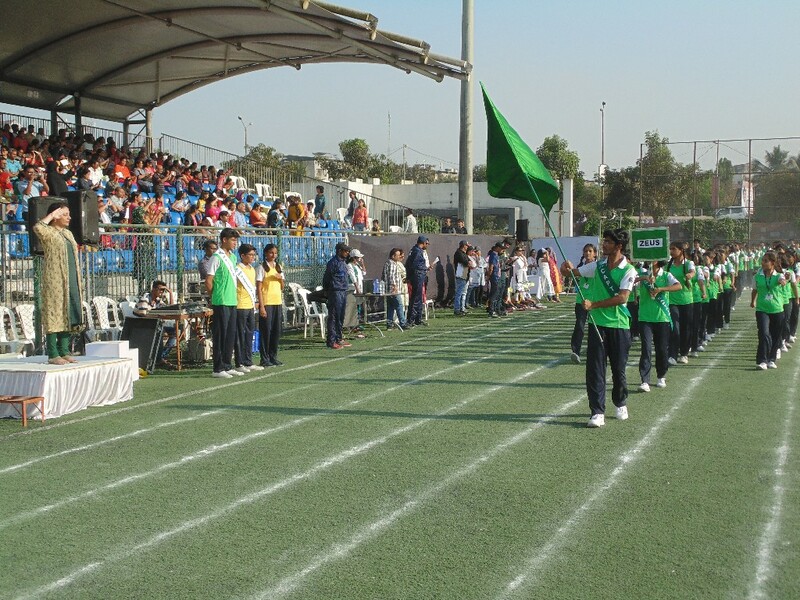 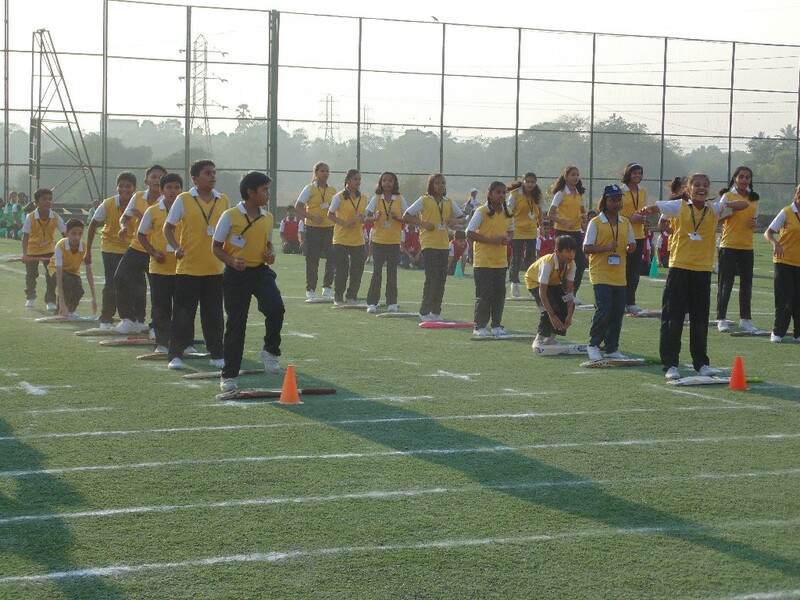 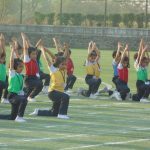 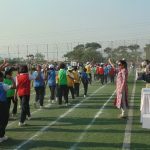 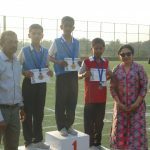 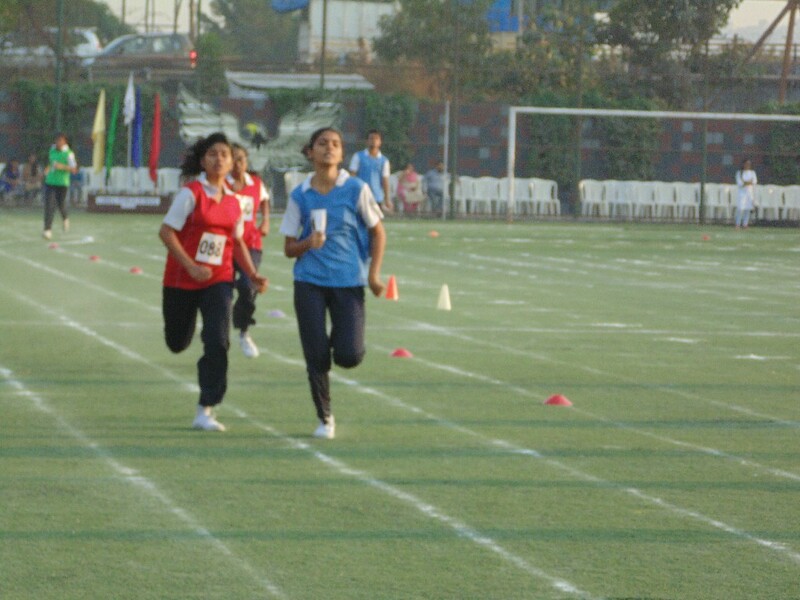 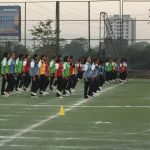 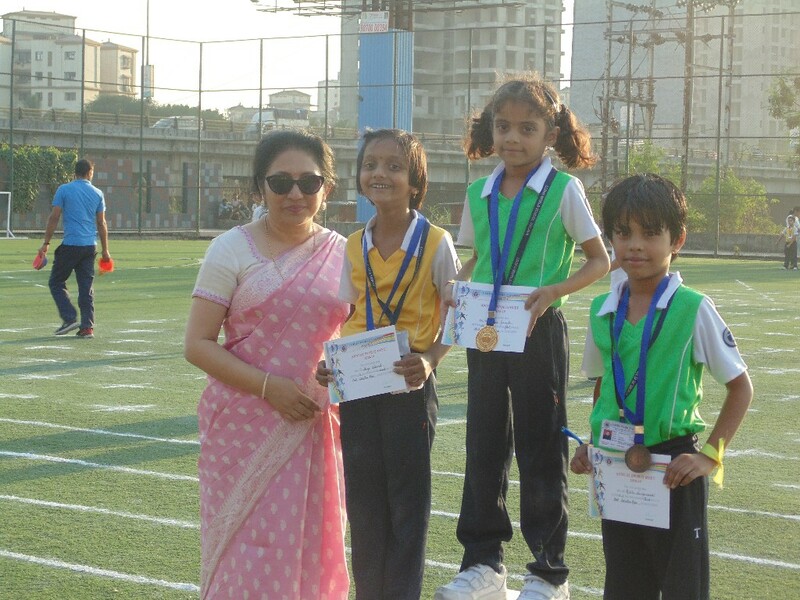 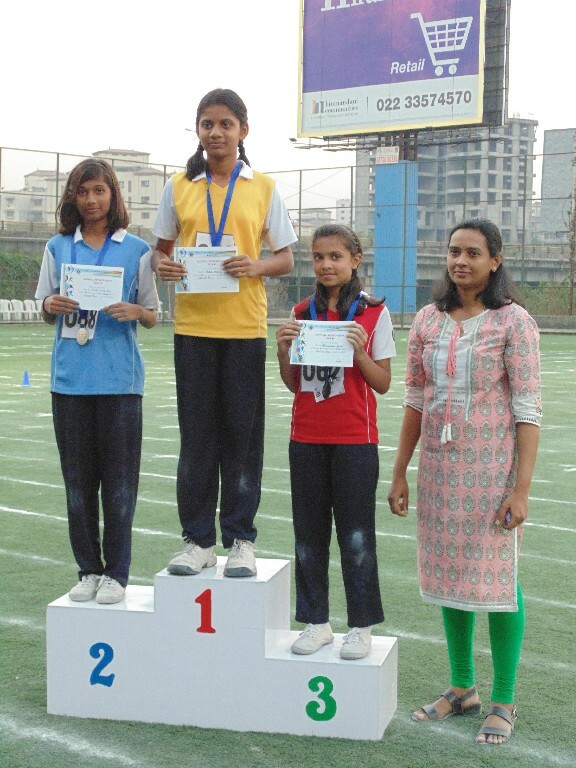 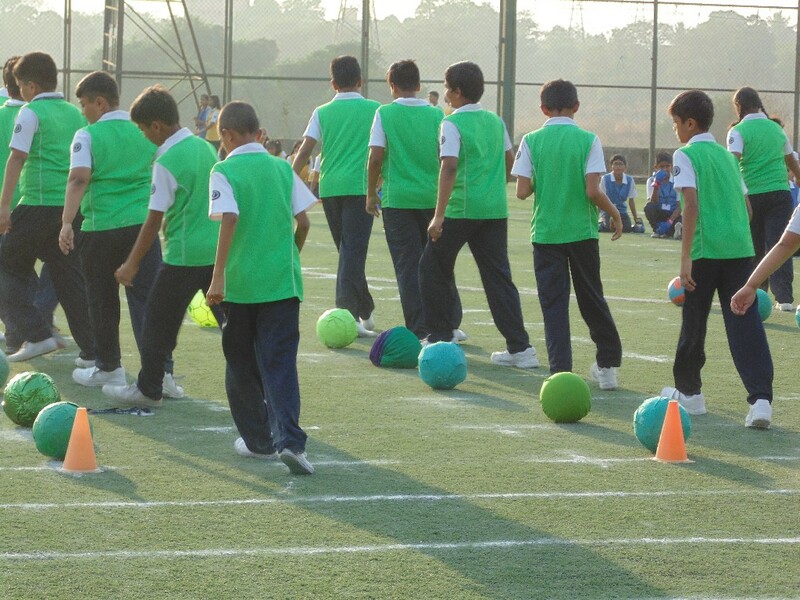 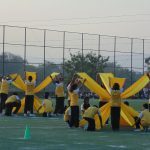 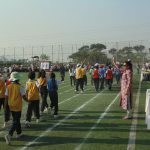 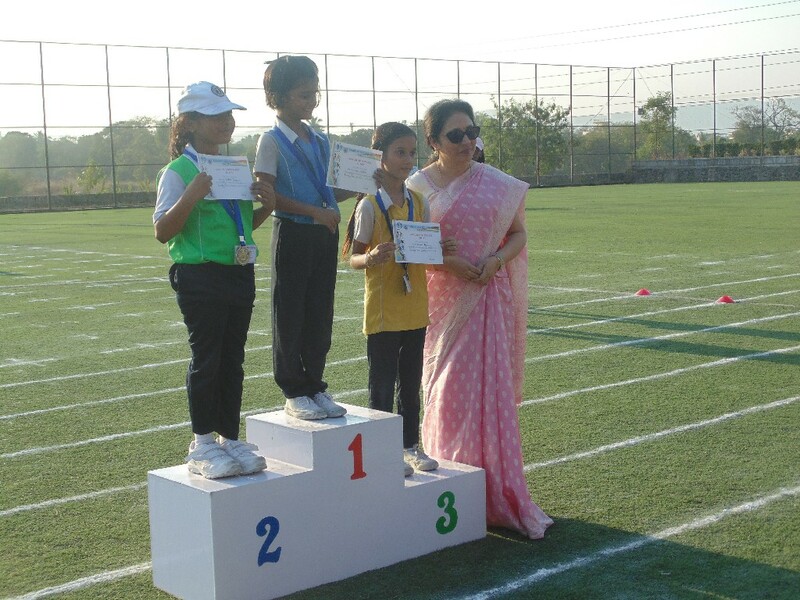 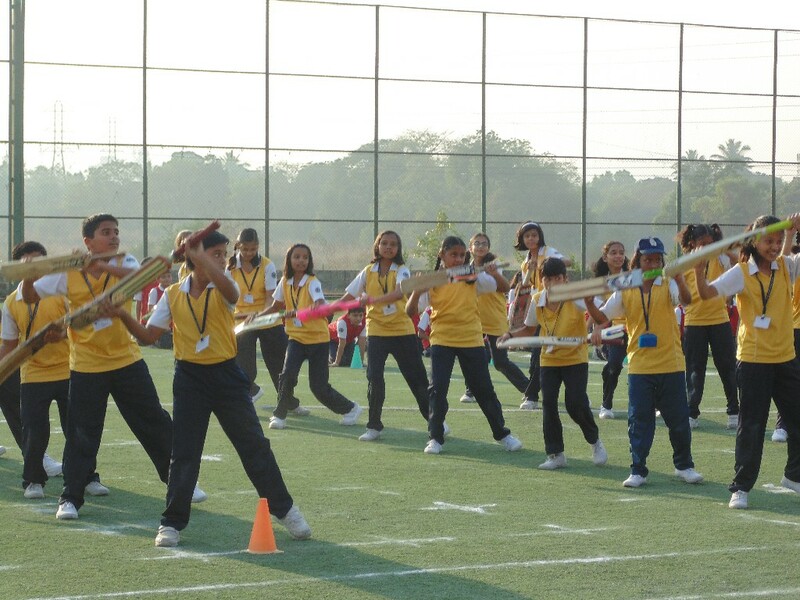 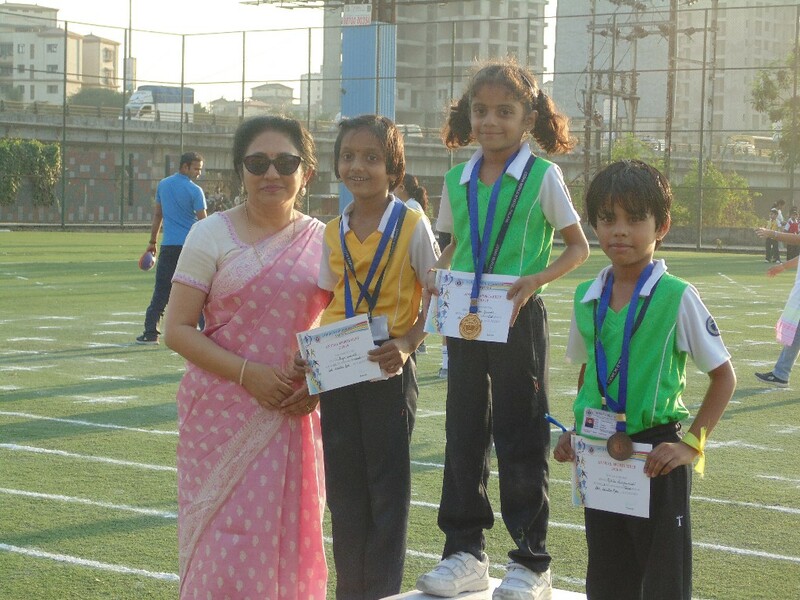 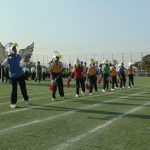 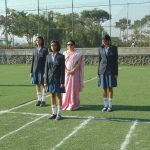 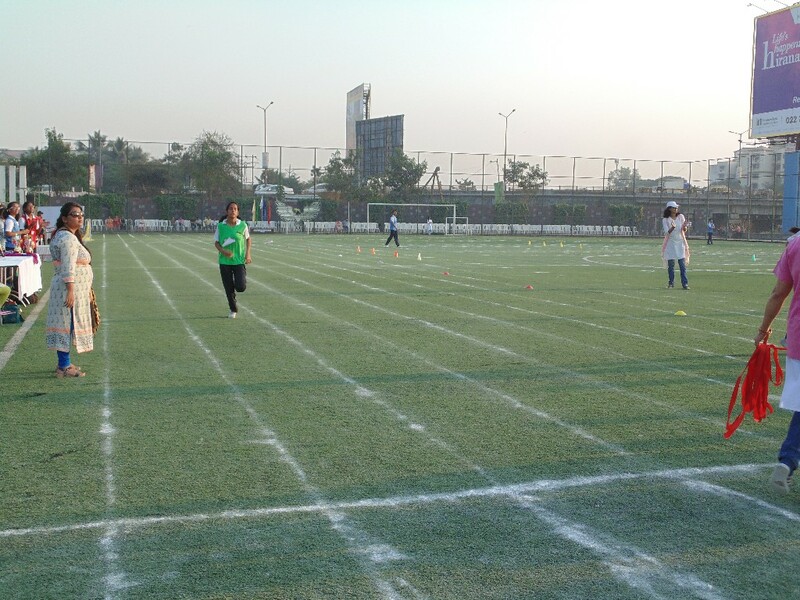 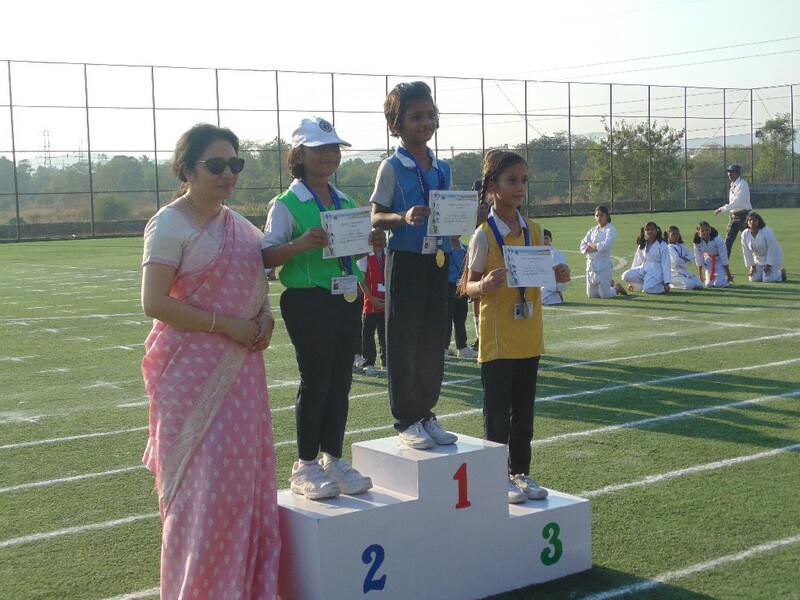 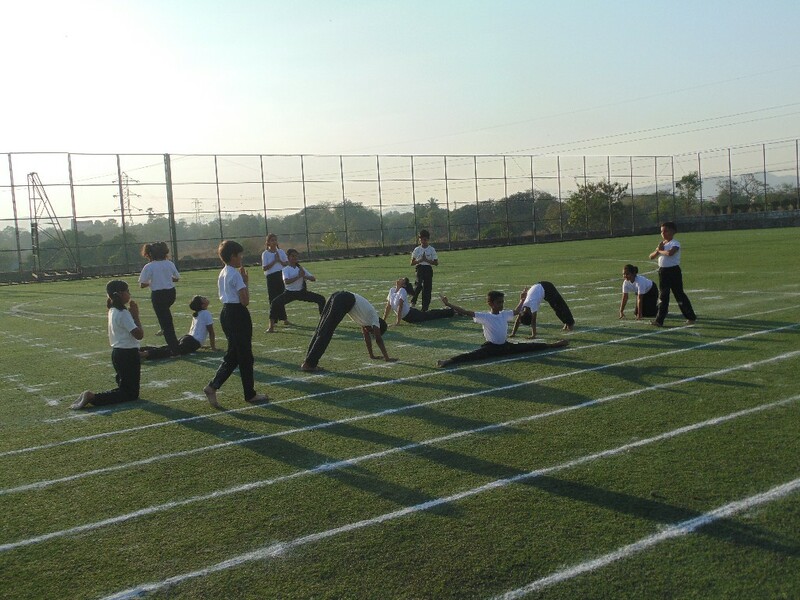 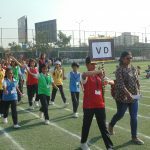 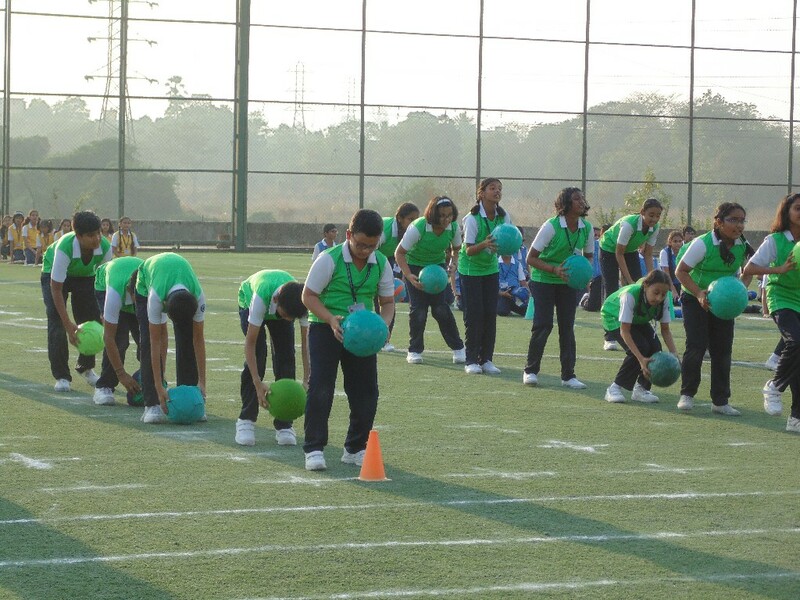 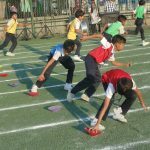 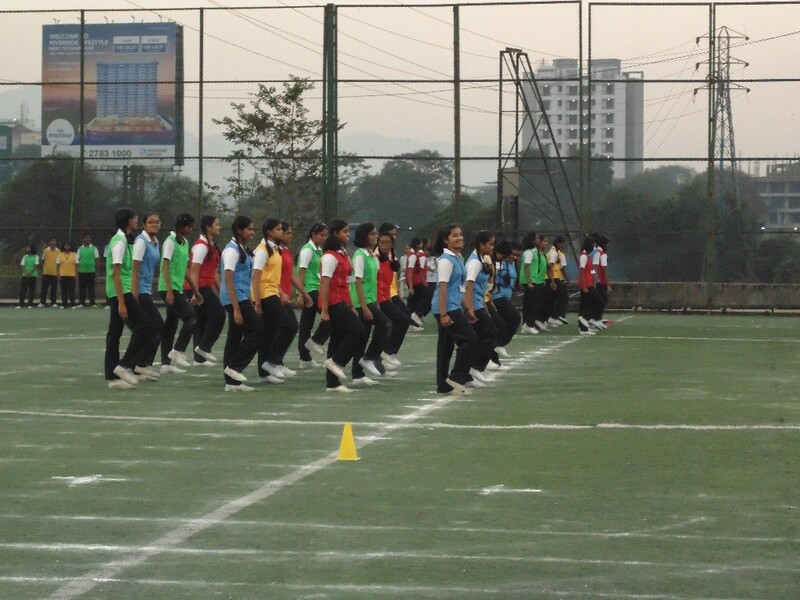 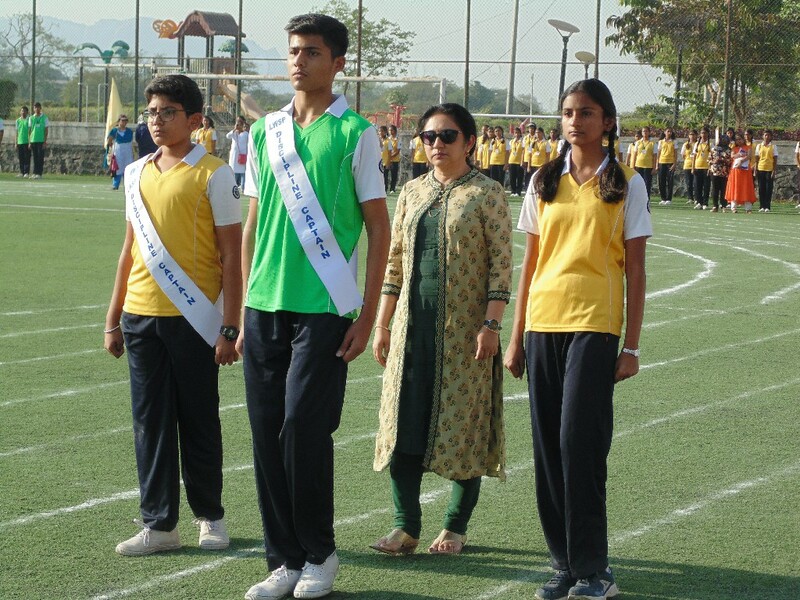 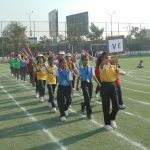 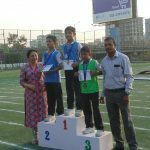 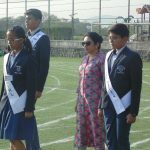 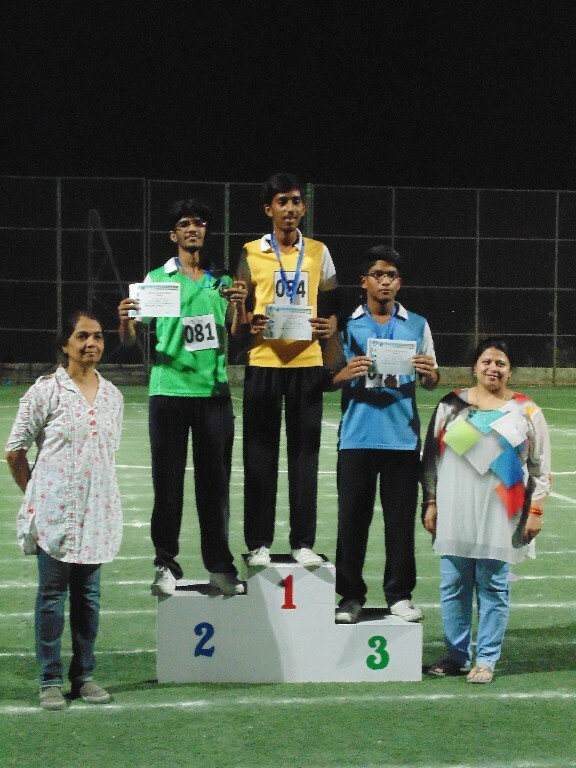 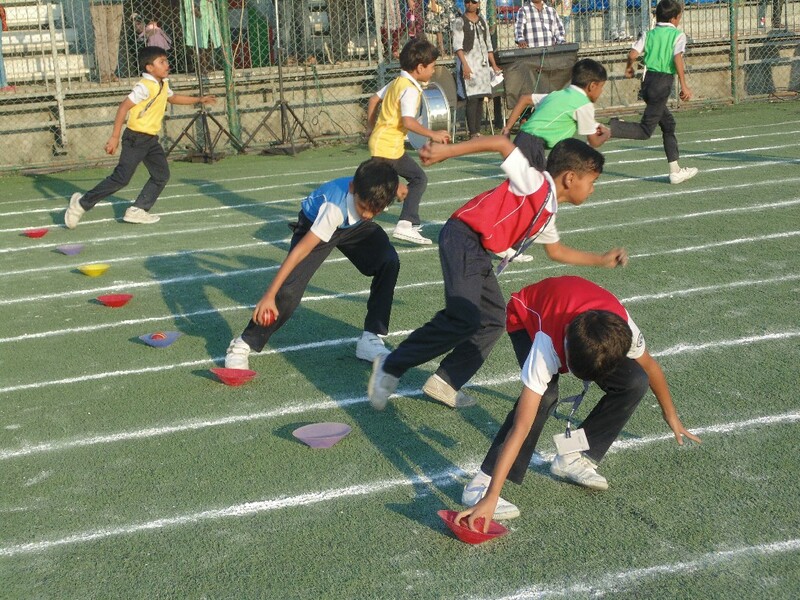 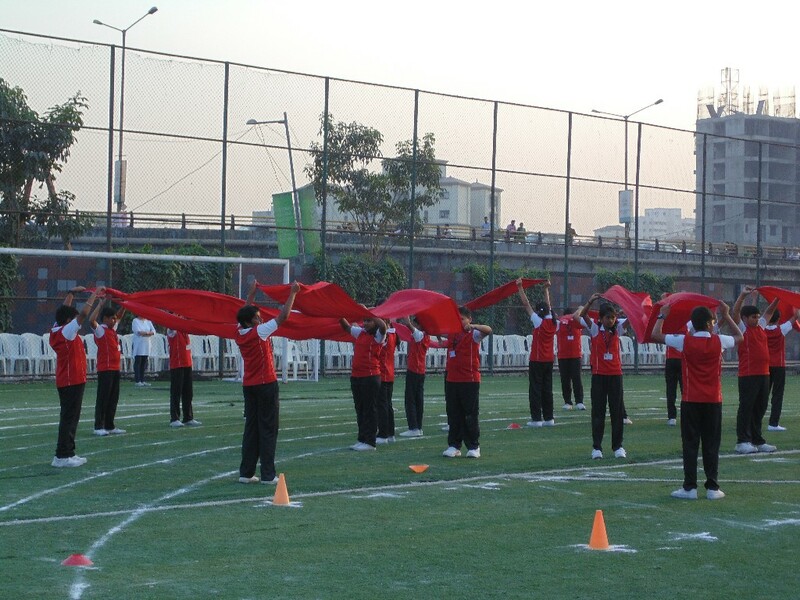 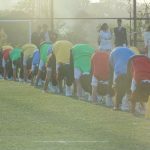 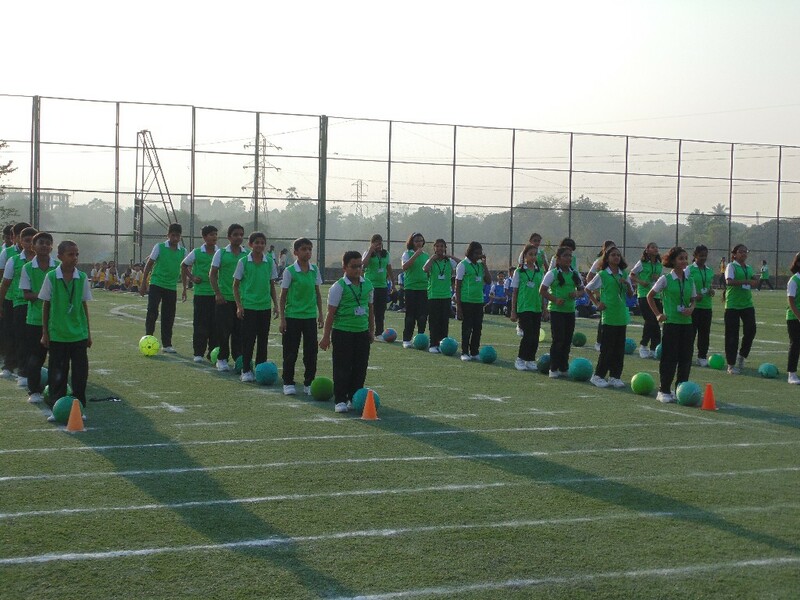 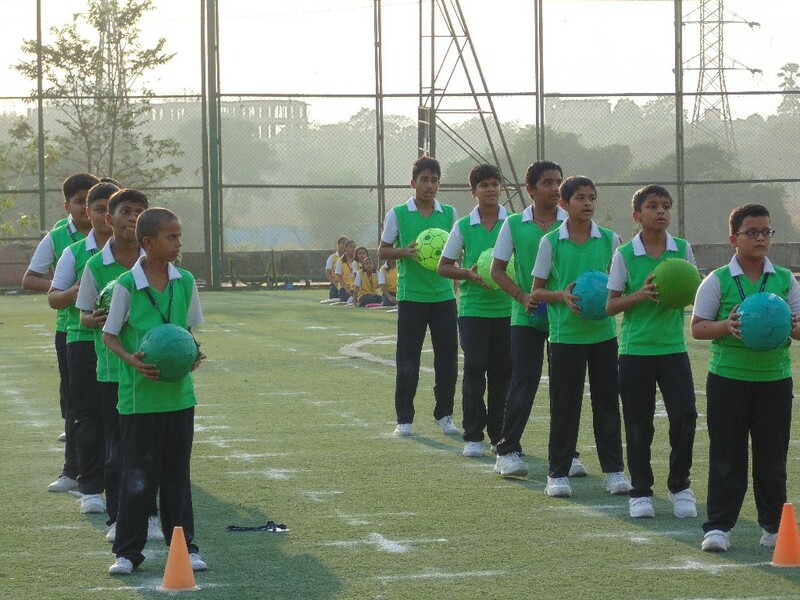 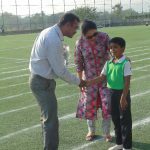 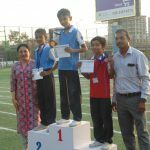 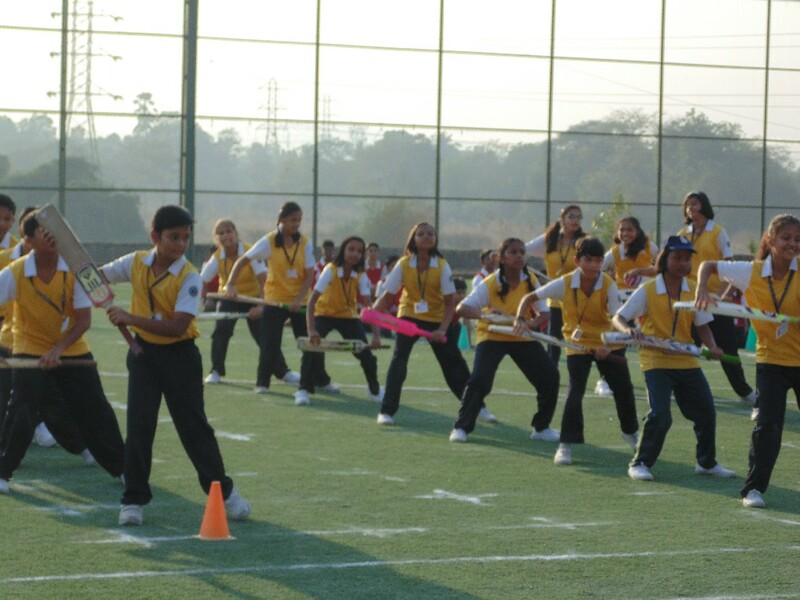 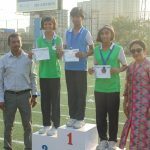 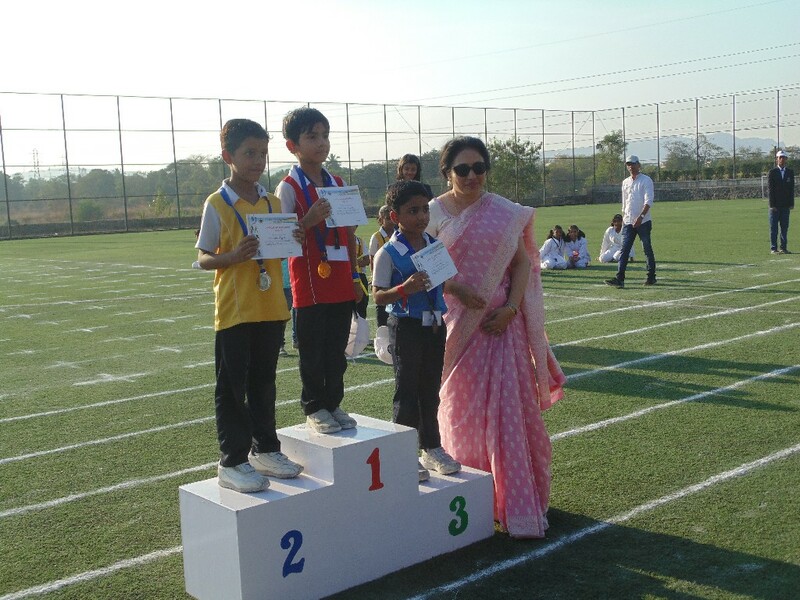 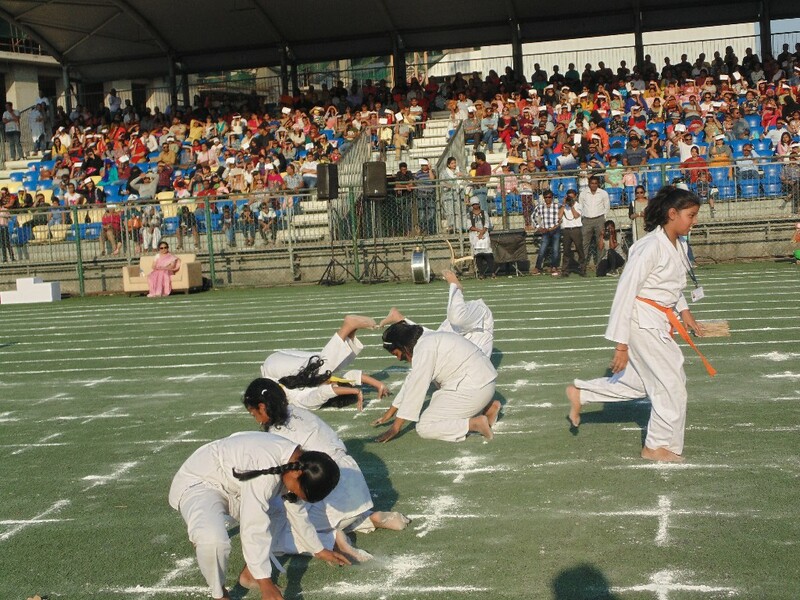 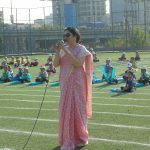 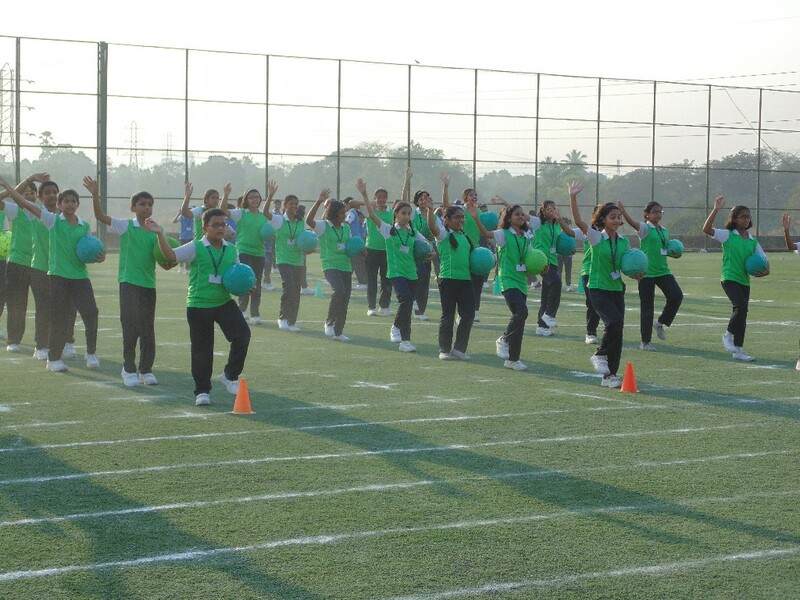 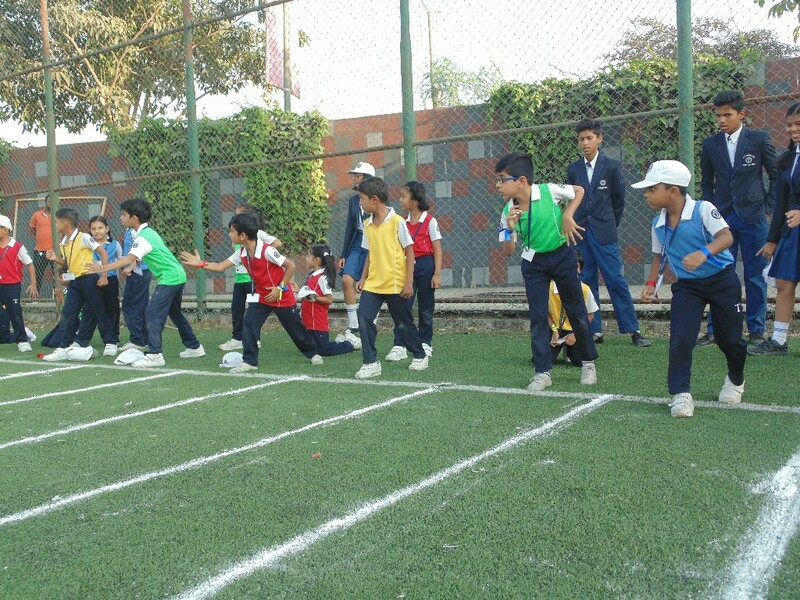 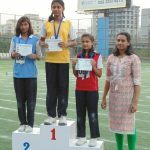 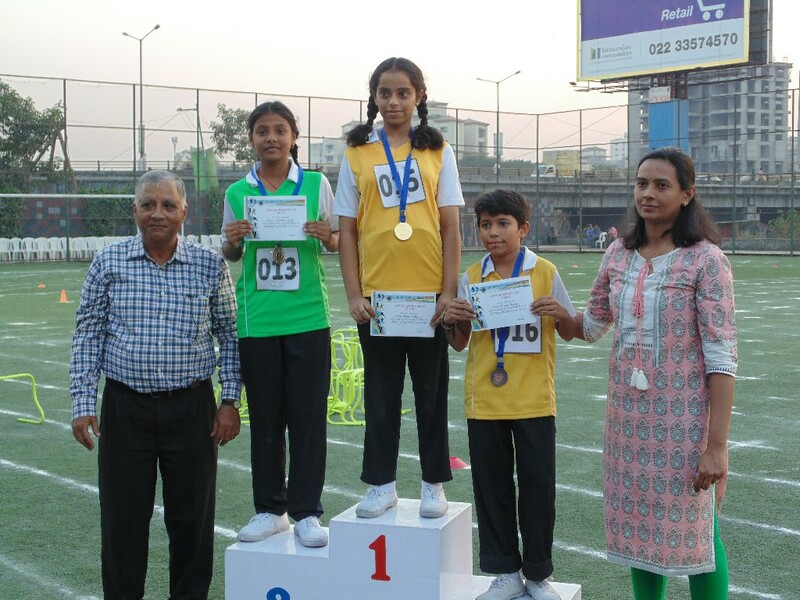 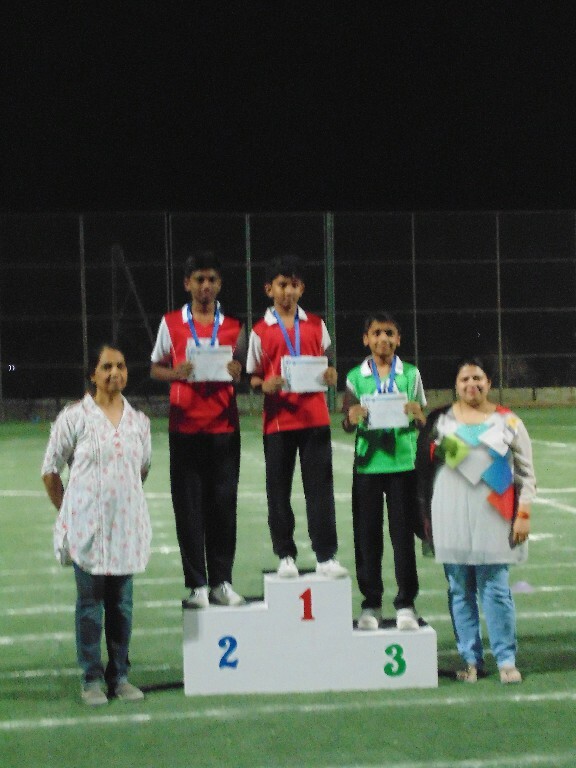 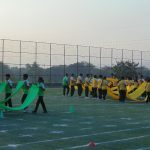 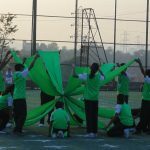 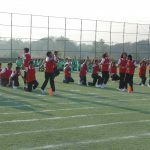 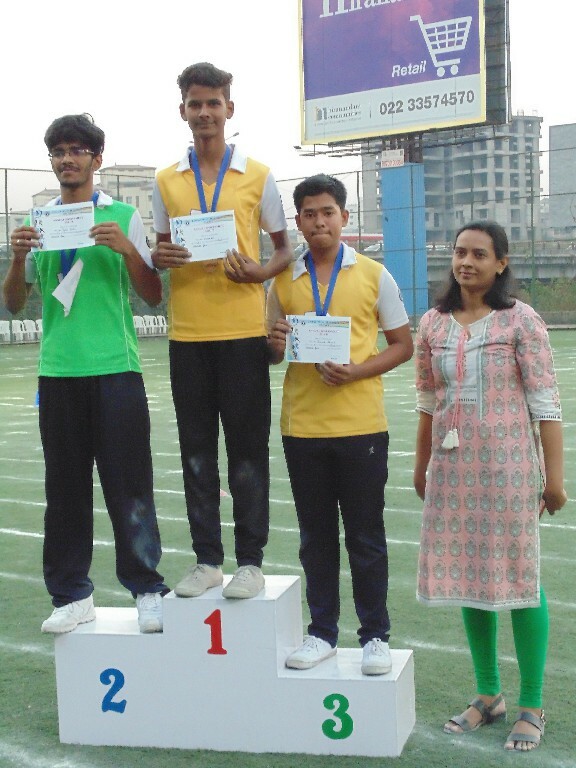 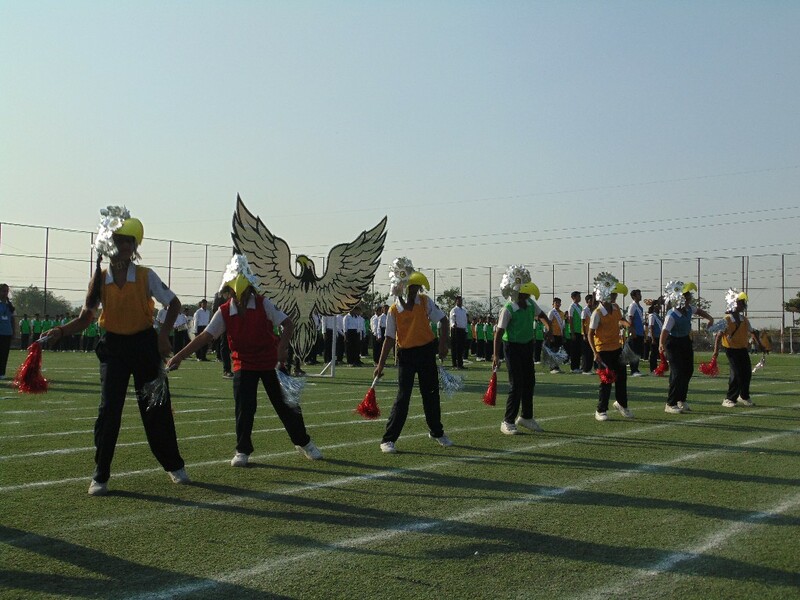 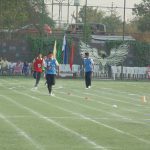 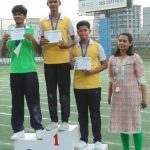 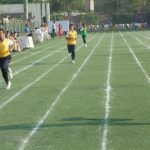 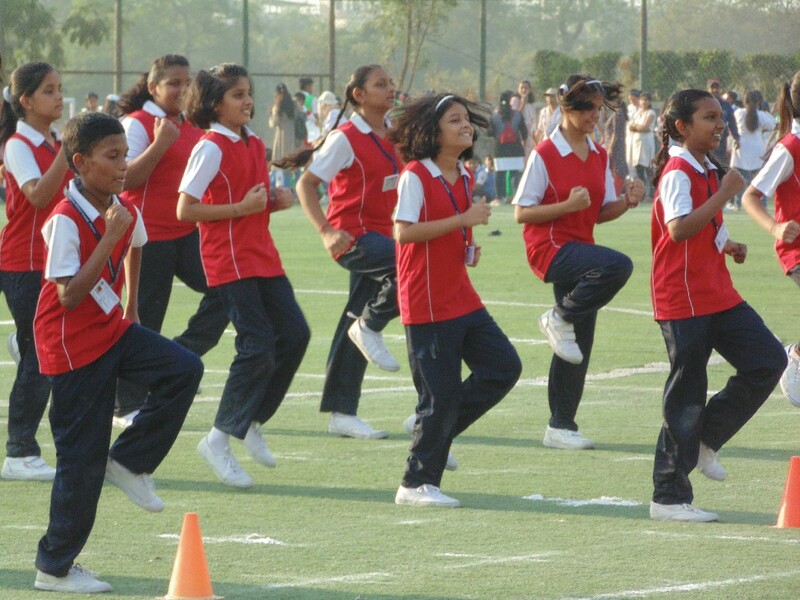 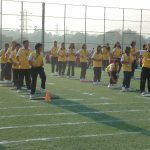 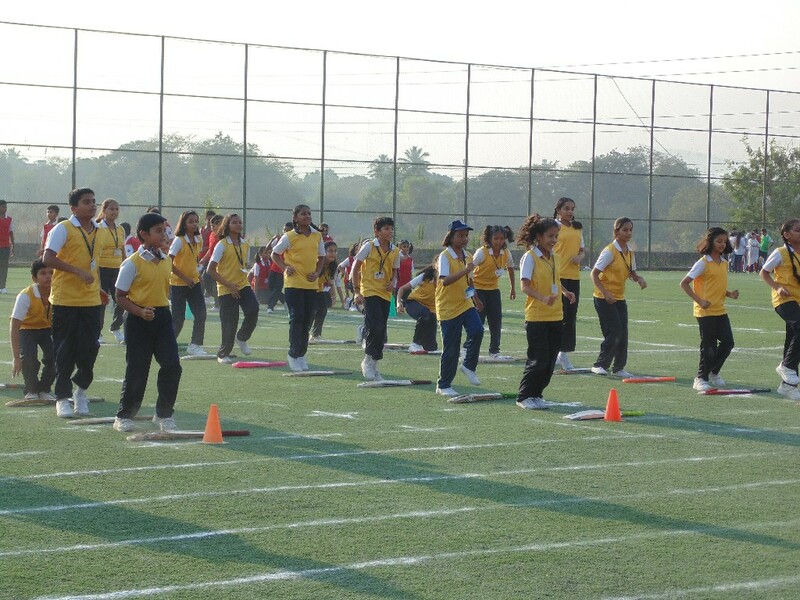 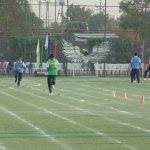 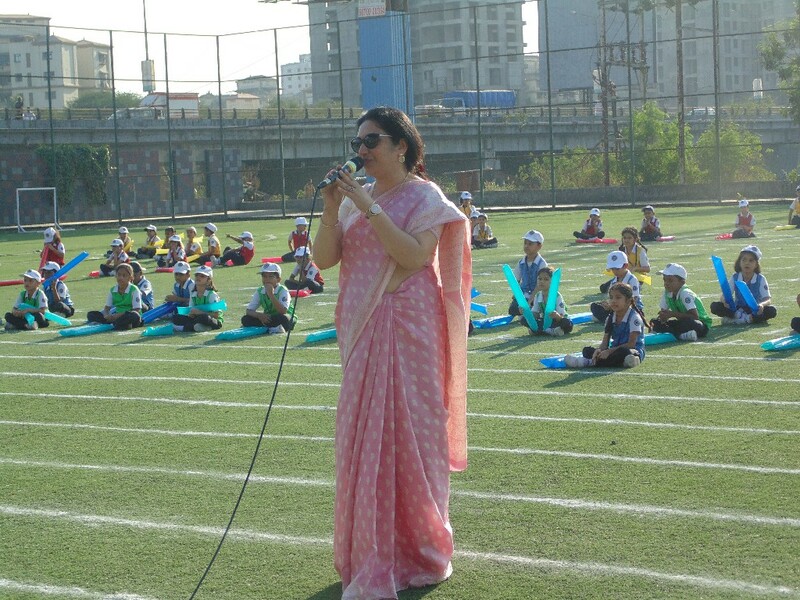 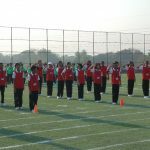 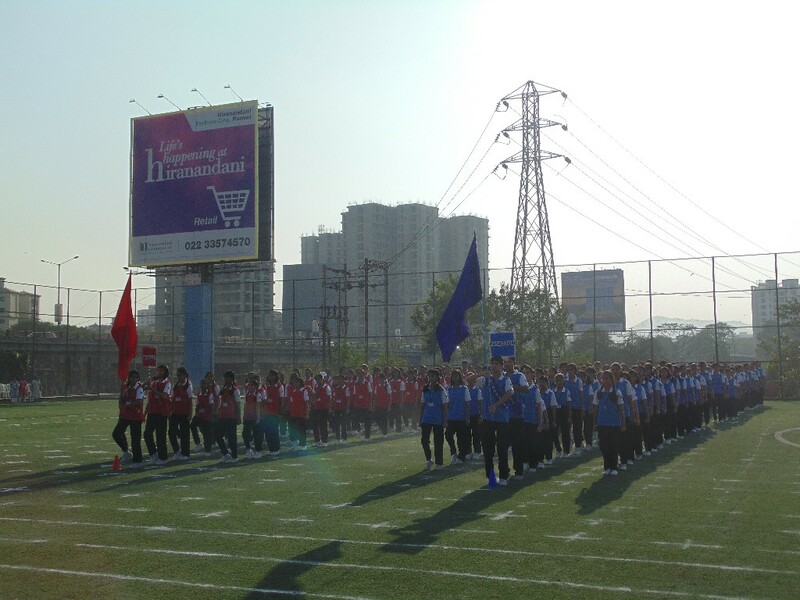 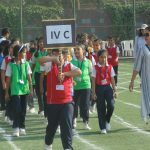 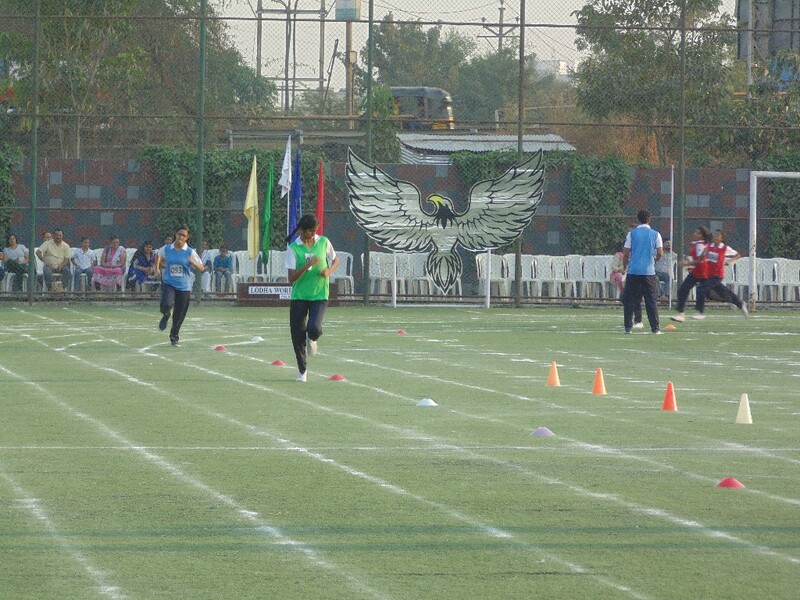 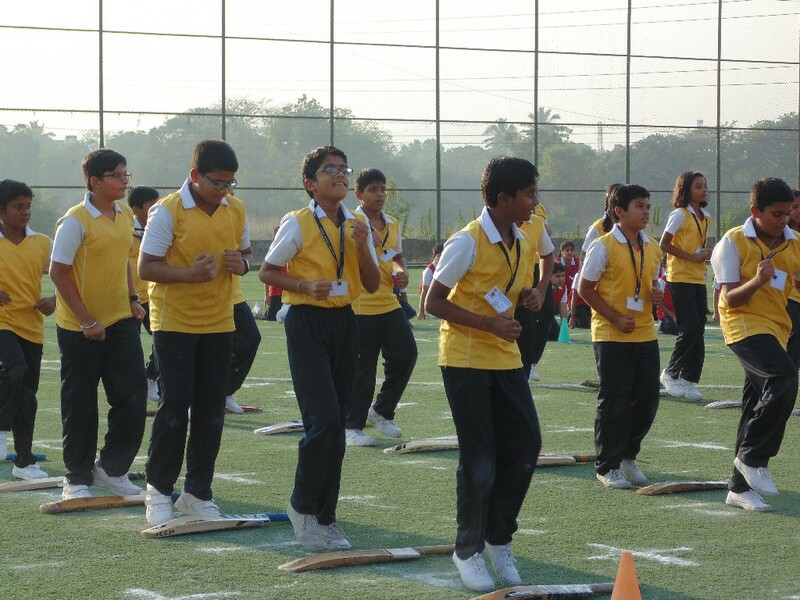 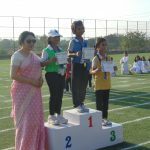 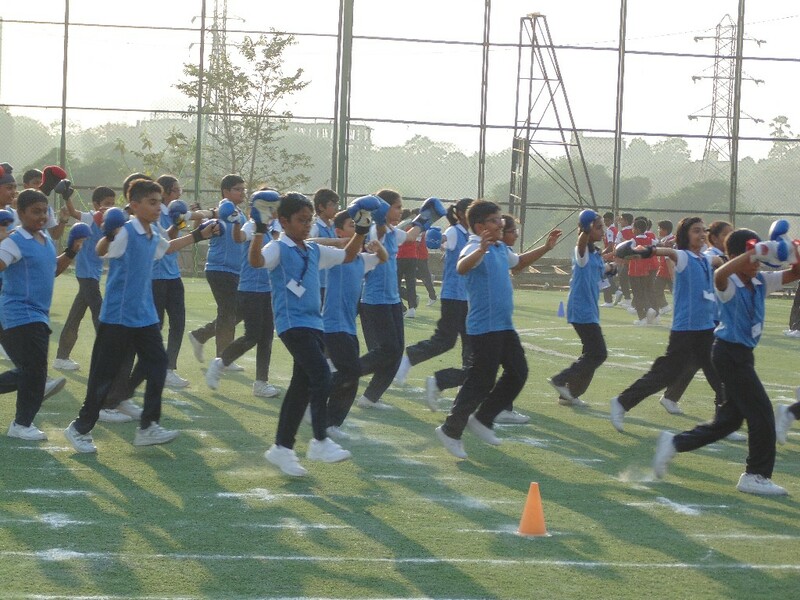 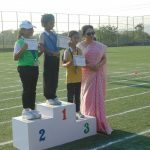 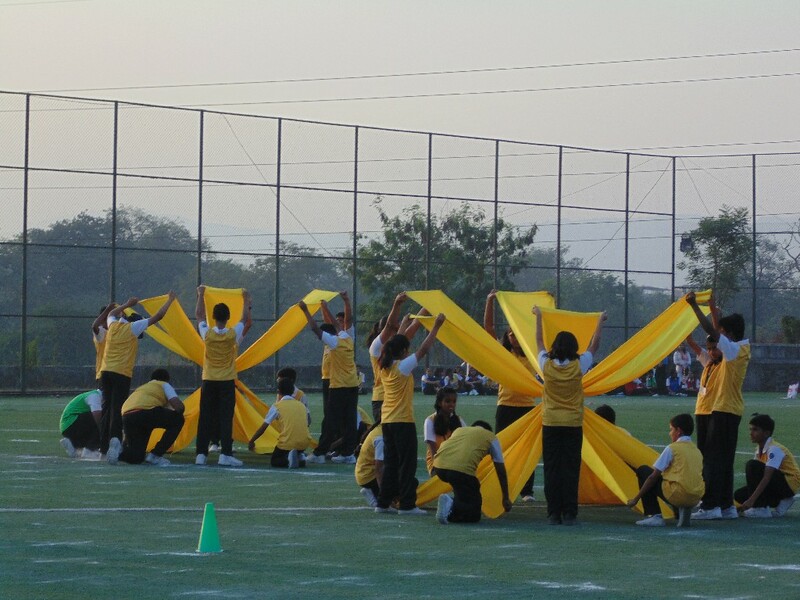 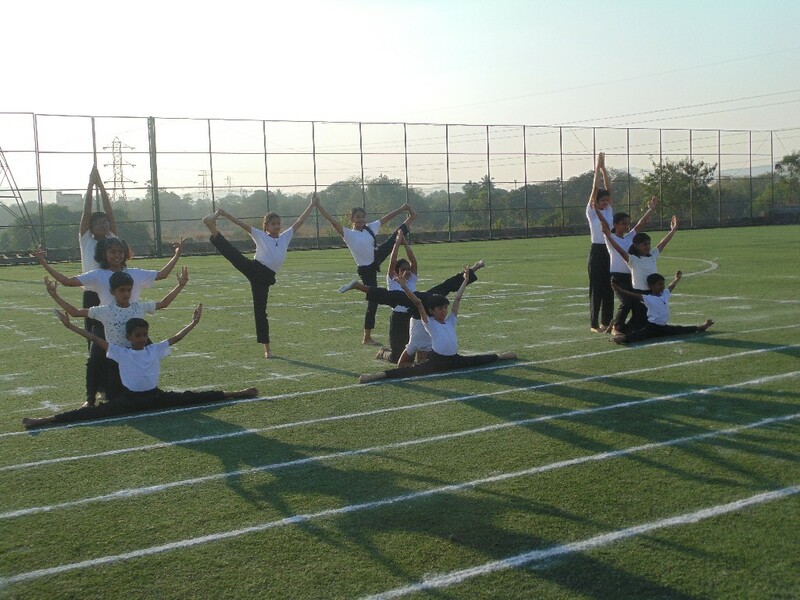 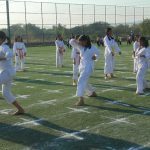 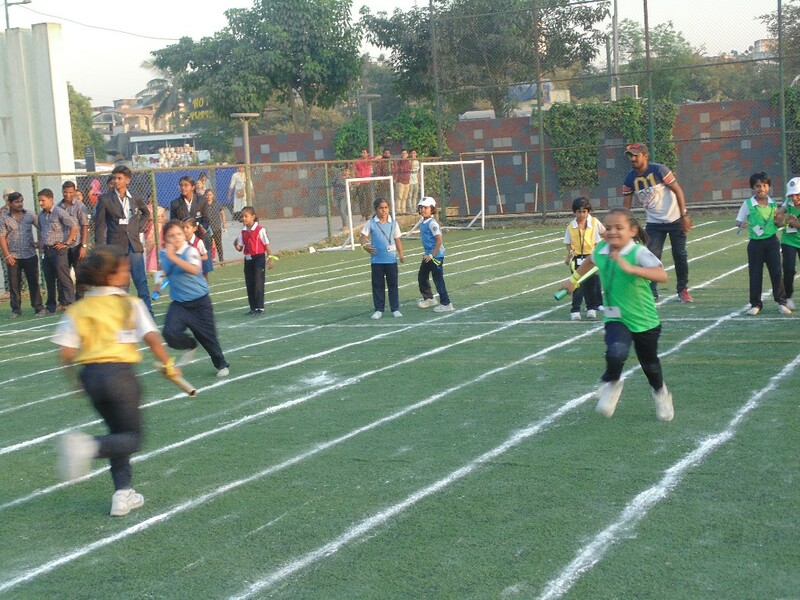 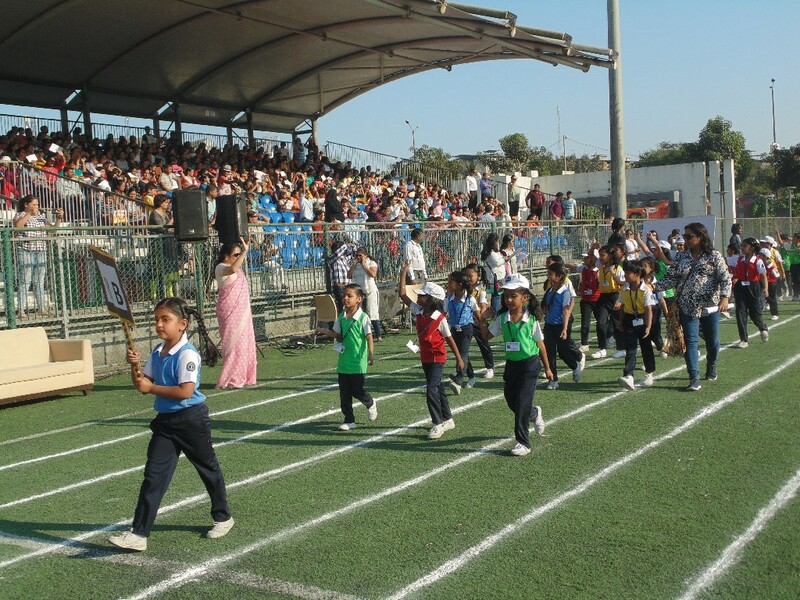 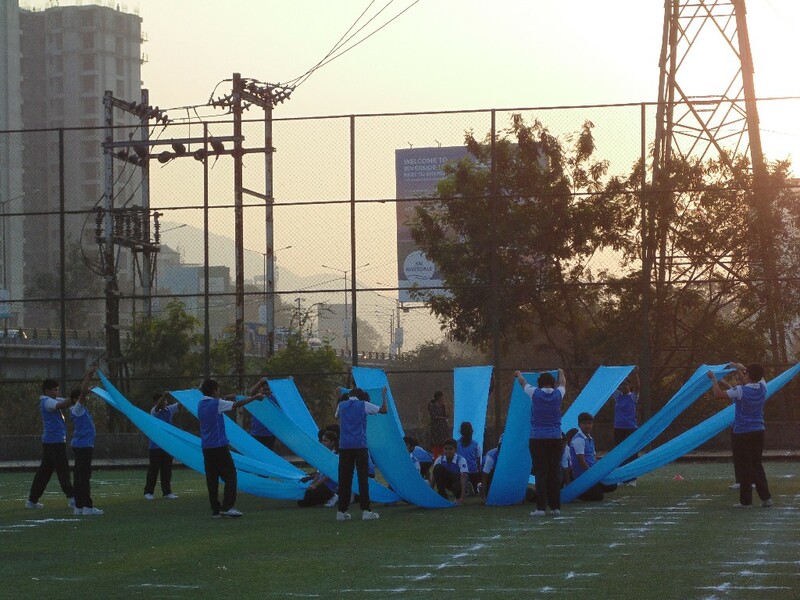 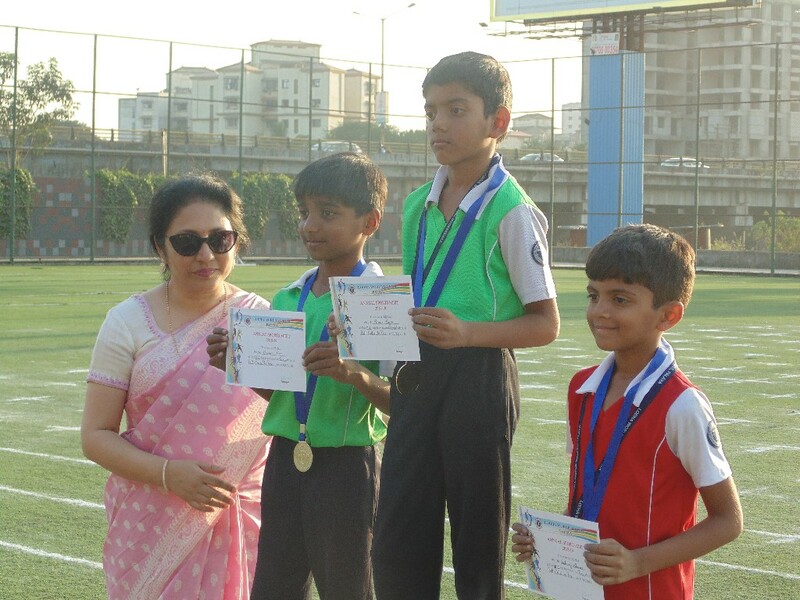 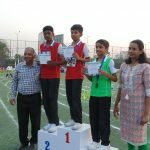 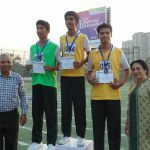 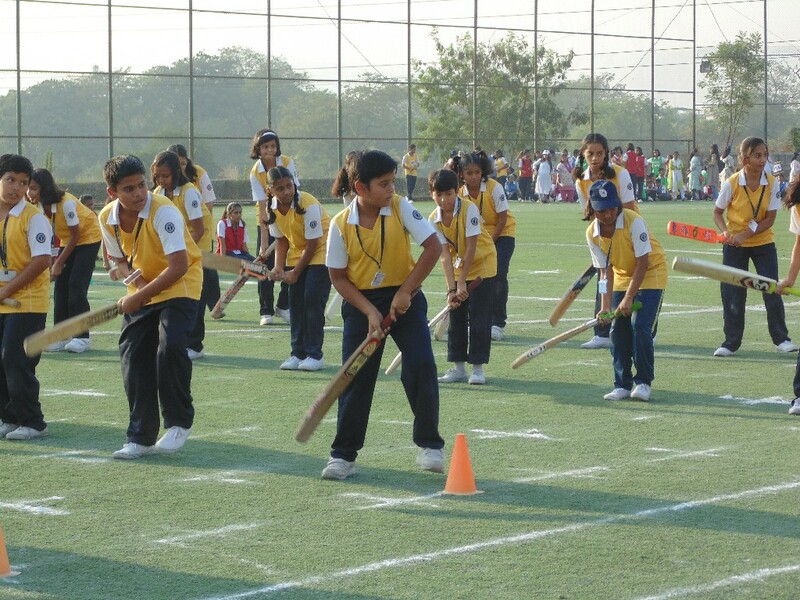 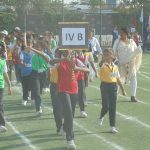 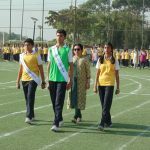 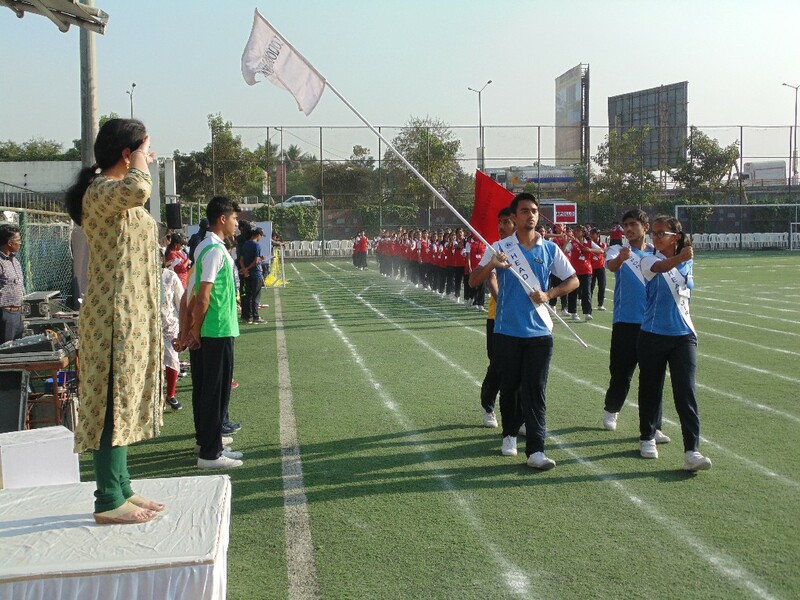 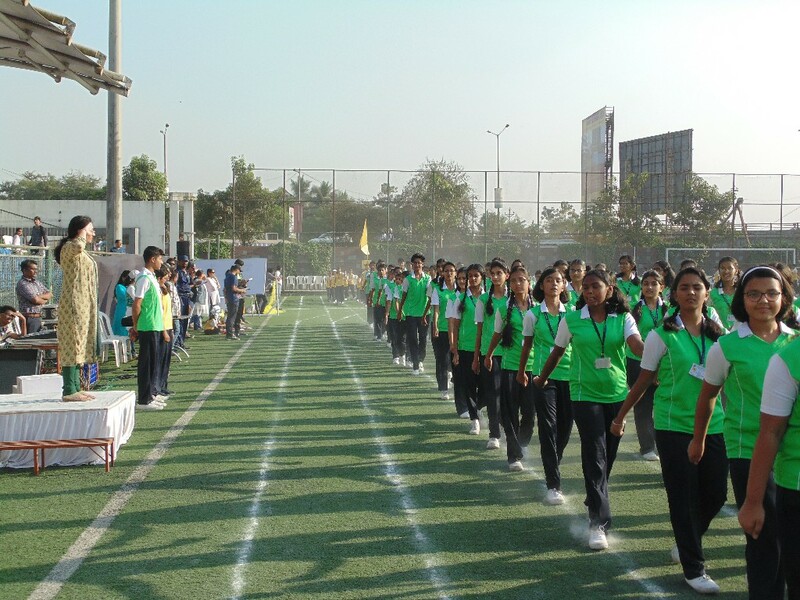 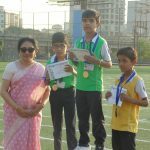 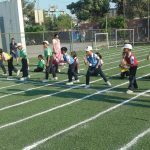 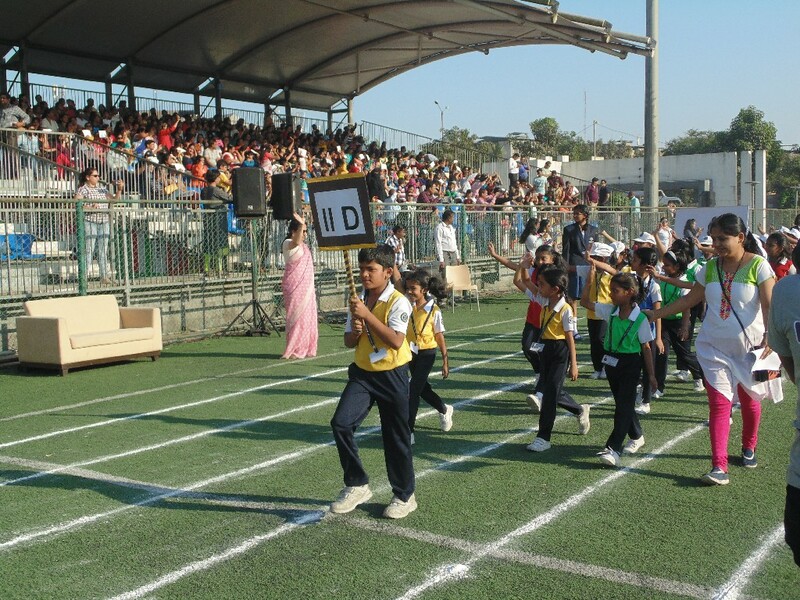 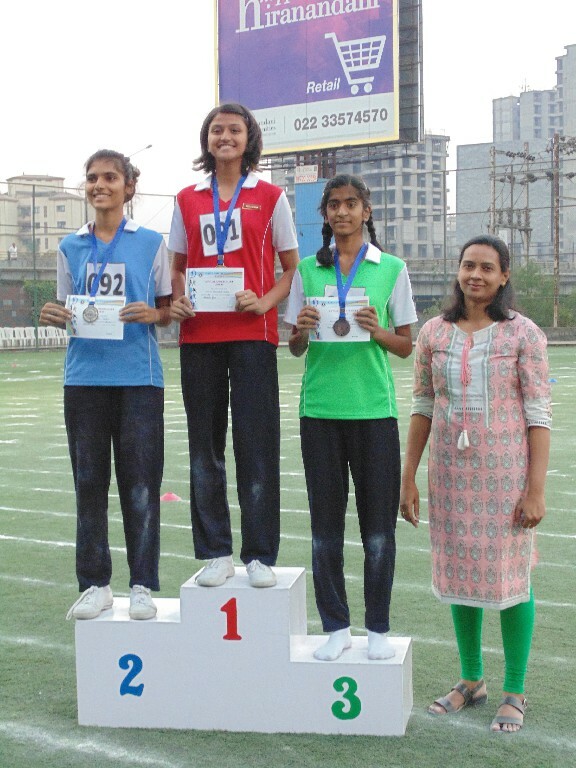 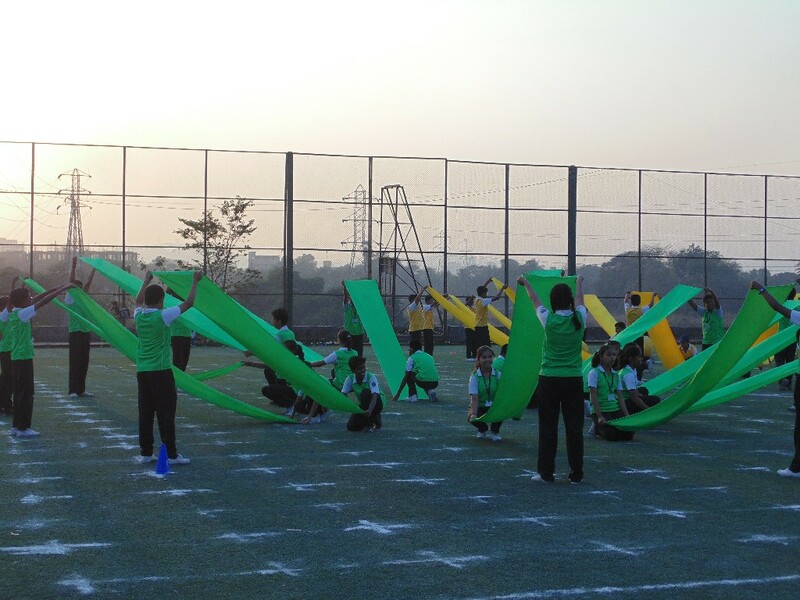 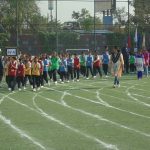 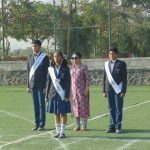 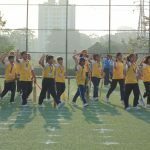 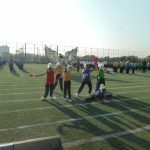 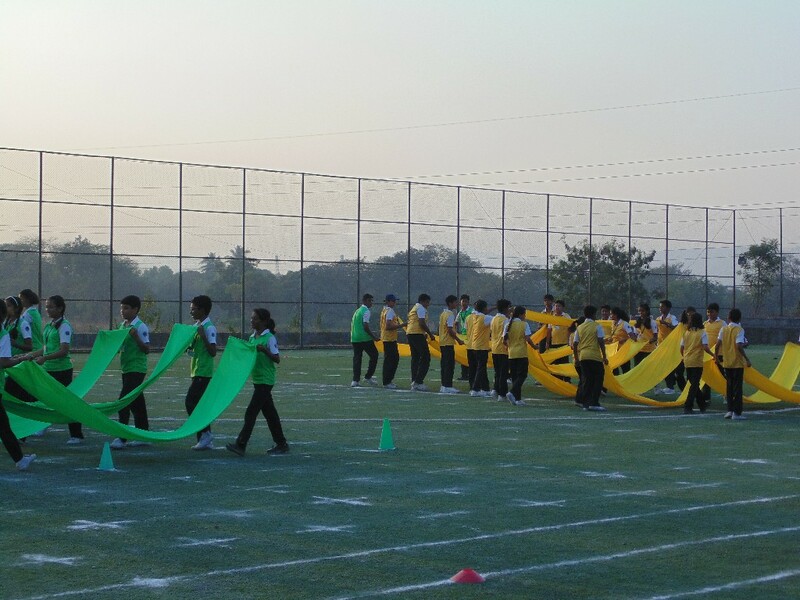 The Principal of the school, Mrs. Aditi Banerji, urged the students to make the most of the day, saying,” Fly high for eagle, soar high like the eagle”, thereby declaring the sports meet open. 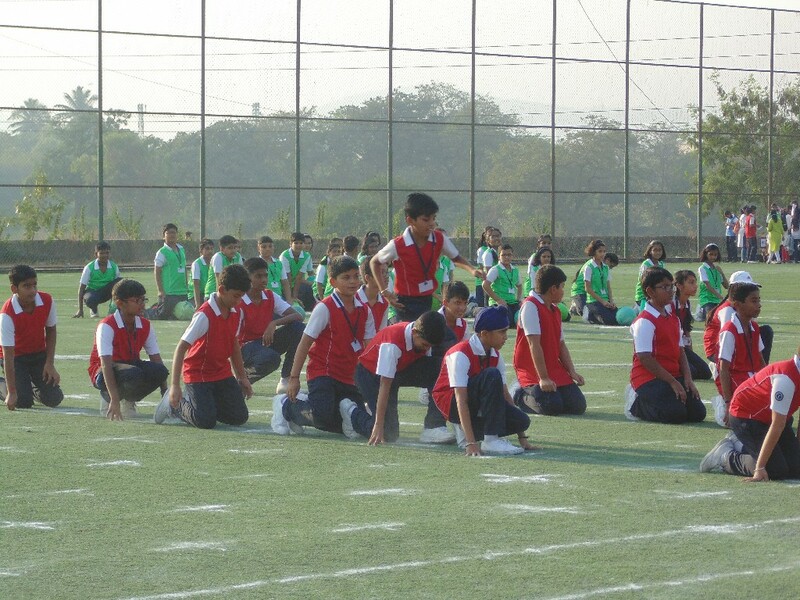 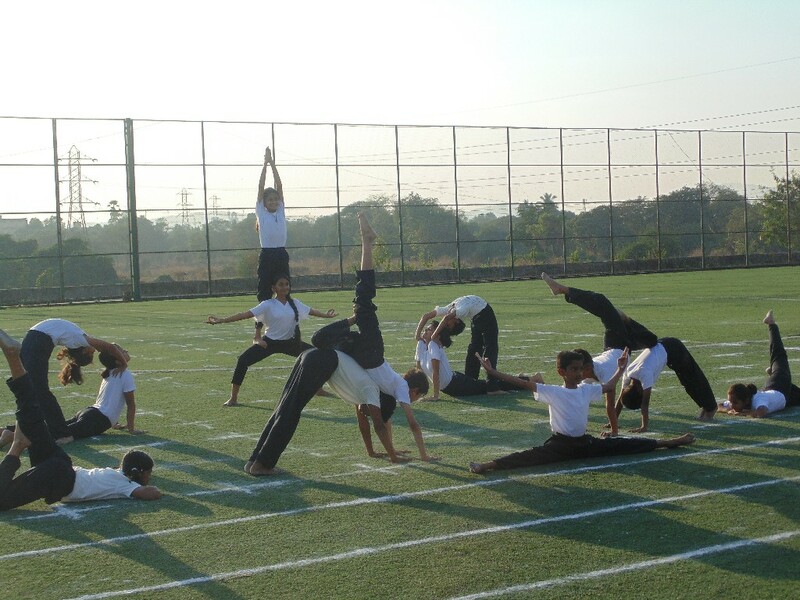 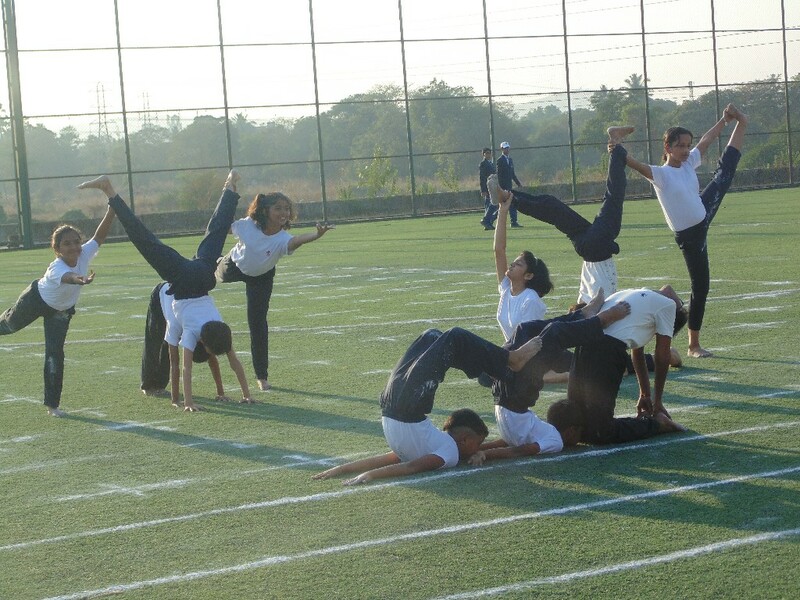 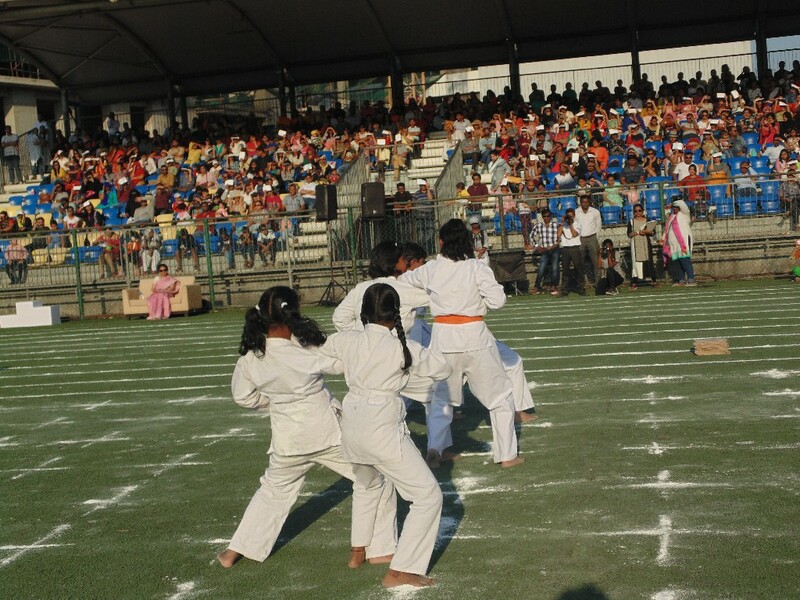 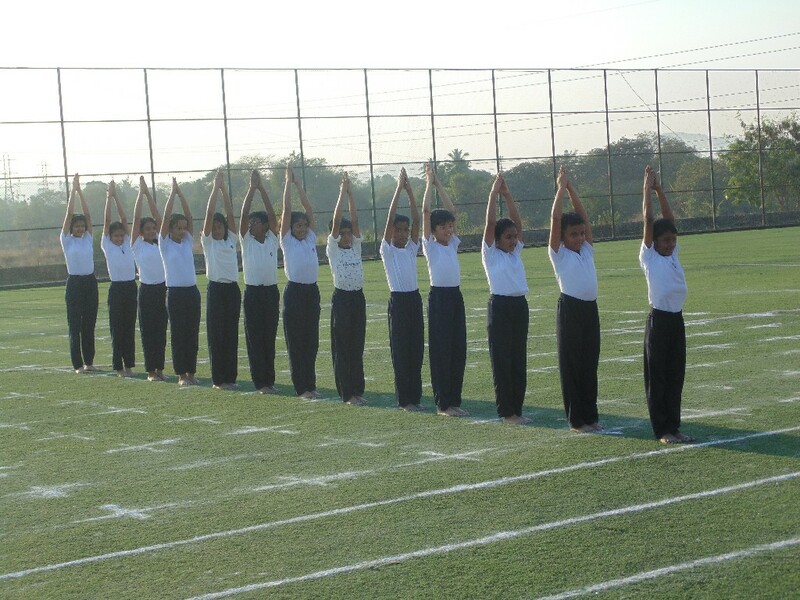 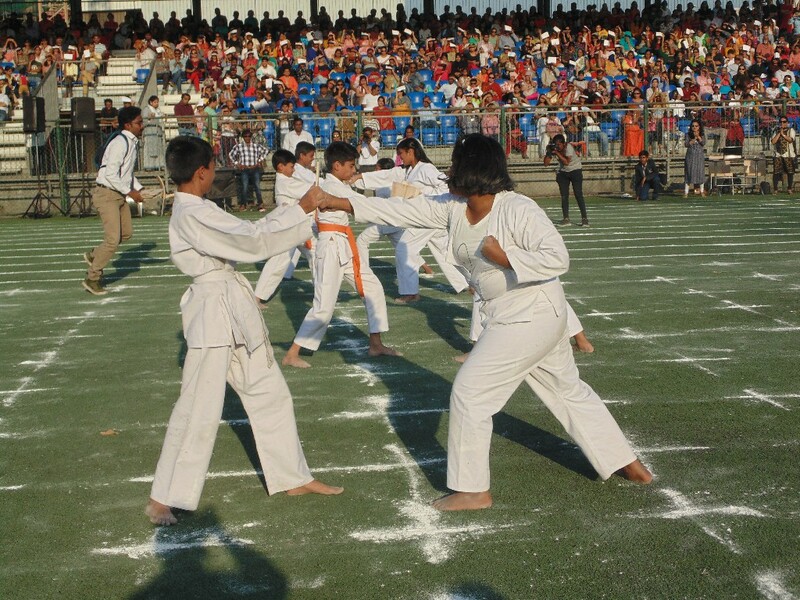 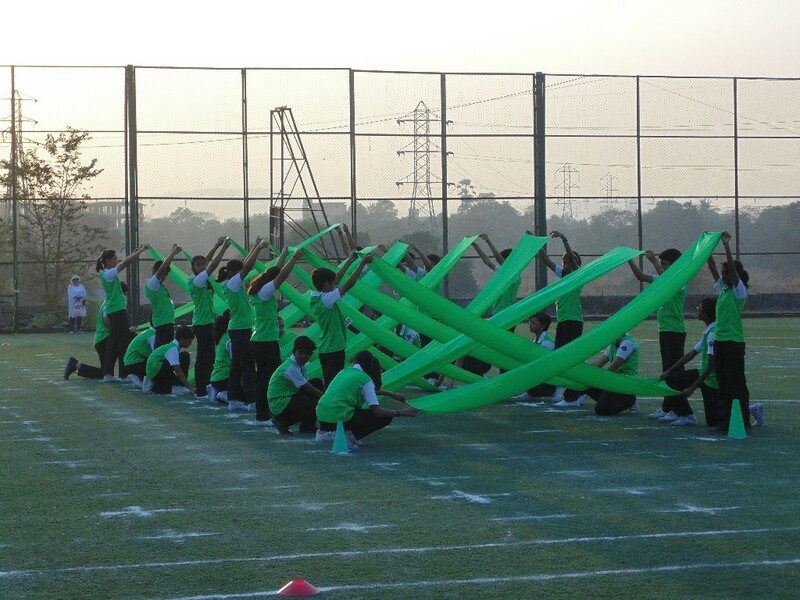 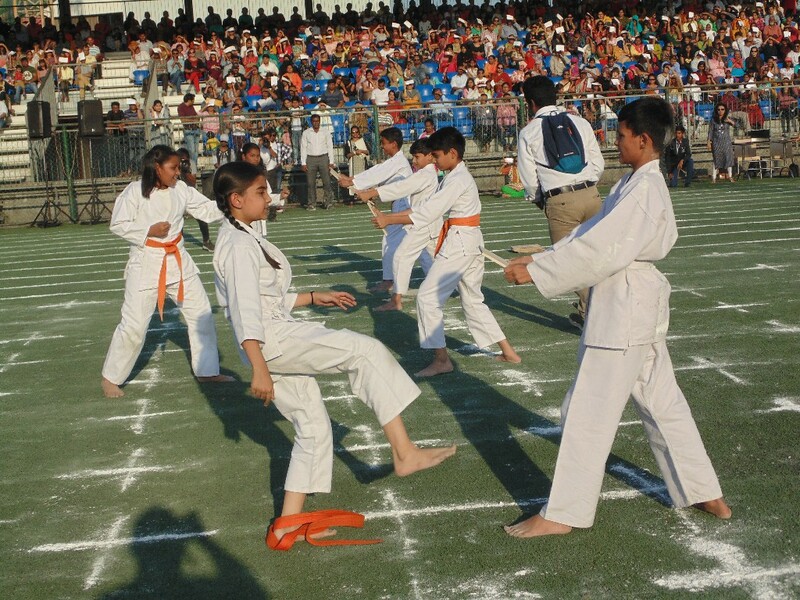 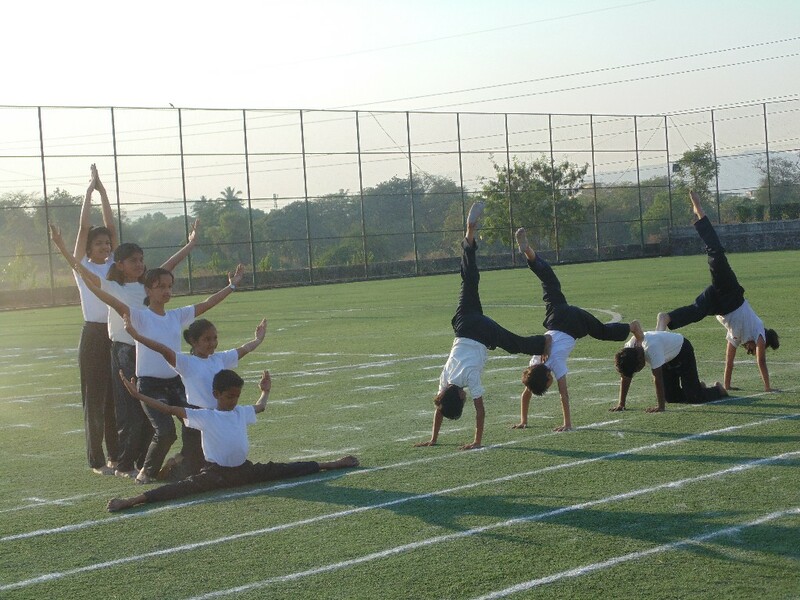 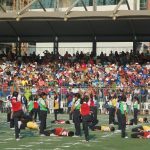 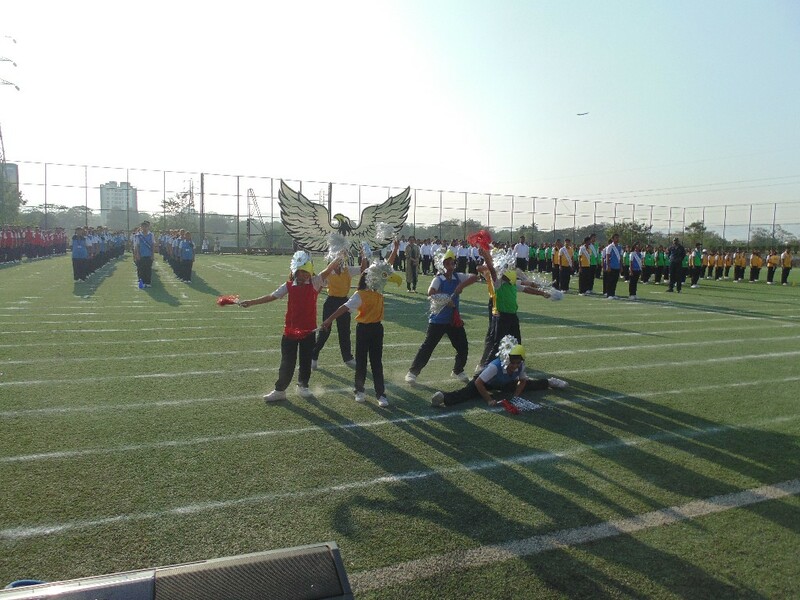 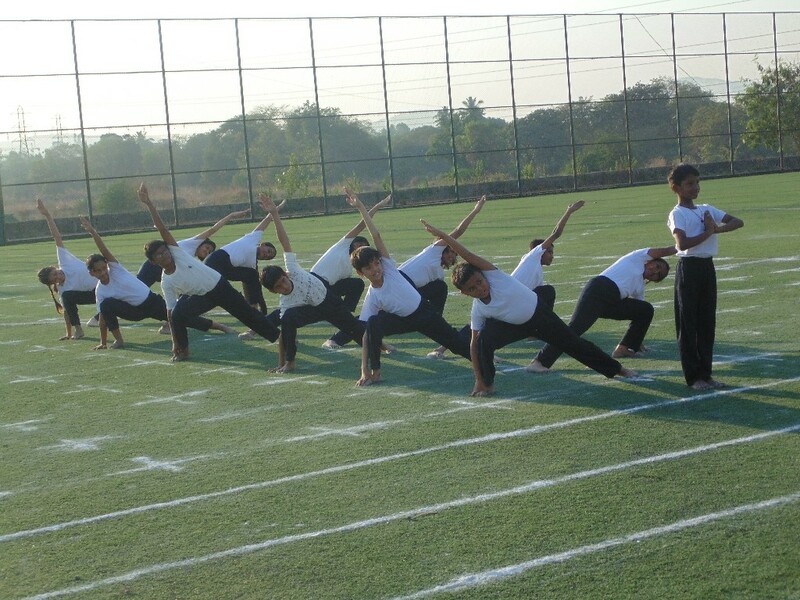 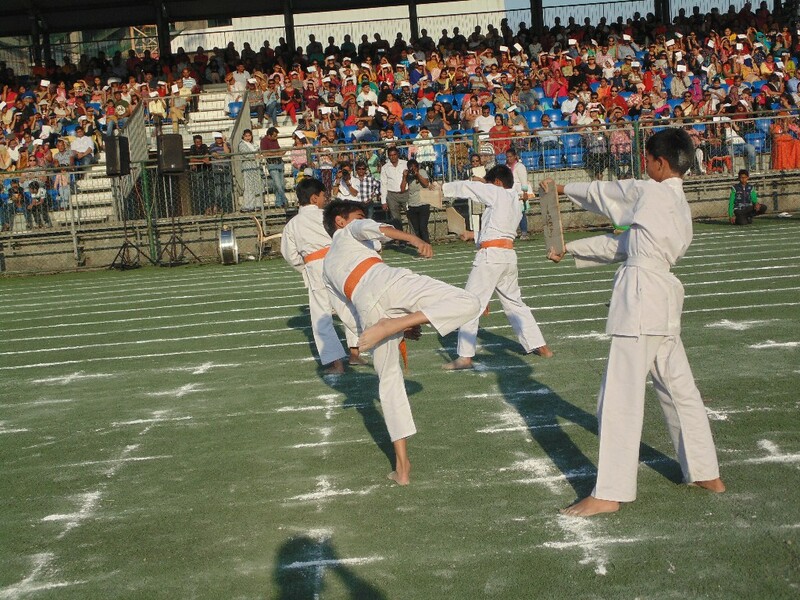 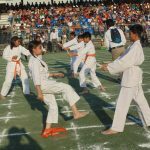 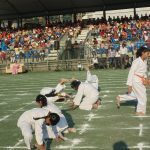 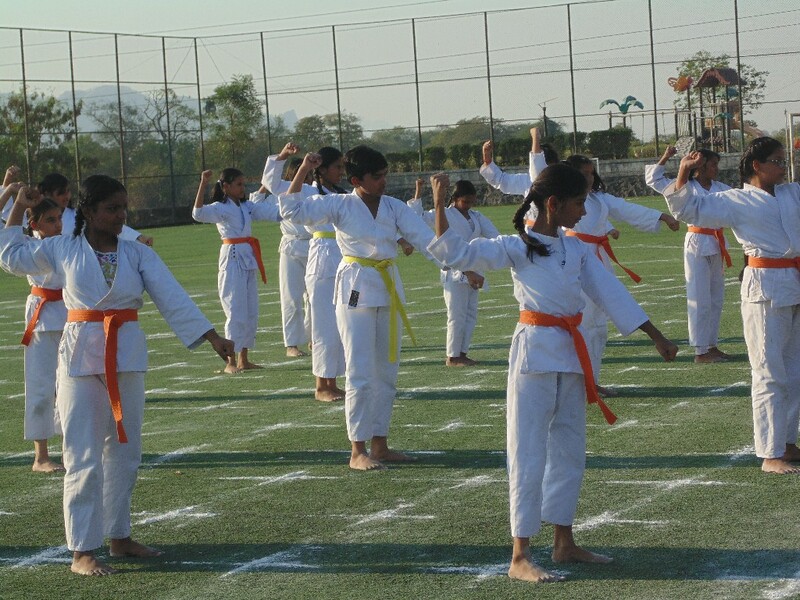 The students performed a drill in front of the audience which was visually enthralling. 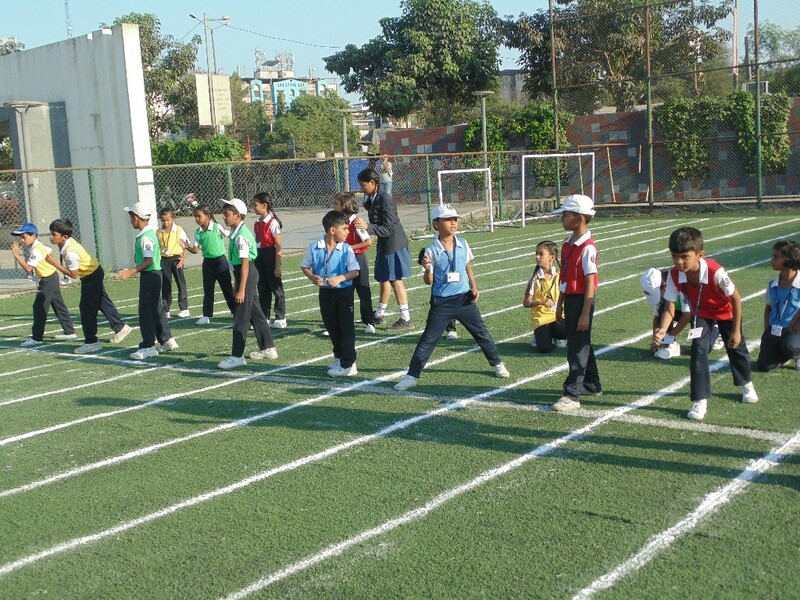 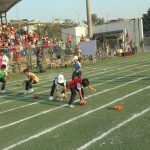 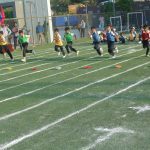 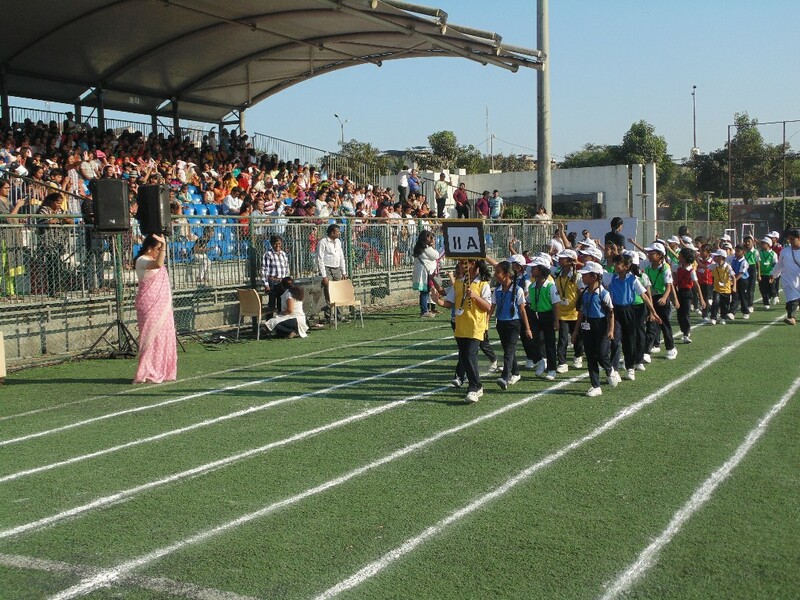 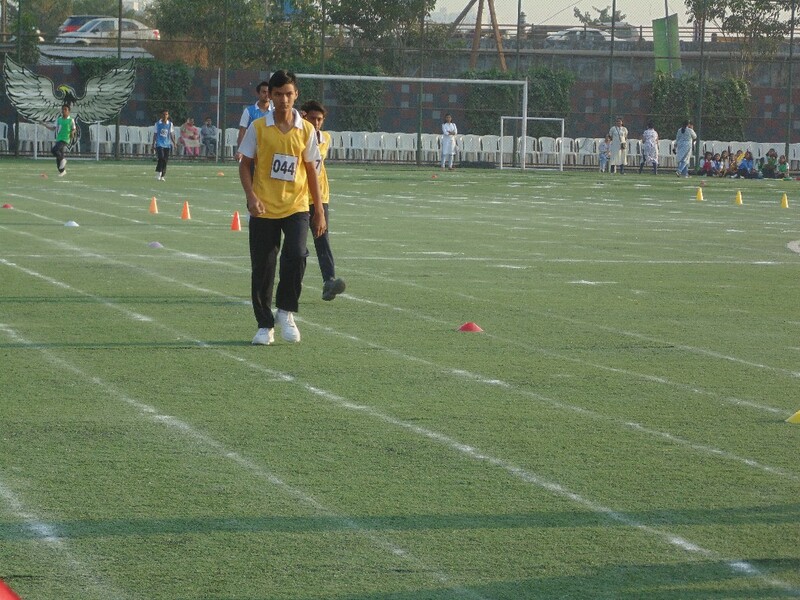 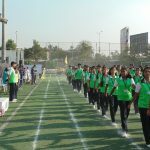 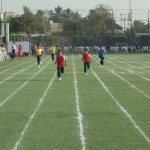 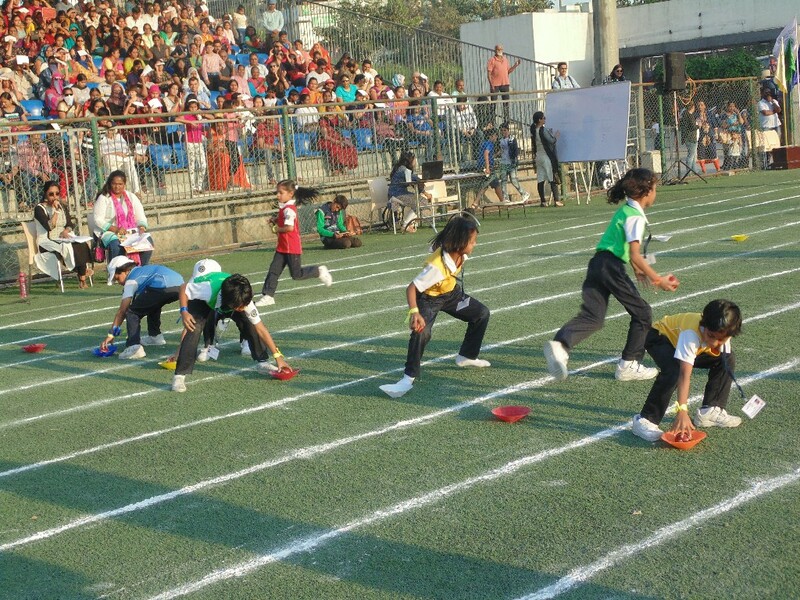 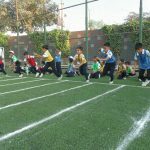 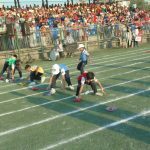 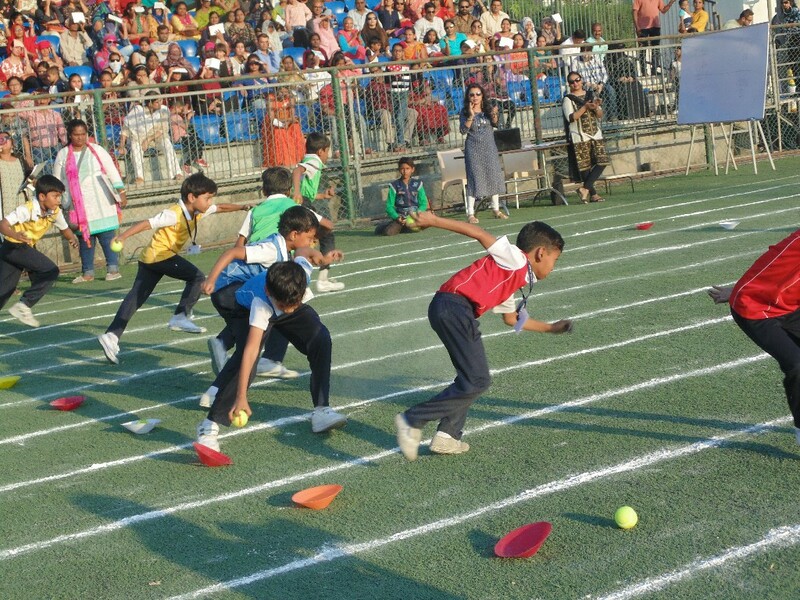 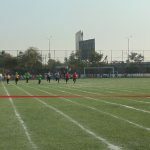 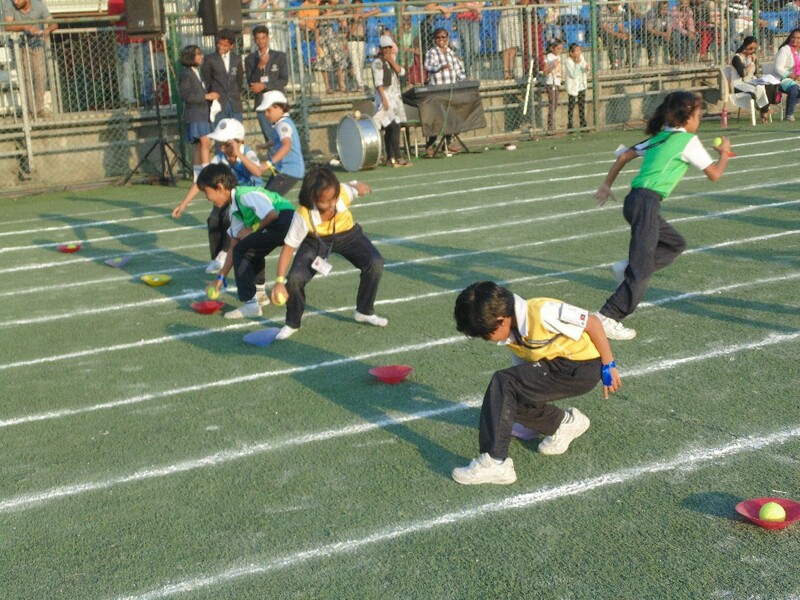 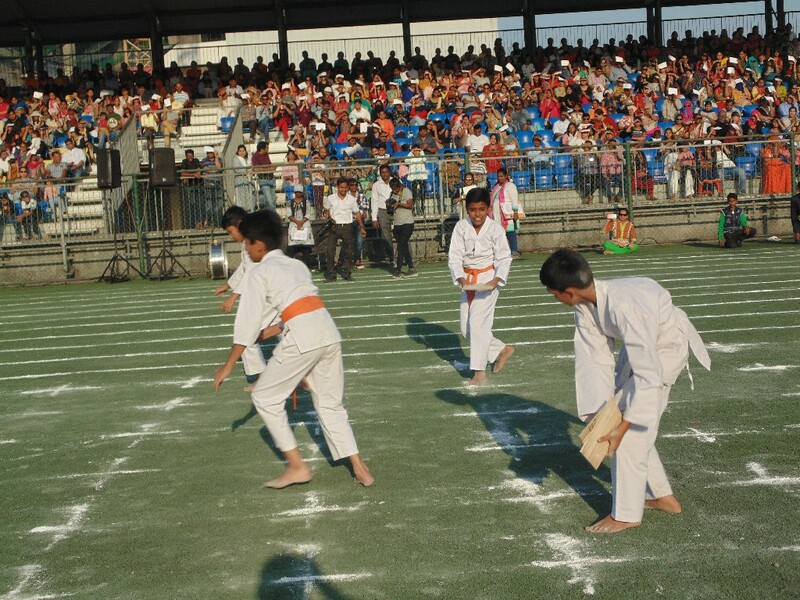 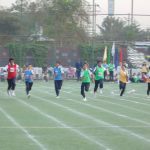 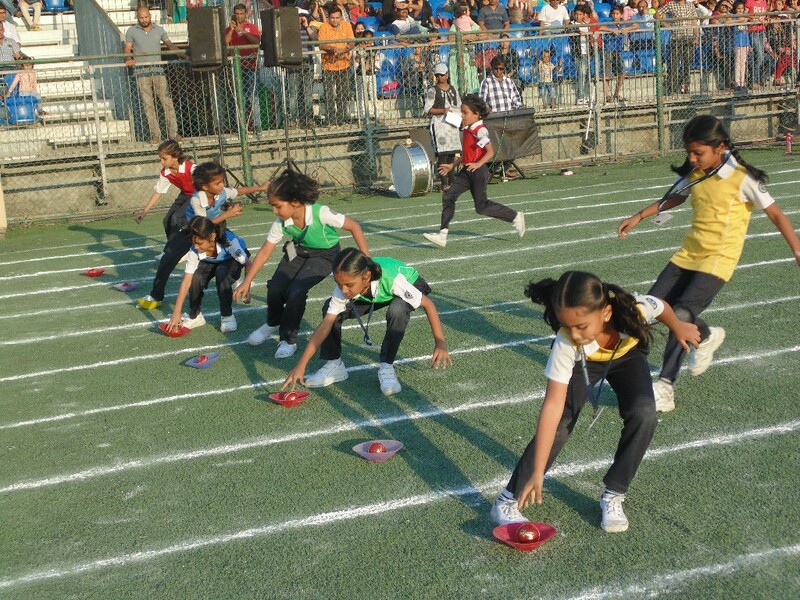 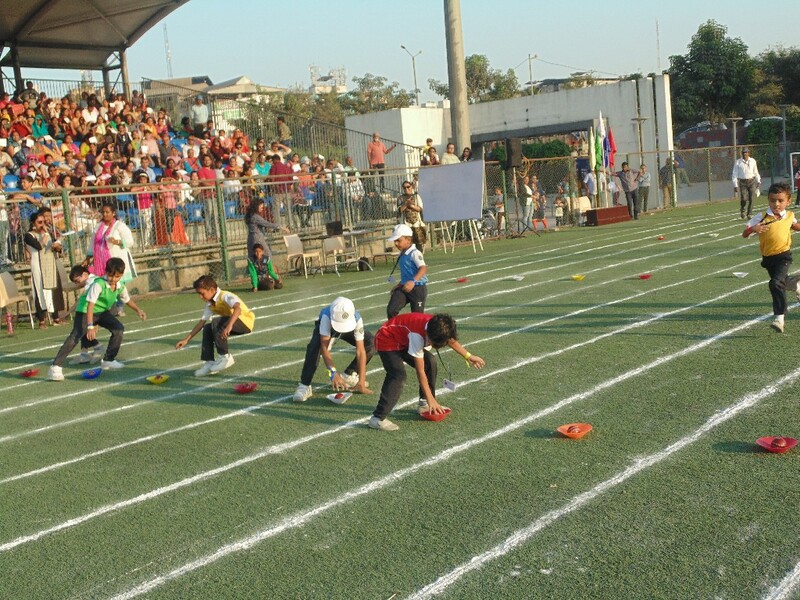 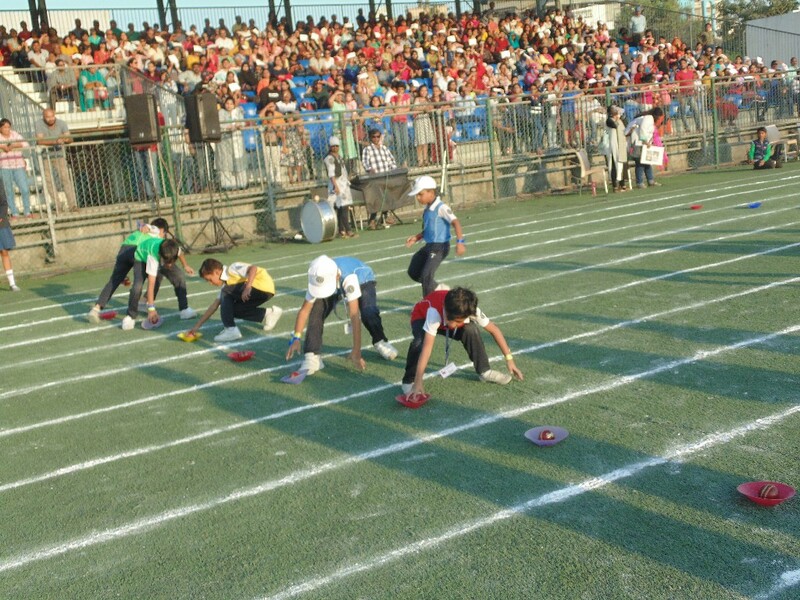 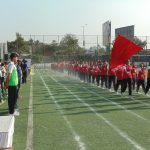 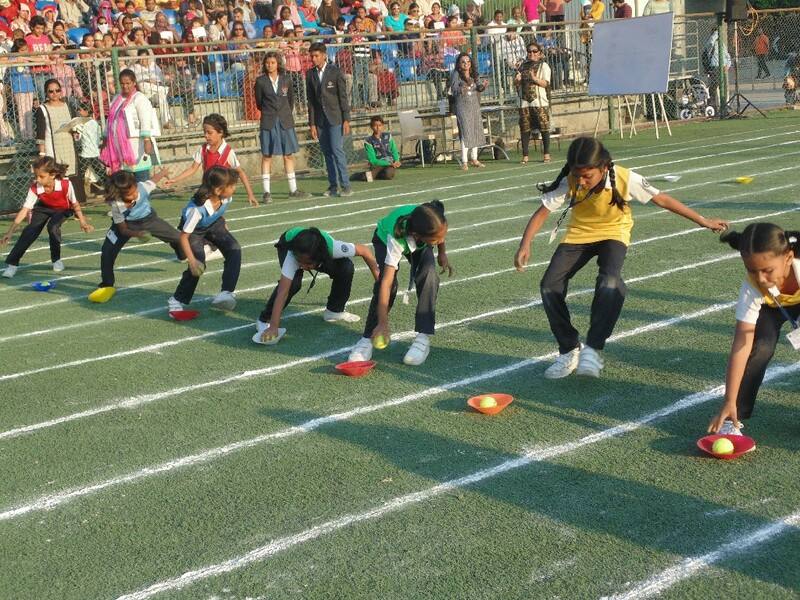 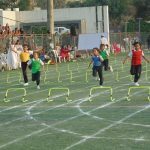 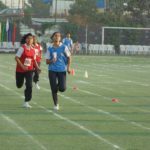 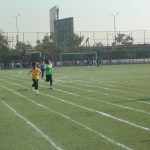 This was followed by the much-awaited track events included the classic 100m sprints and 200m races. 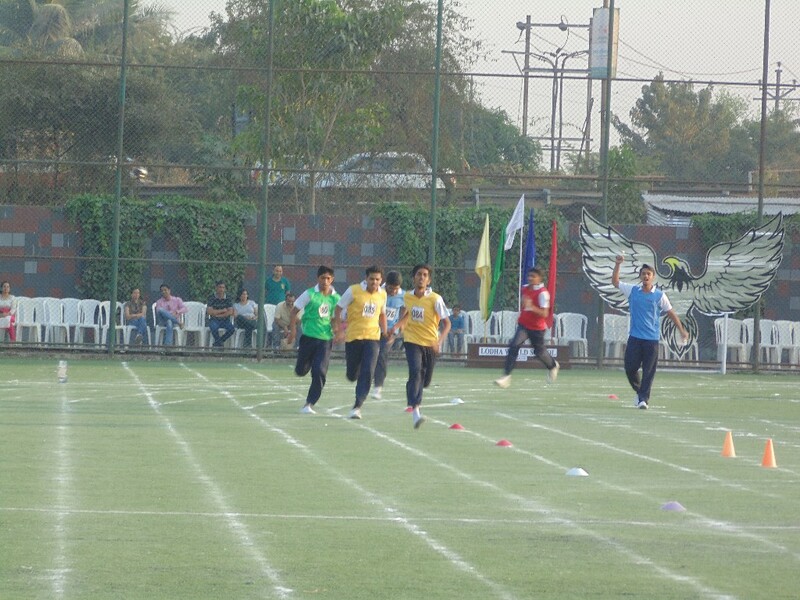 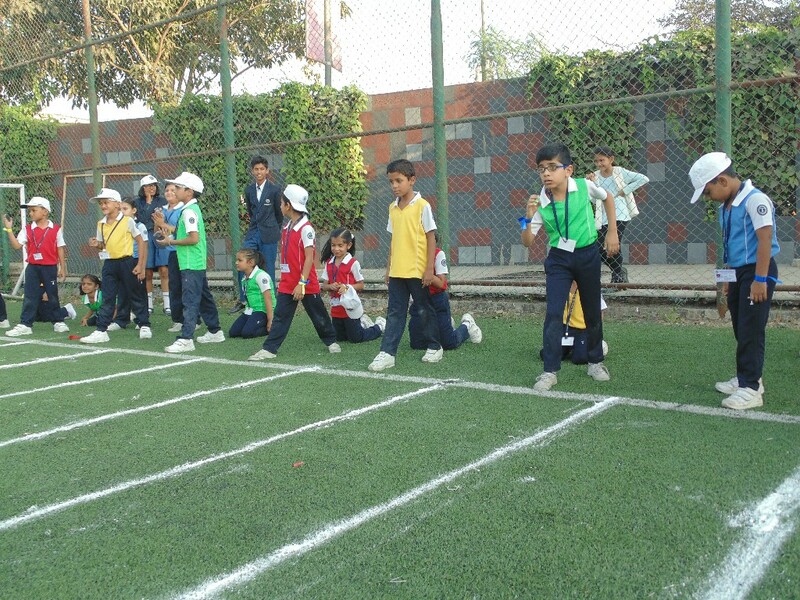 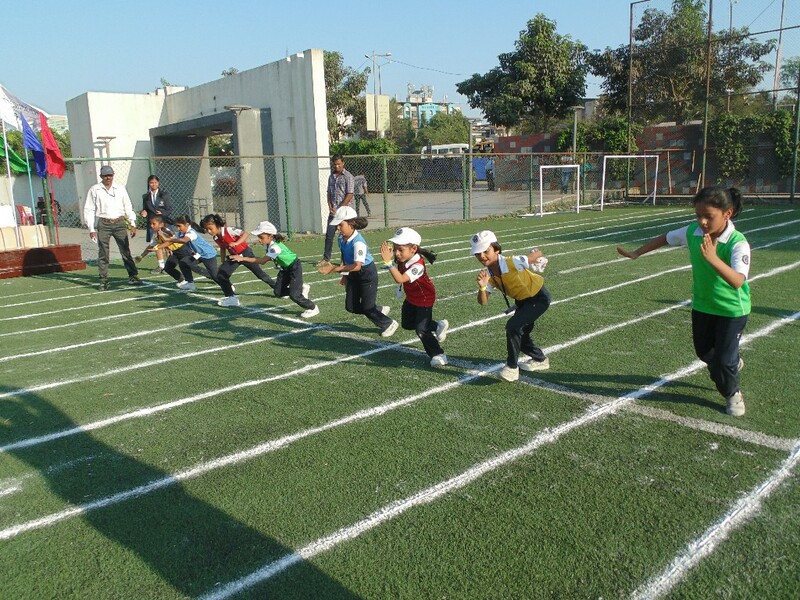 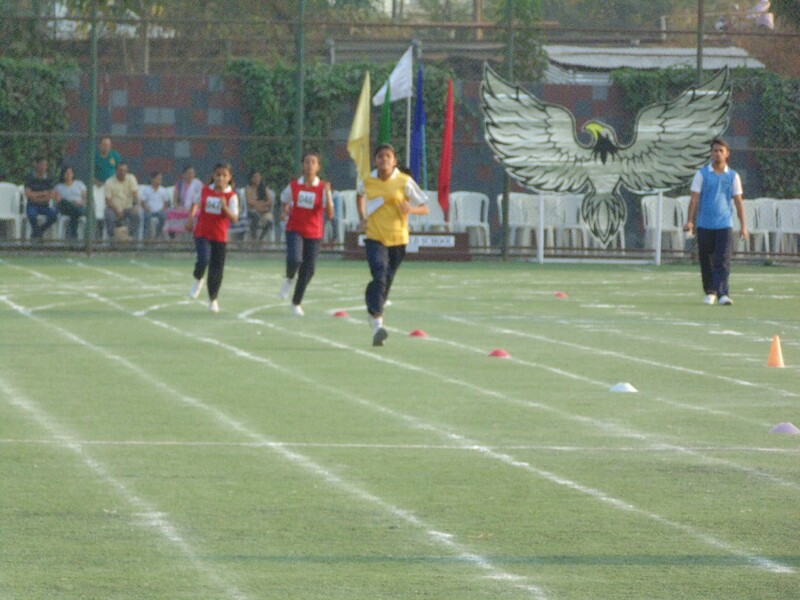 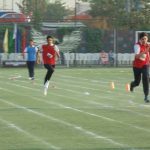 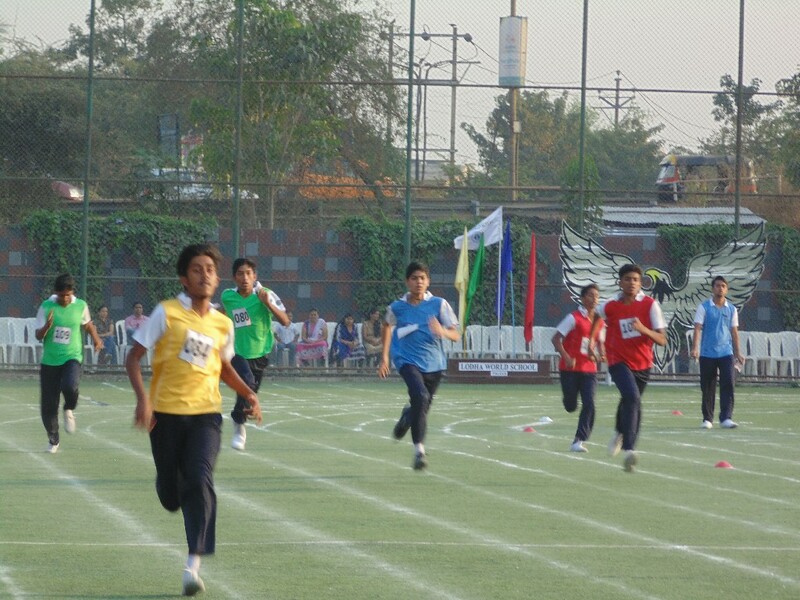 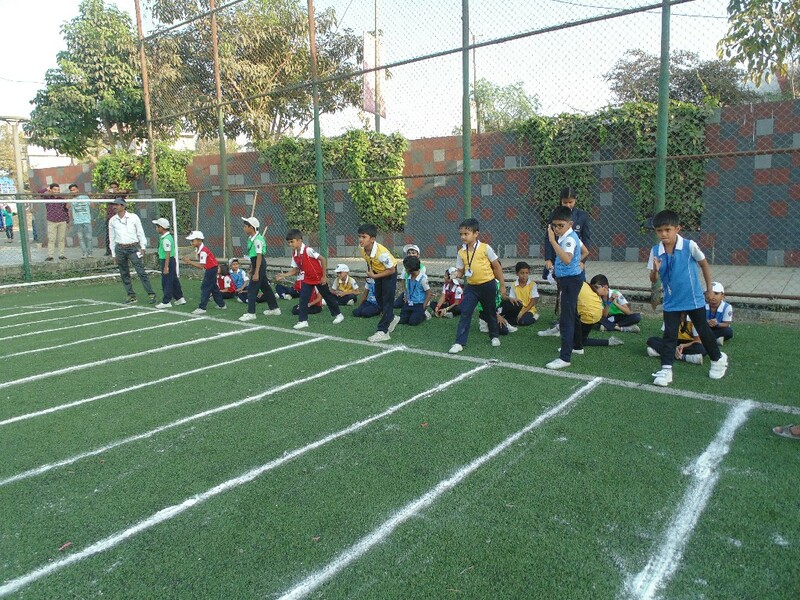 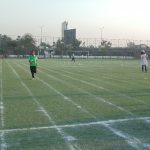 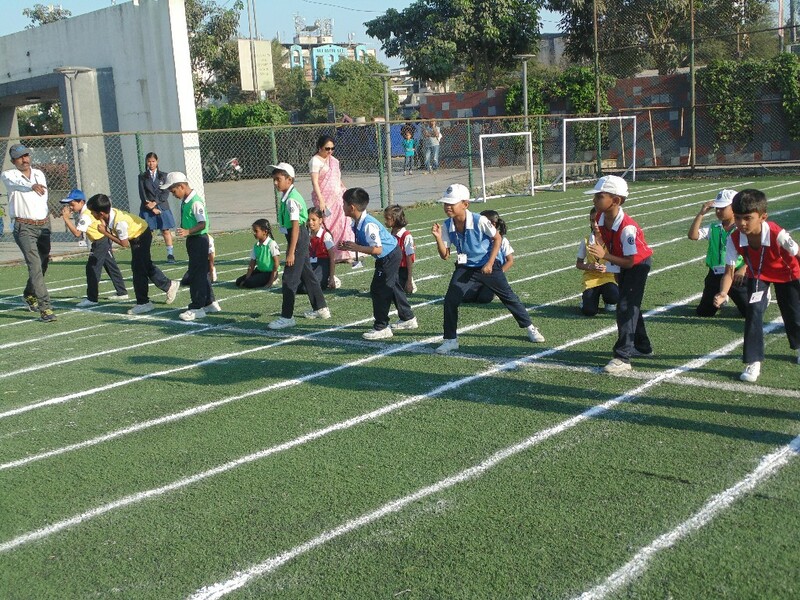 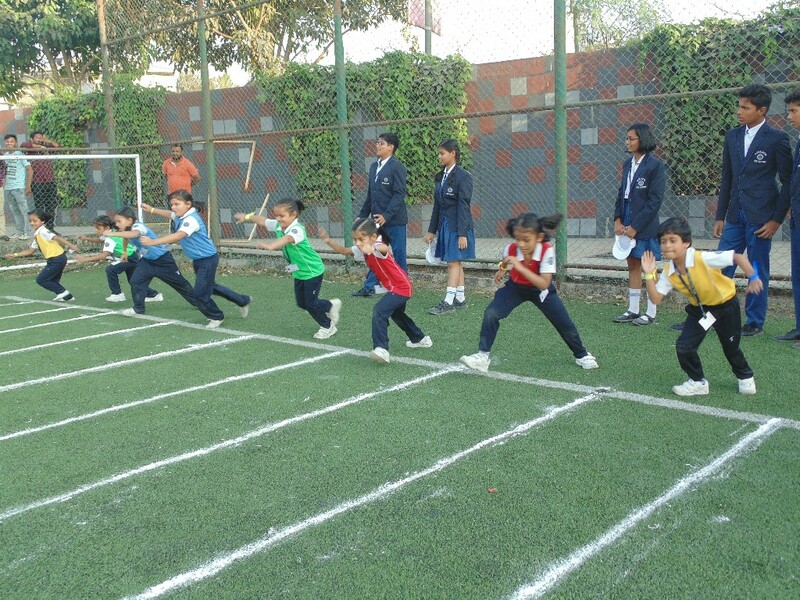 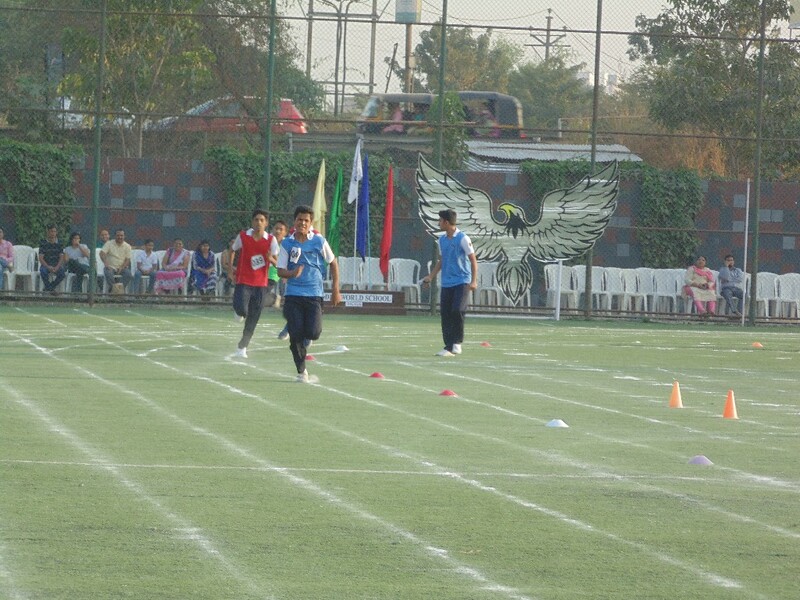 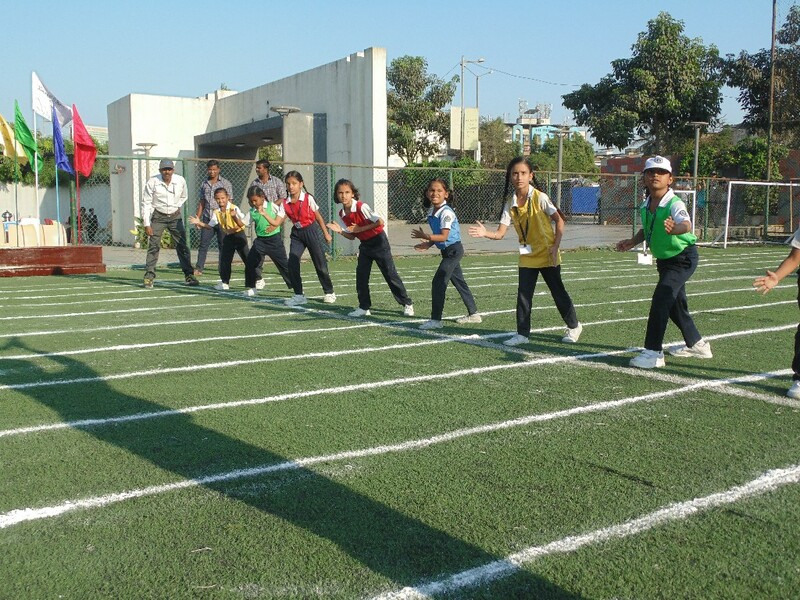 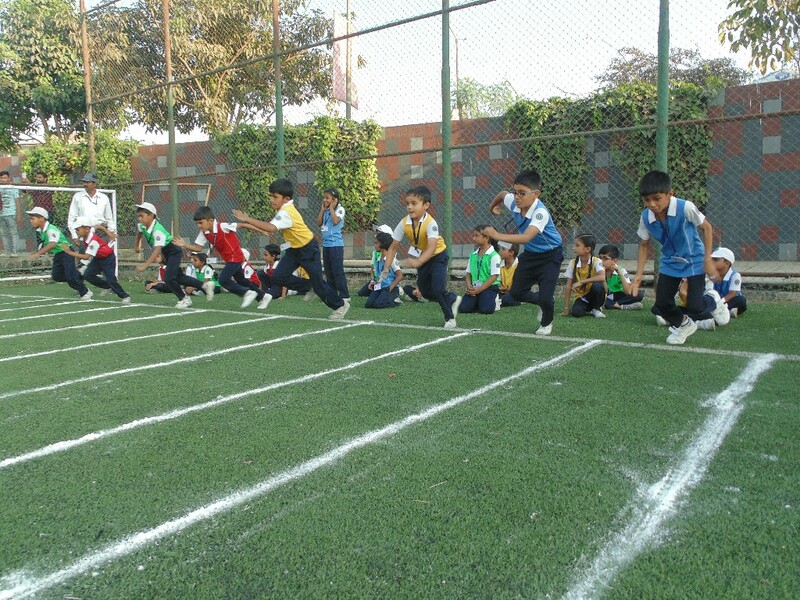 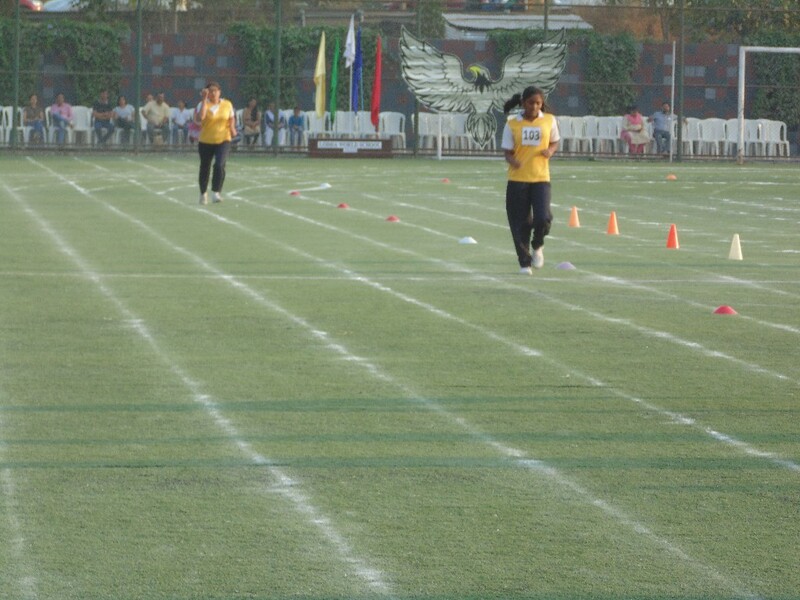 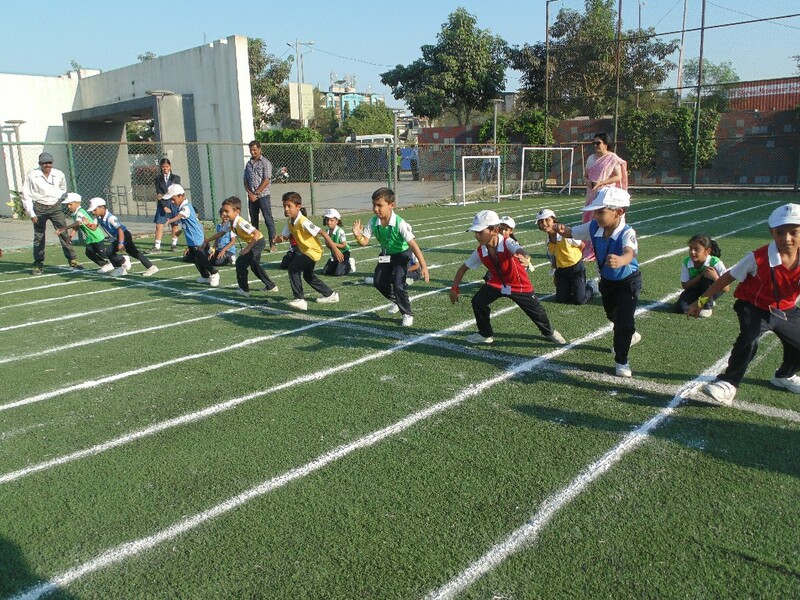 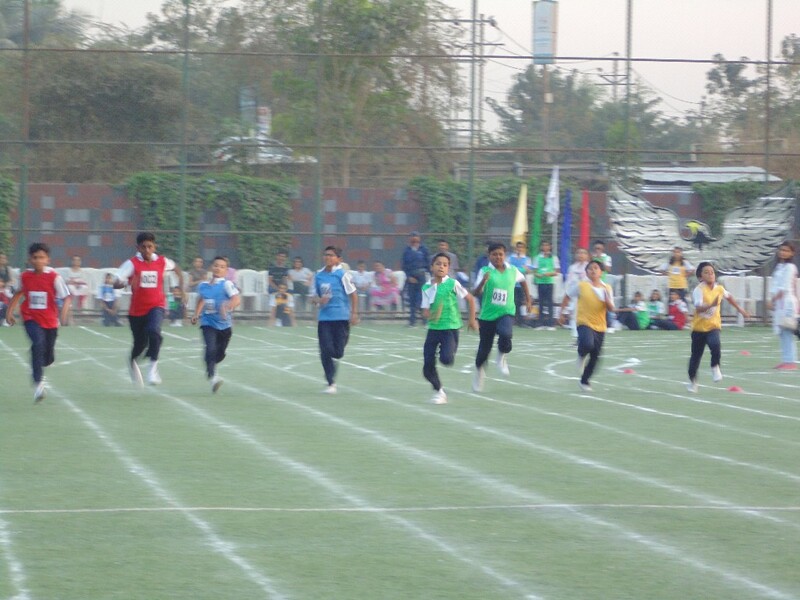 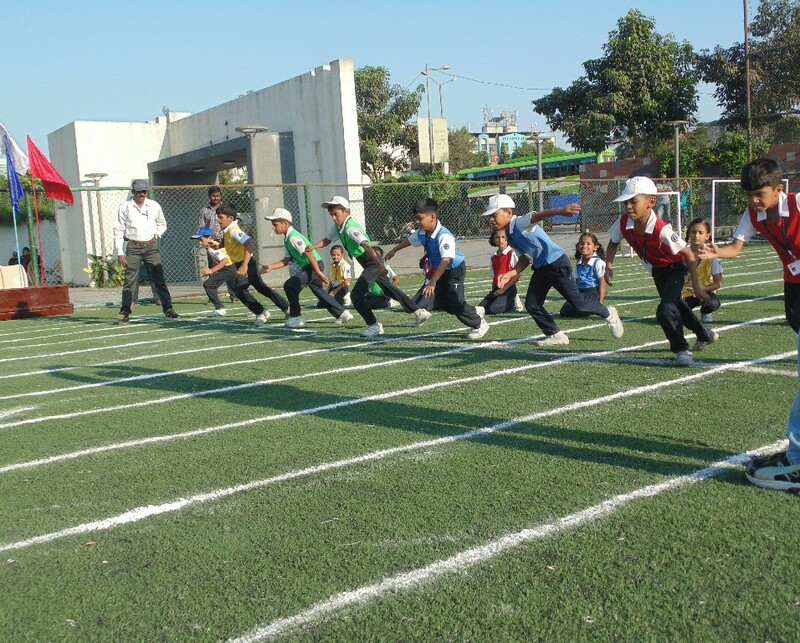 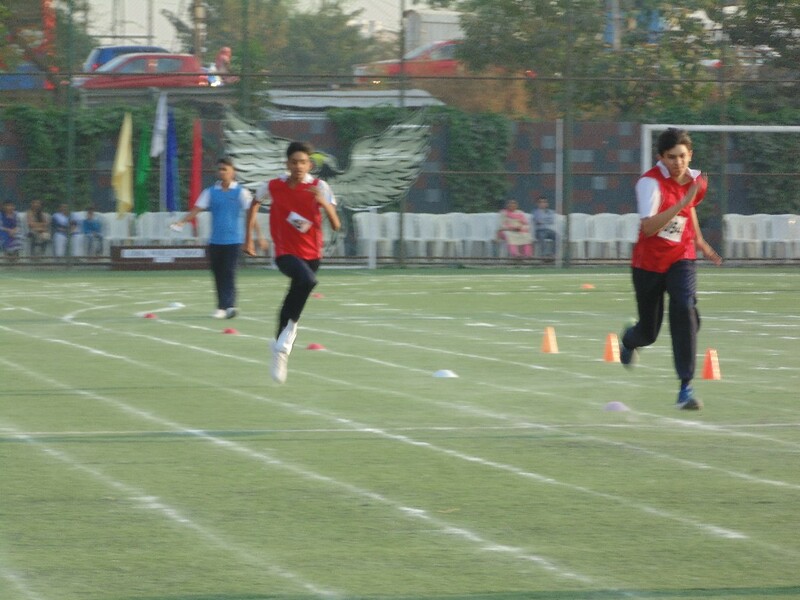 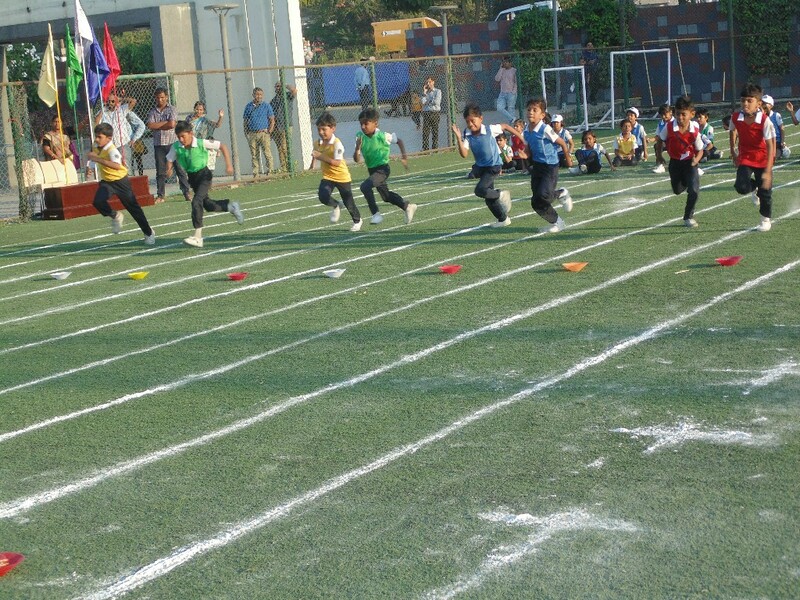 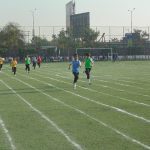 The 400m lap race tested not only raw speed, but also the stamina and strategy of the participants. 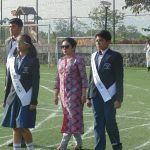 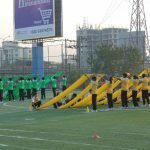 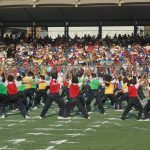 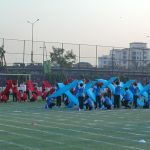 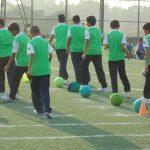 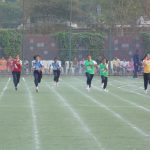 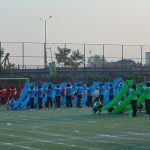 The teachers, parents and housemates cheered on the participants, but the most motivating factor was probably helping their house win the house trophy. 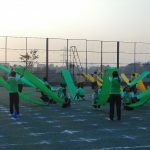 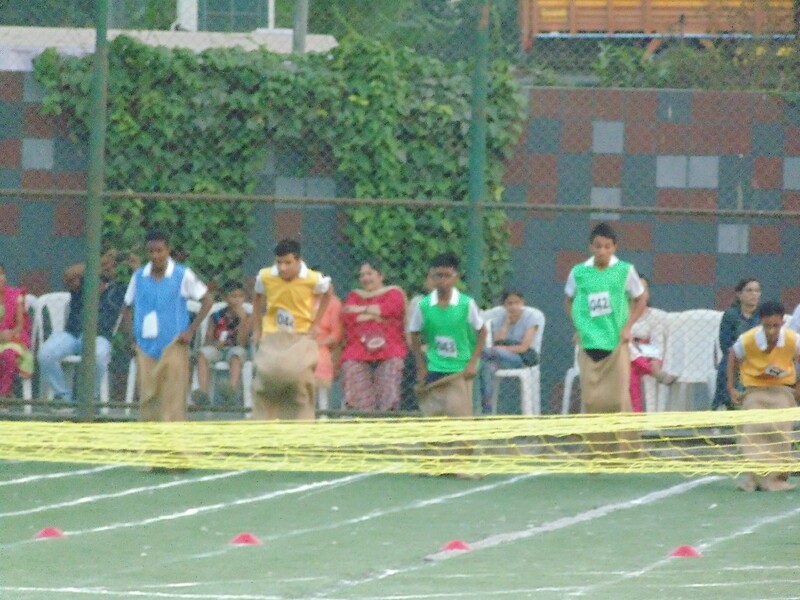 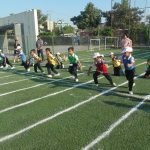 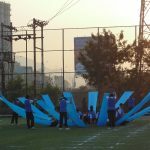 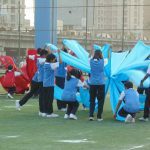 There was also an obstacle race, which was a combination of a sack race, crawling under the net & hurdles. 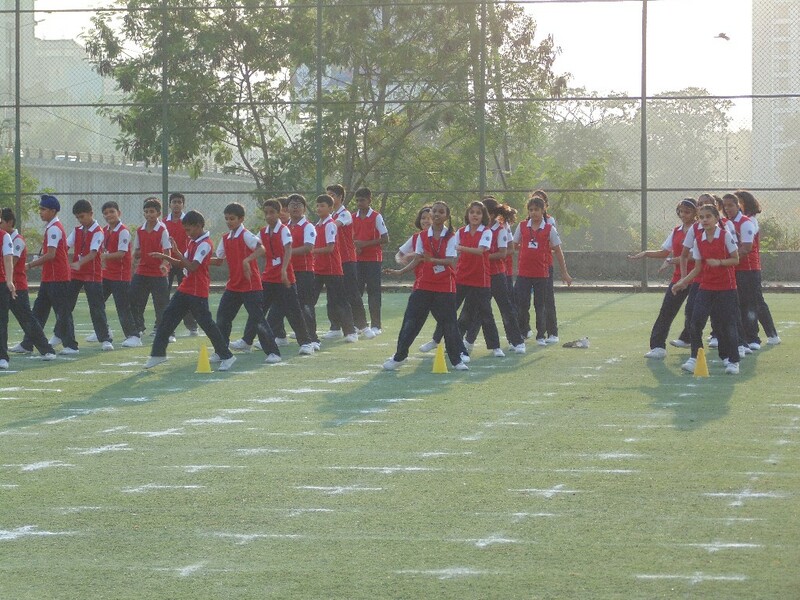 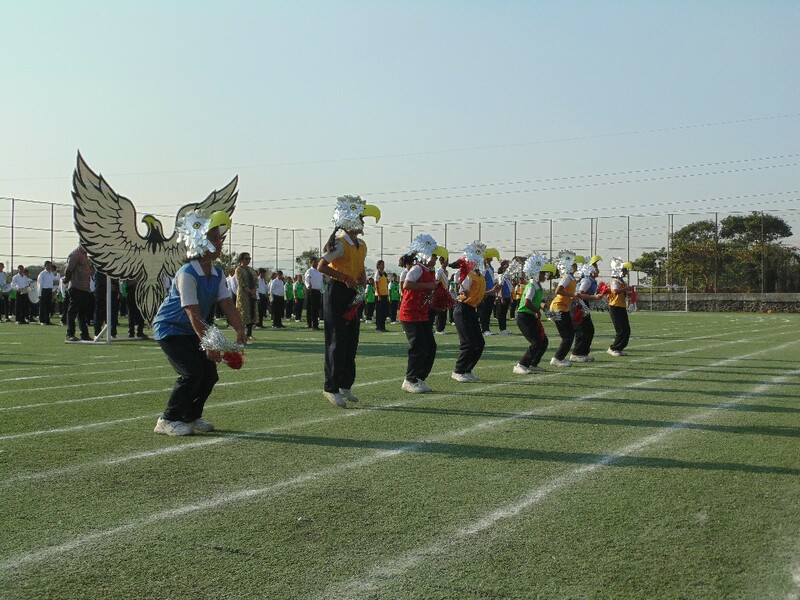 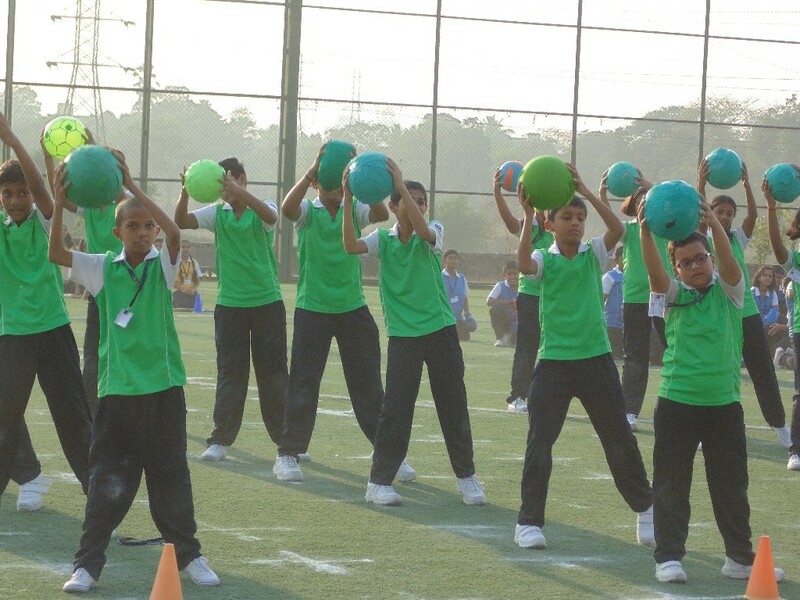 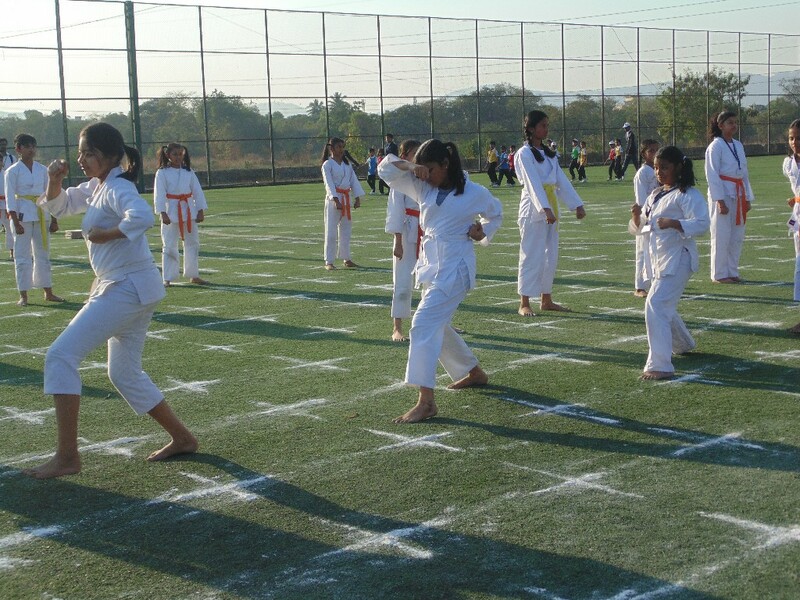 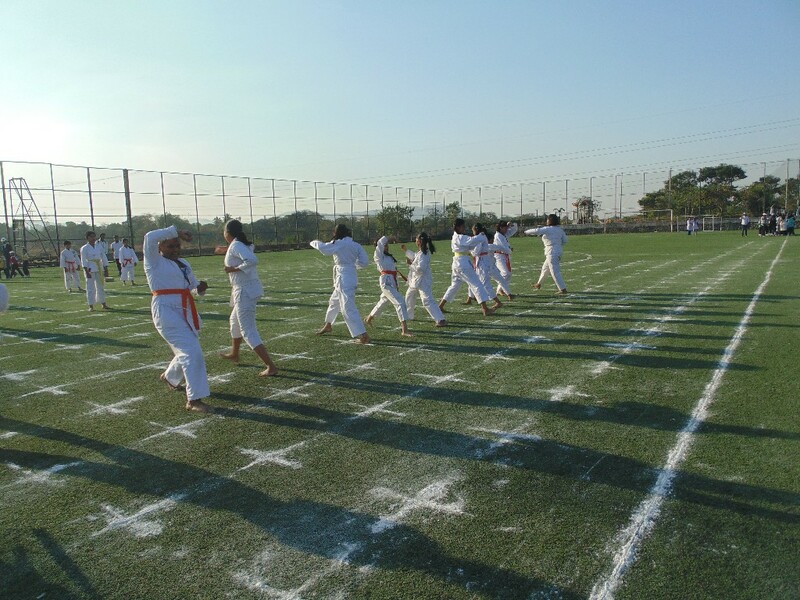 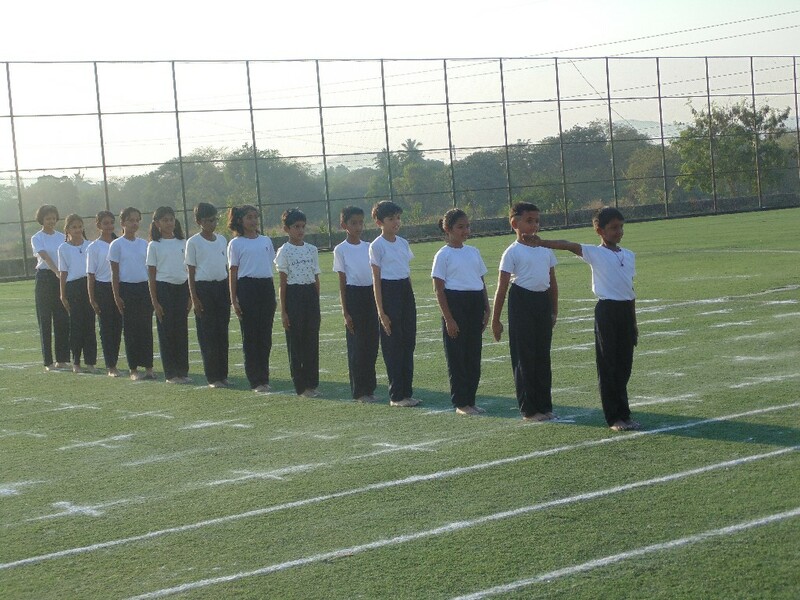 The students then presented a Mass Drill. 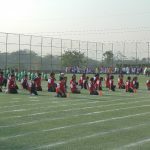 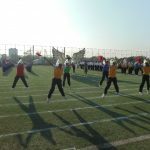 With each foot falling perfectly to the beat of the drum, the students produced various formations, finally ending up with by forming the word ‘INDIA’, receiving thunderous applause from the audience. 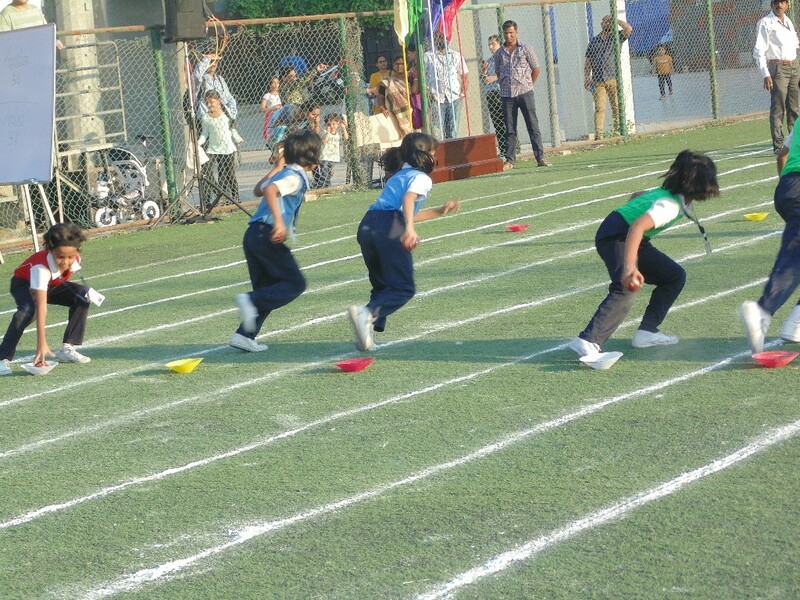 The hurdle and the relay races were the last track events to follow, but also the most entertaining. 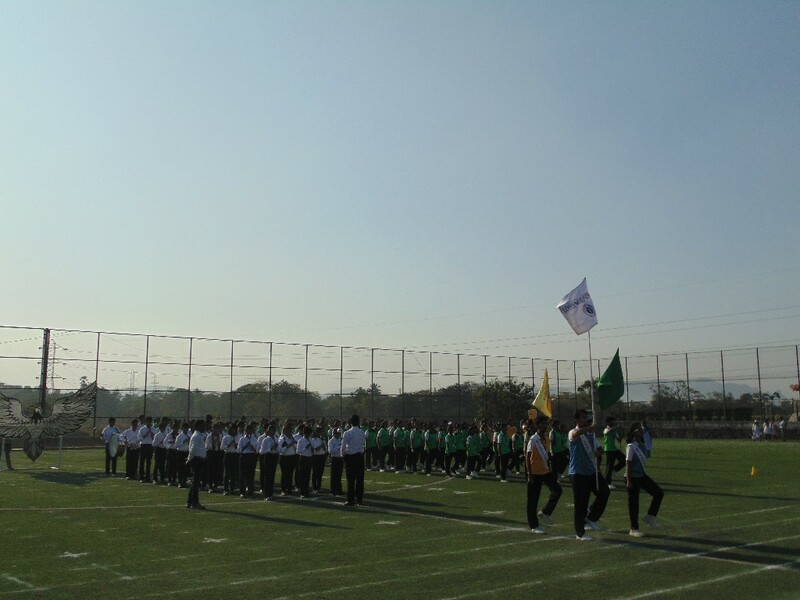 Next was the Flag Drill, highlighting freedom, which again was an astounding piece of work. 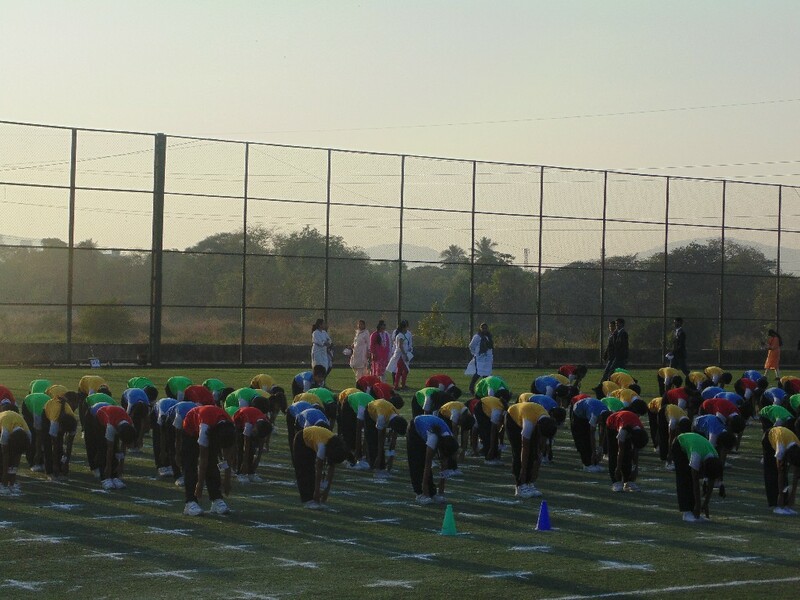 The Maharashtrian traditional dance form ‘Lezim’ was performed by the students of higher classes, and the enjoyment of those students was equally met by the spectators. 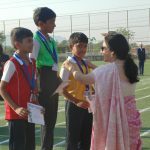 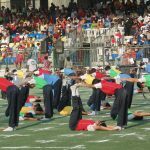 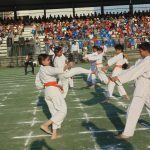 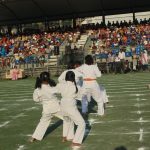 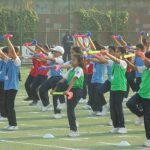 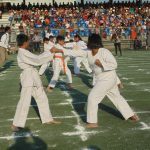 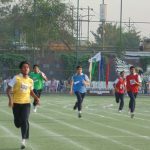 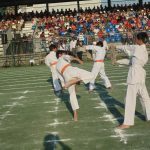 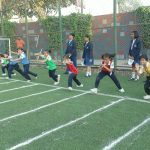 This was followed by the Tug of War inter-house matches, which were played in a Best Of Three format, both for girls and boys. 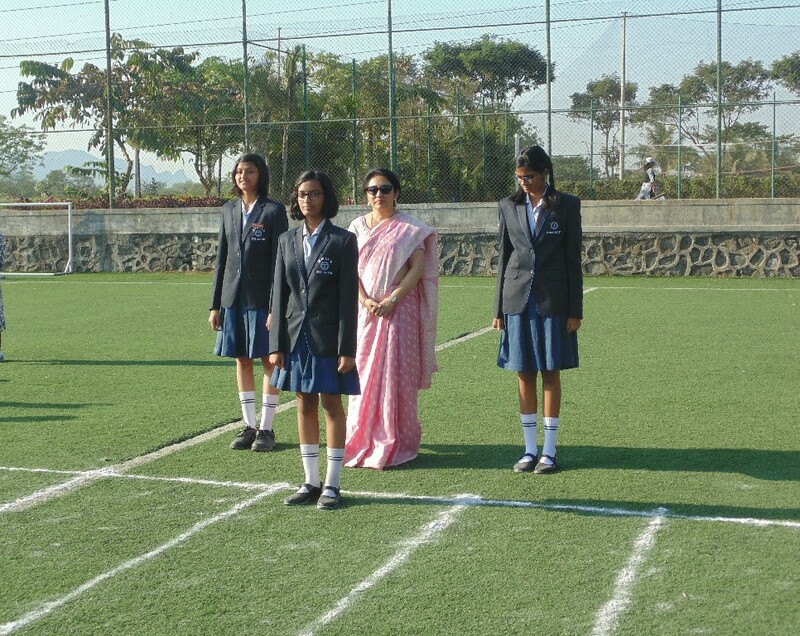 After the vote of thanks. 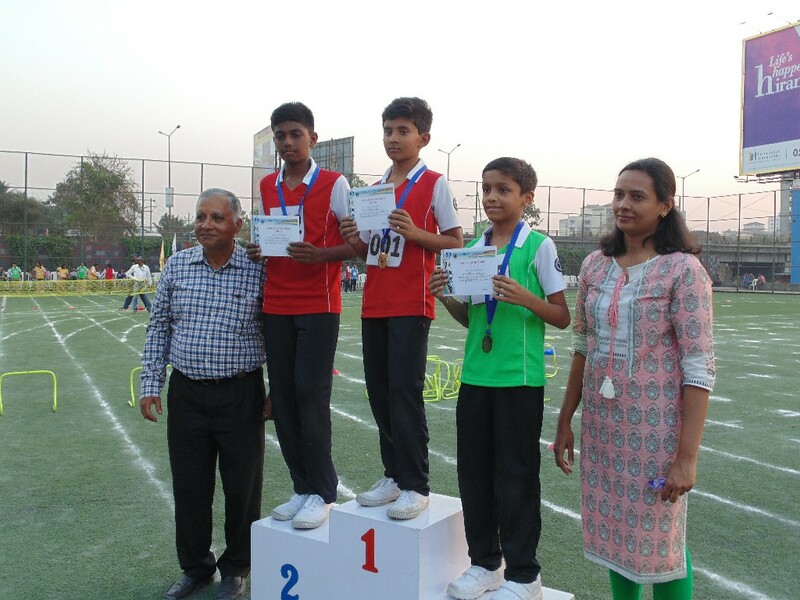 The results of the day were announced. 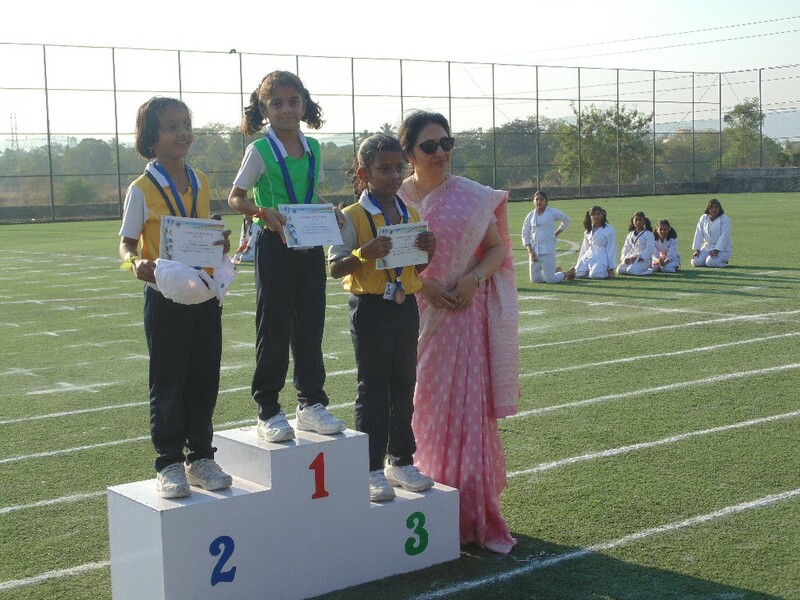 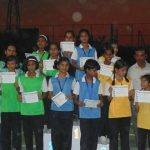 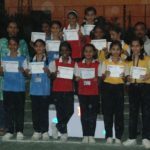 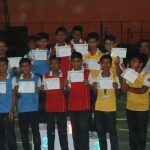 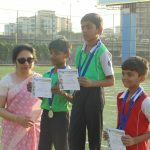 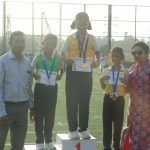 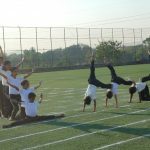 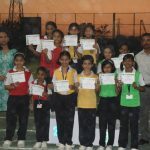 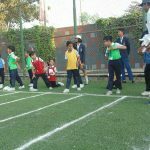 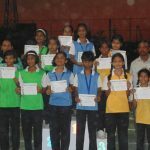 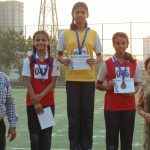 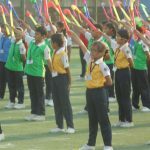 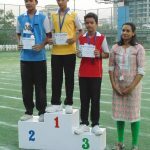 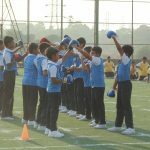 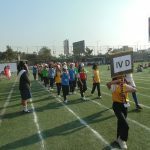 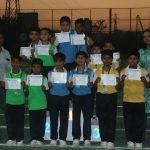 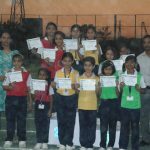 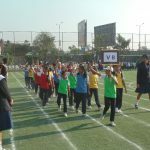 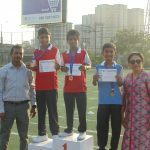 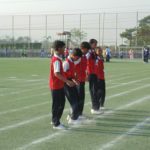 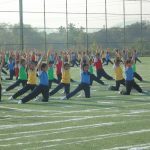 After the awards for the Best Sportsperson Boy and Girl were given, the results of The House Championship were announced. 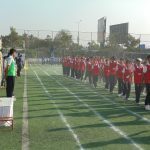 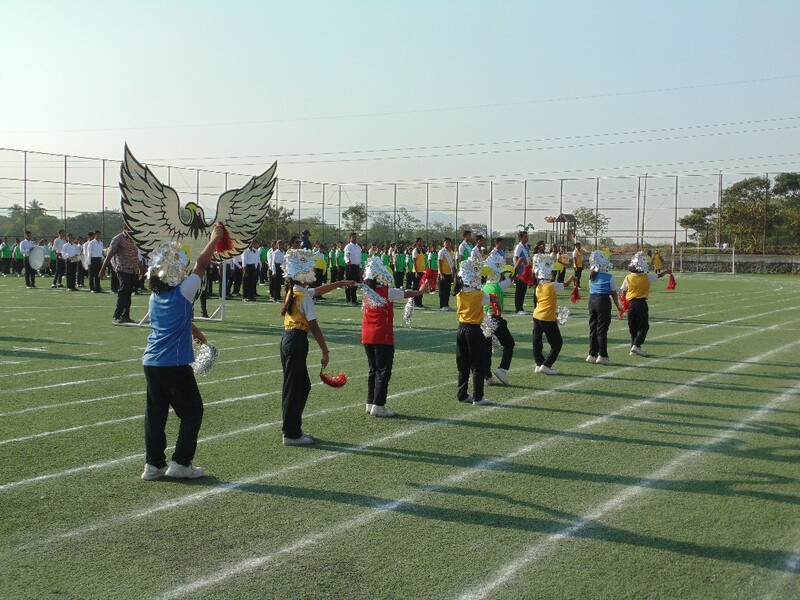 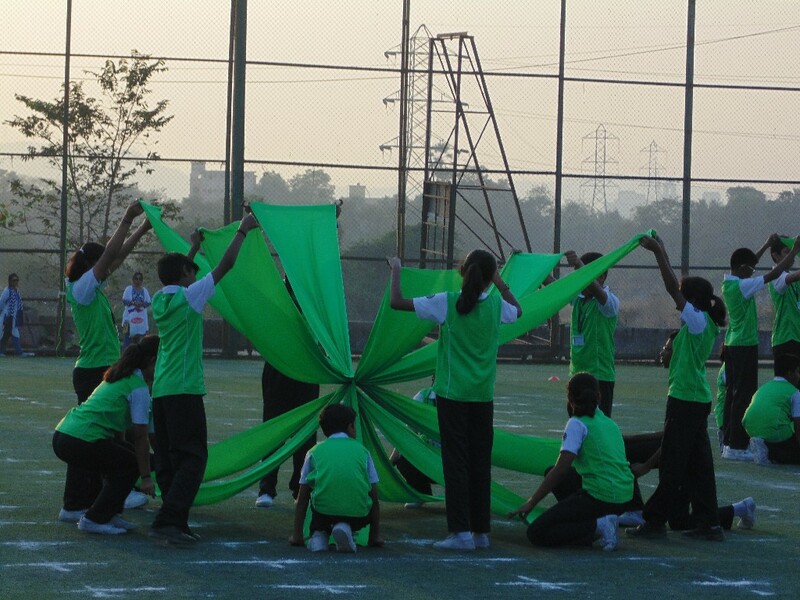 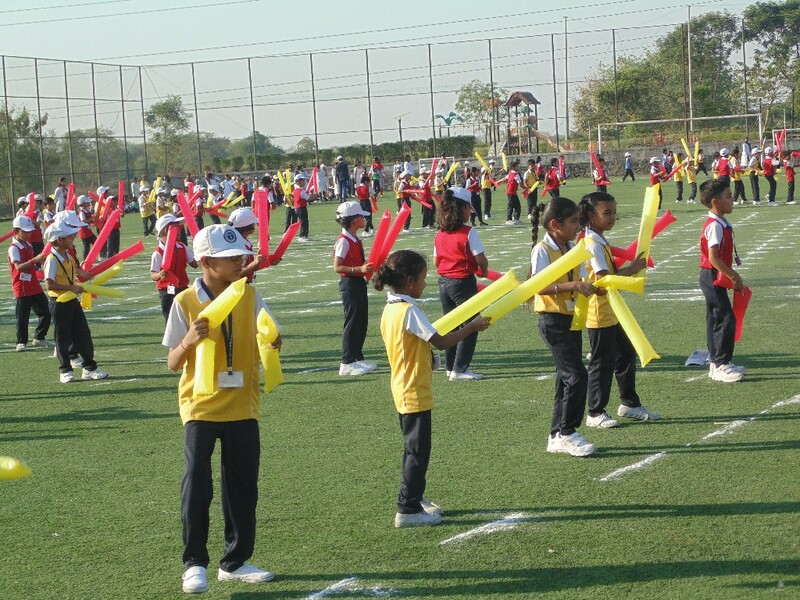 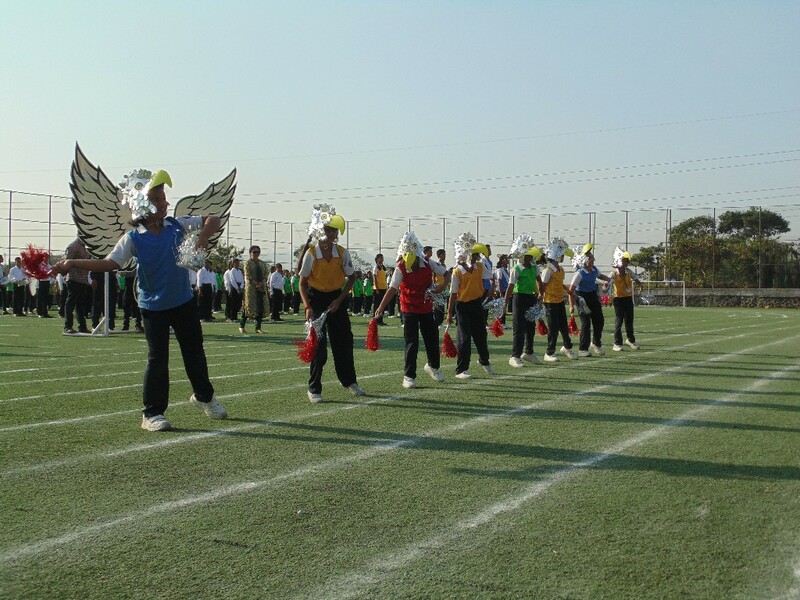 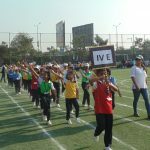 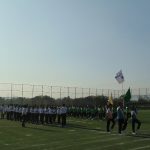 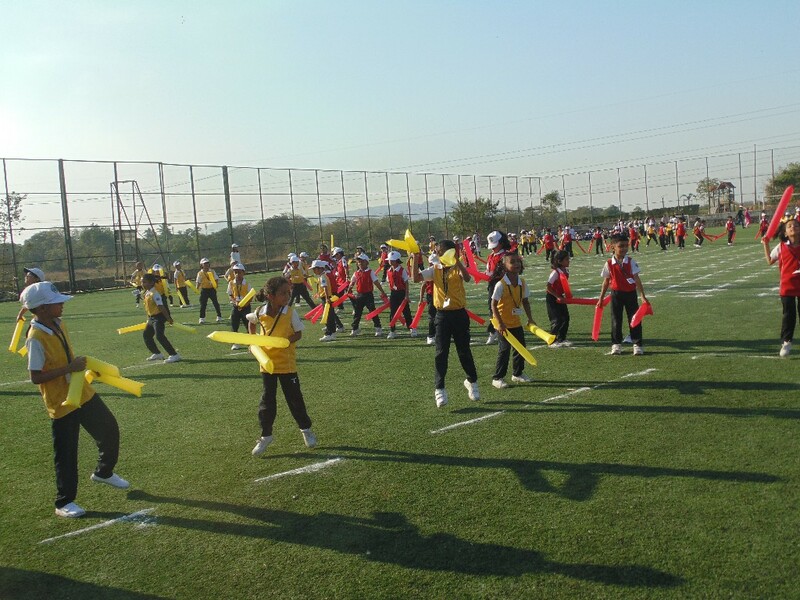 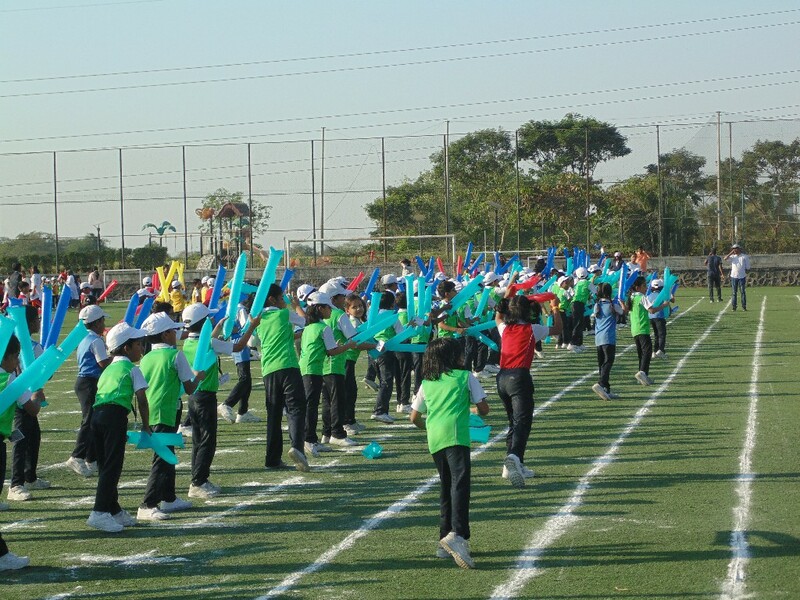 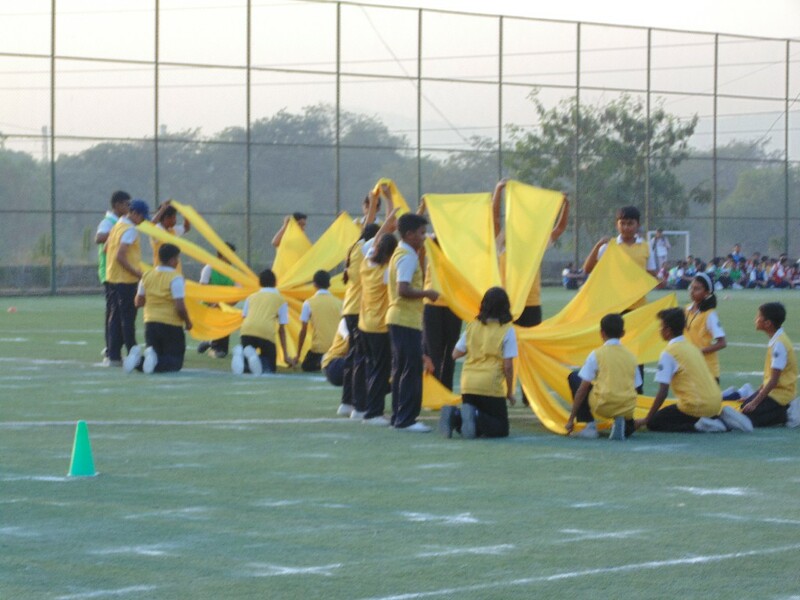 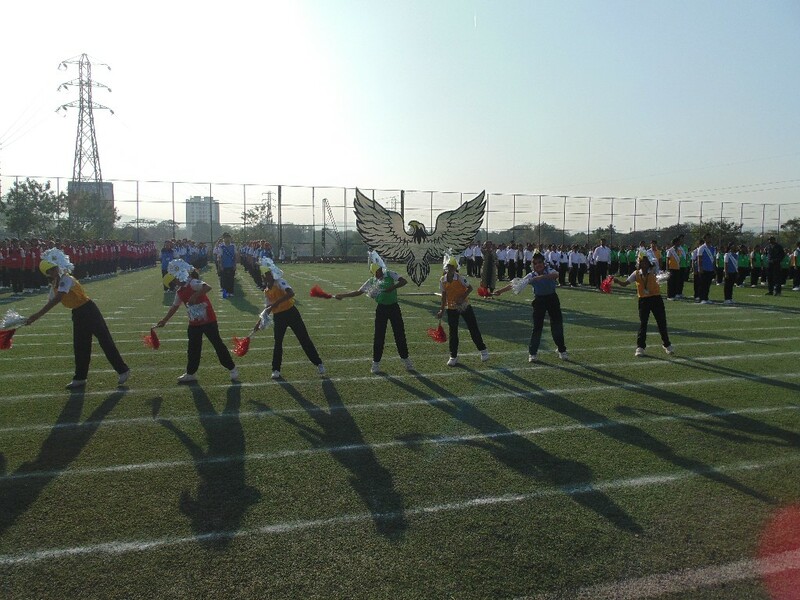 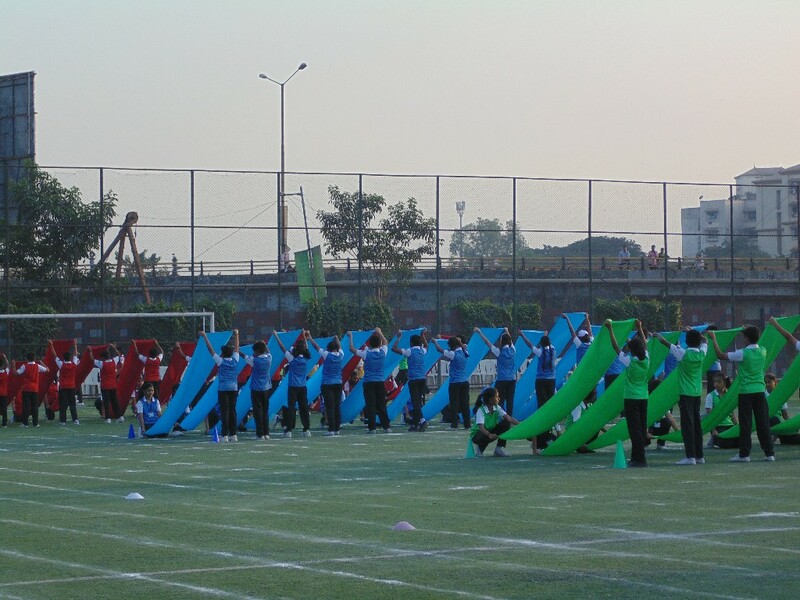 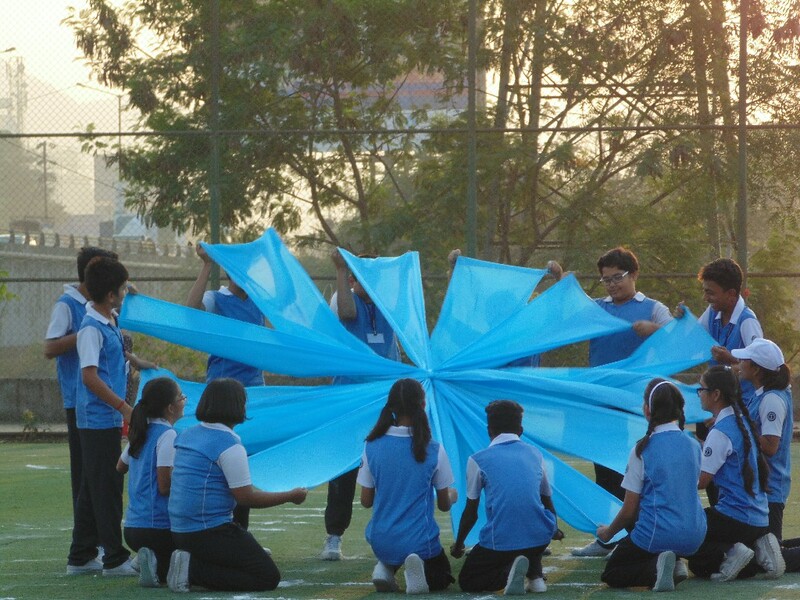 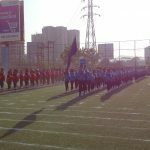 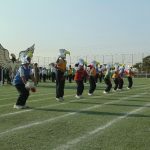 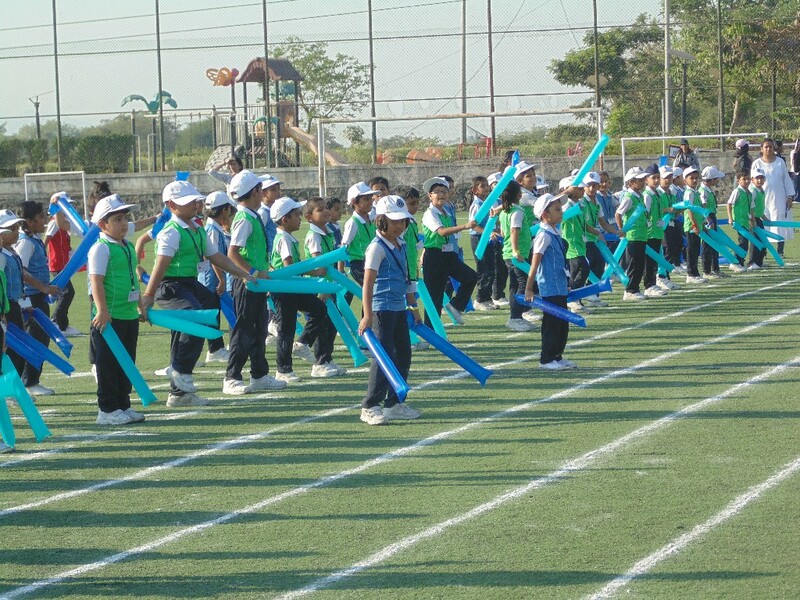 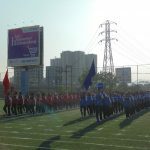 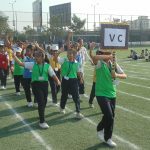 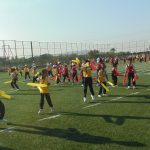 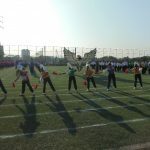 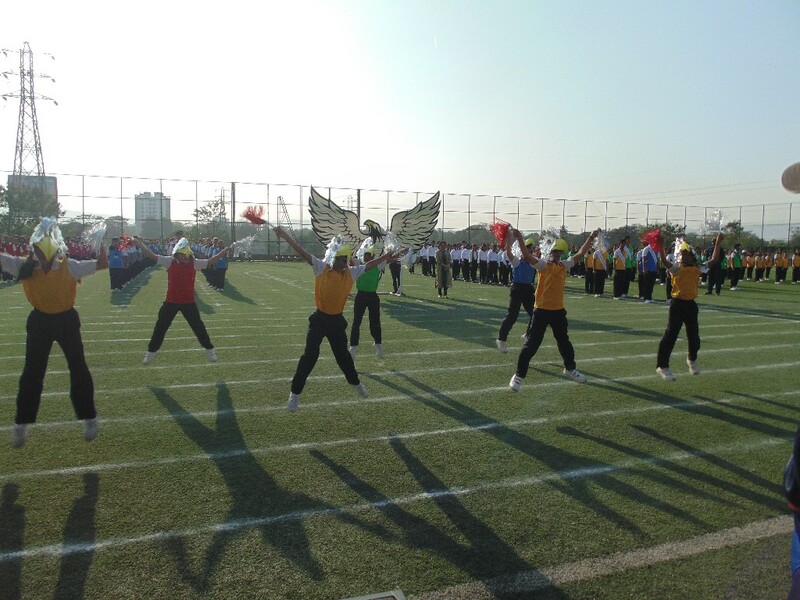 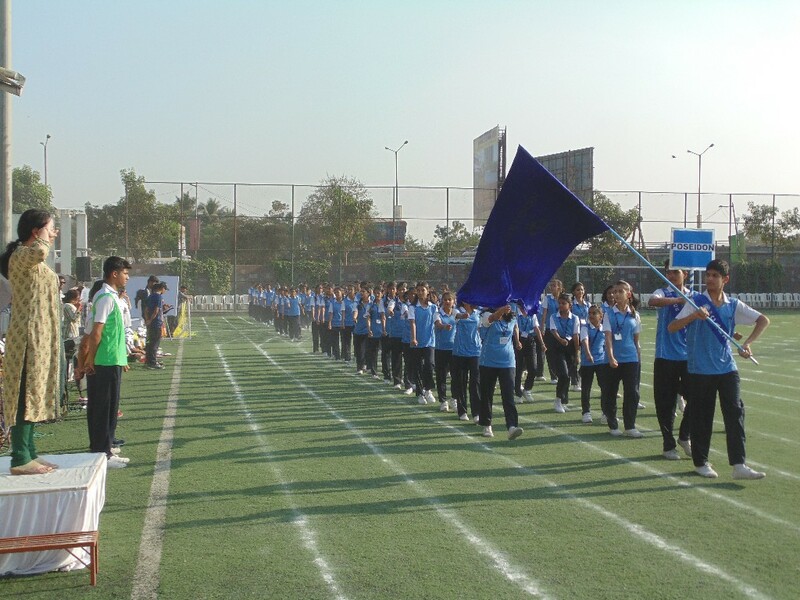 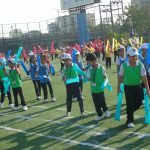 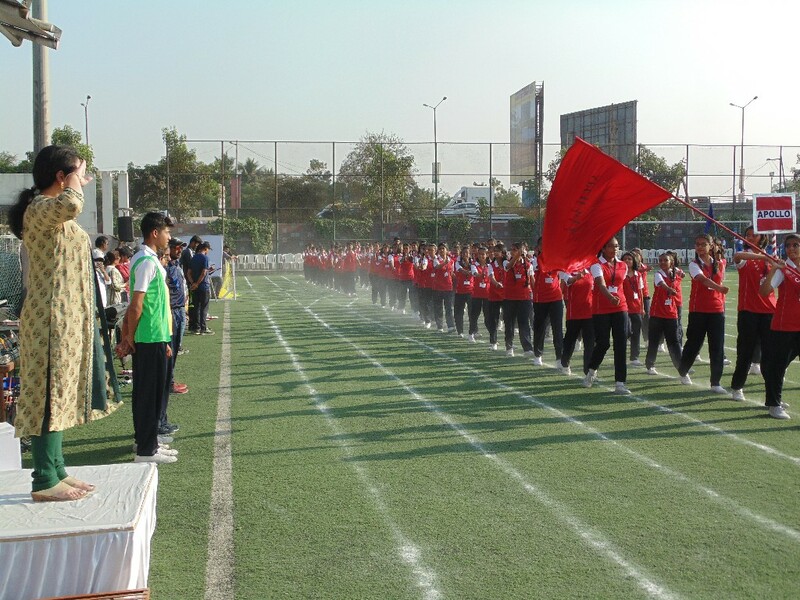 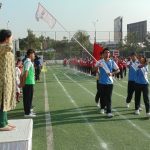 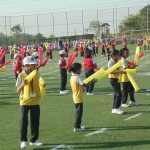 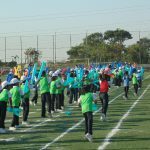 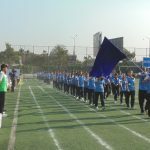 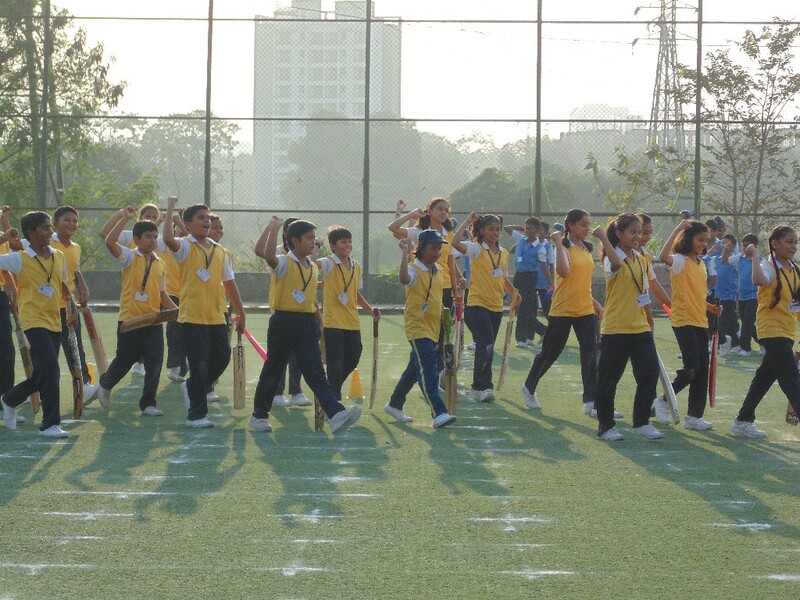 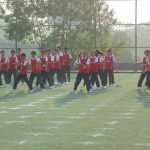 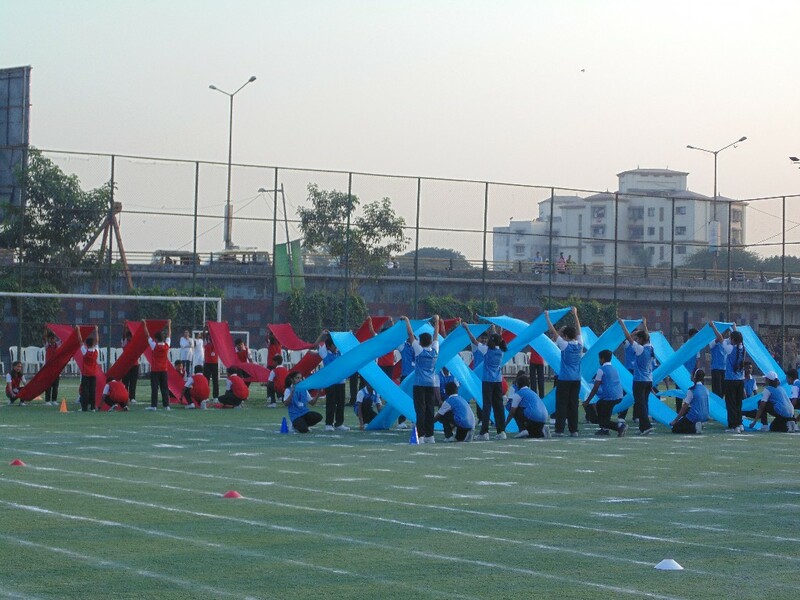 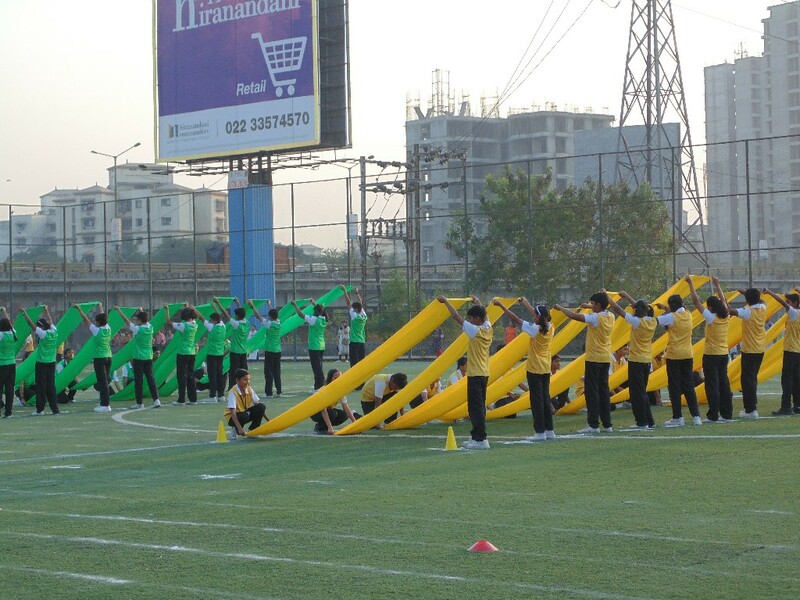 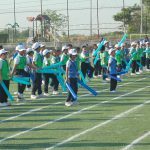 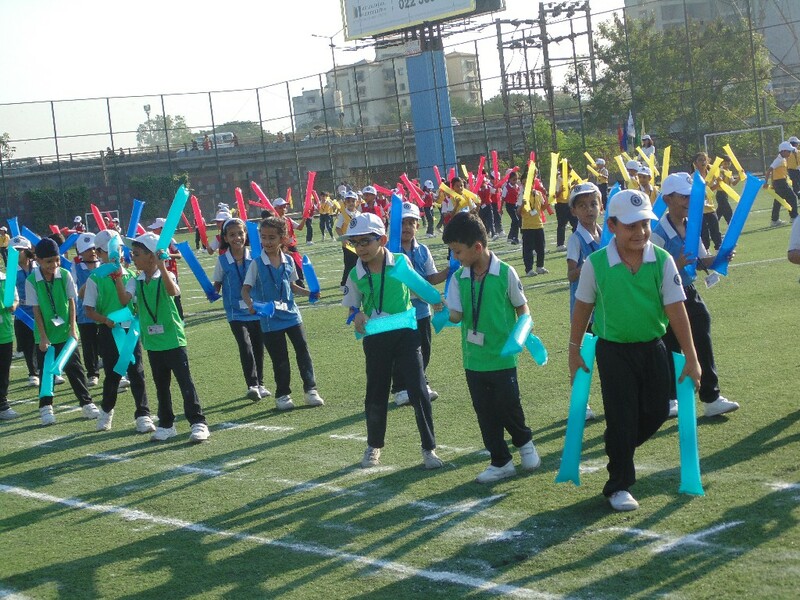 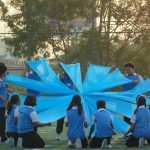 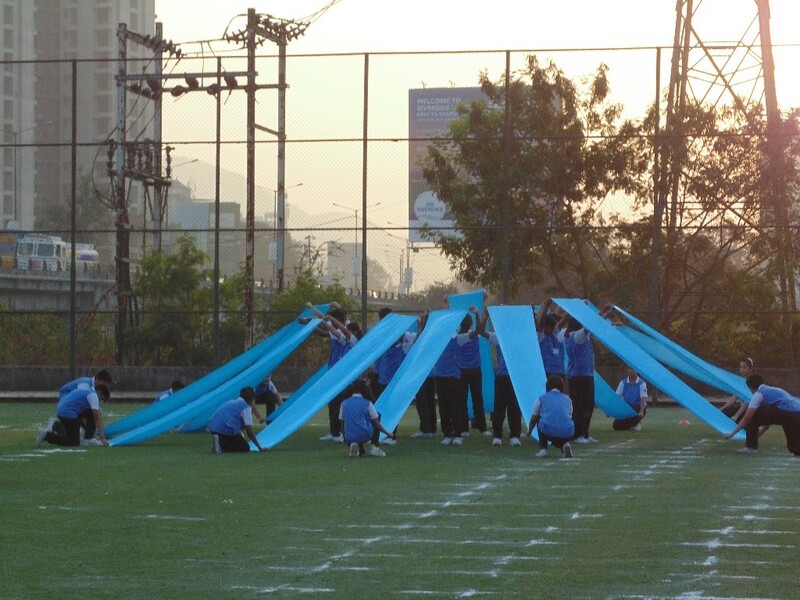 The Best March-Past trophy was given to Poseidon House, who after receiving the award, ran around the field elated, with their House Flag in hand. 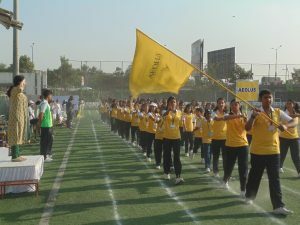 However, it was Zeus House which was awarded the Best House, making their day even more special and truly unforgettable. 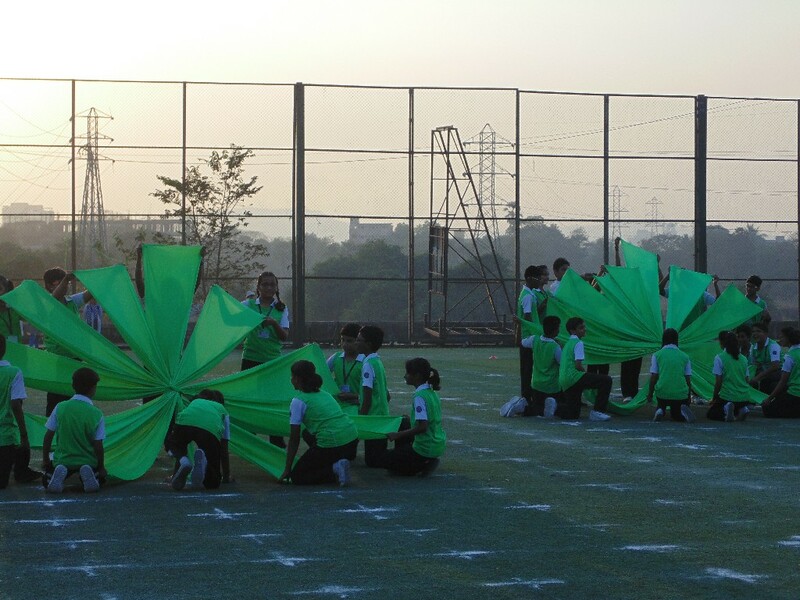 Their Principal concluded the evening by saying “It was a beautiful program that my children put up. 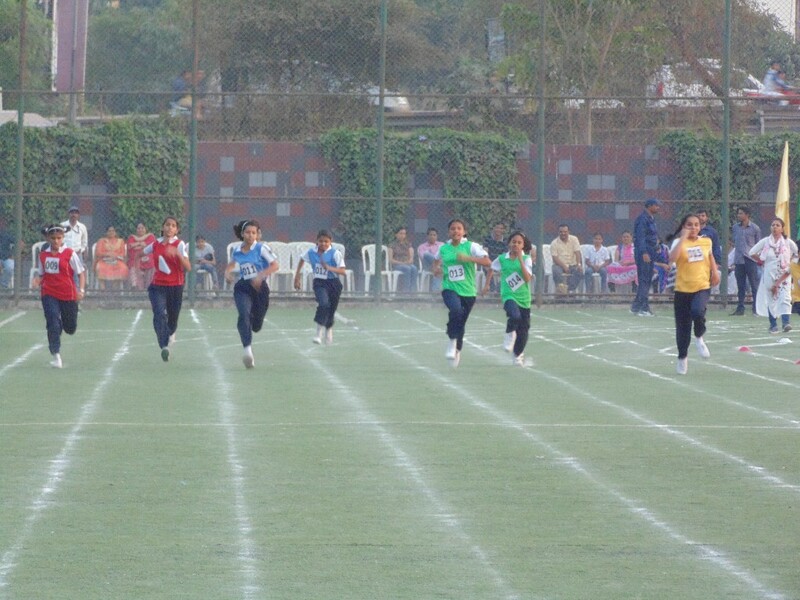 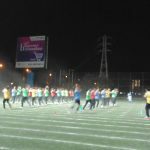 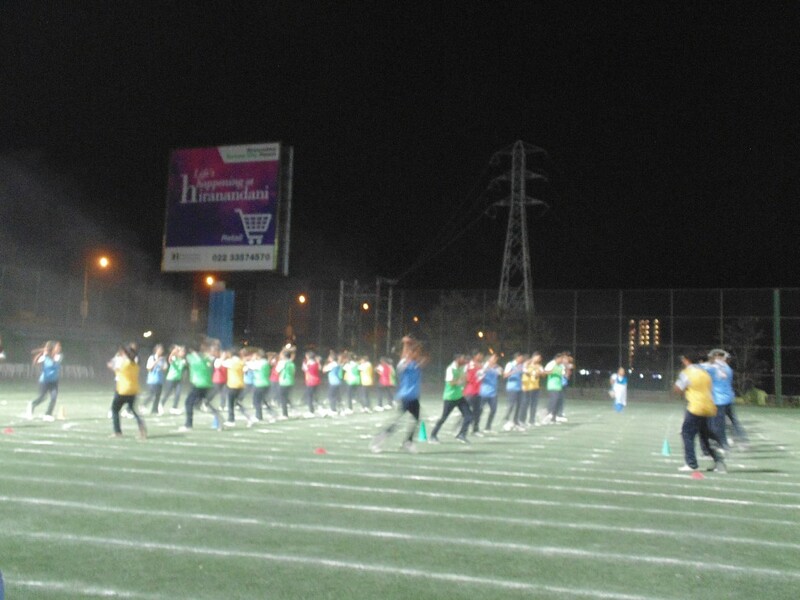 Amazing drills, fabulous races, so much of enthusiasm and vigour… the entire evening was memorable”. 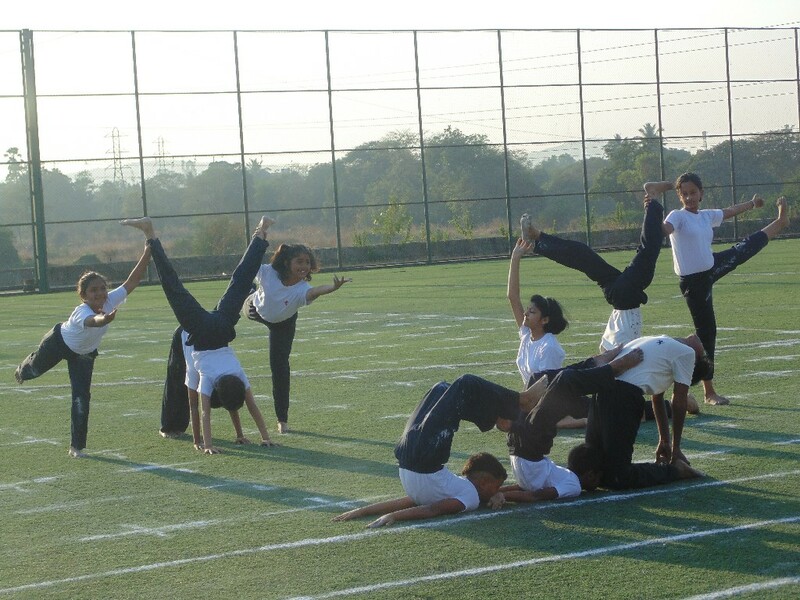 And indeed it was.